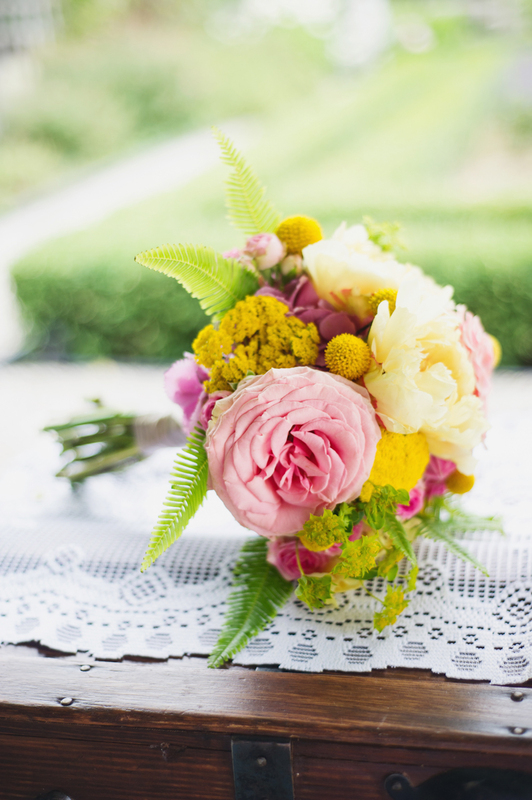 At BOTANY planning and designing flowers is our passion. 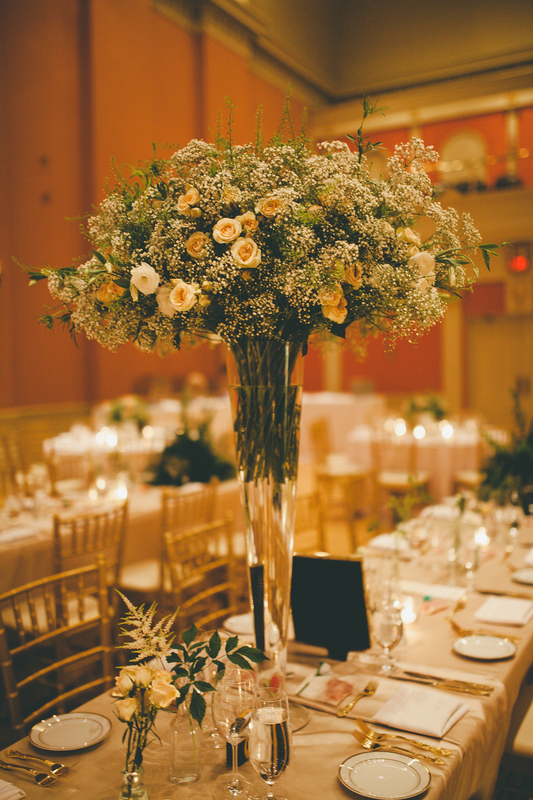 We understand that your wedding flowers should reflect your personal style and love for each other. 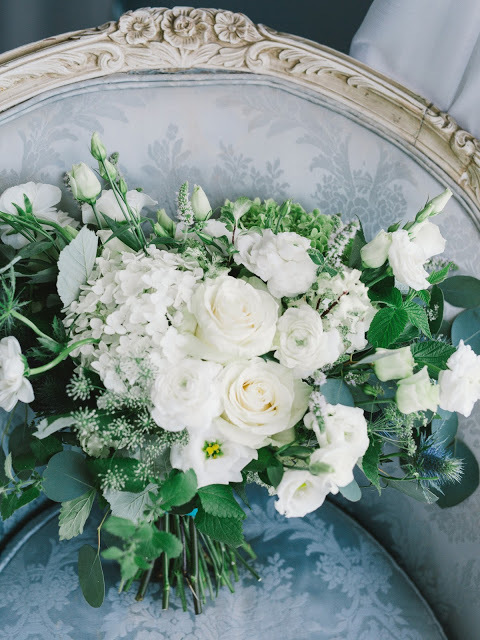 We are keen to help you express all of this loveliness through exceptional and bespoke floral design. 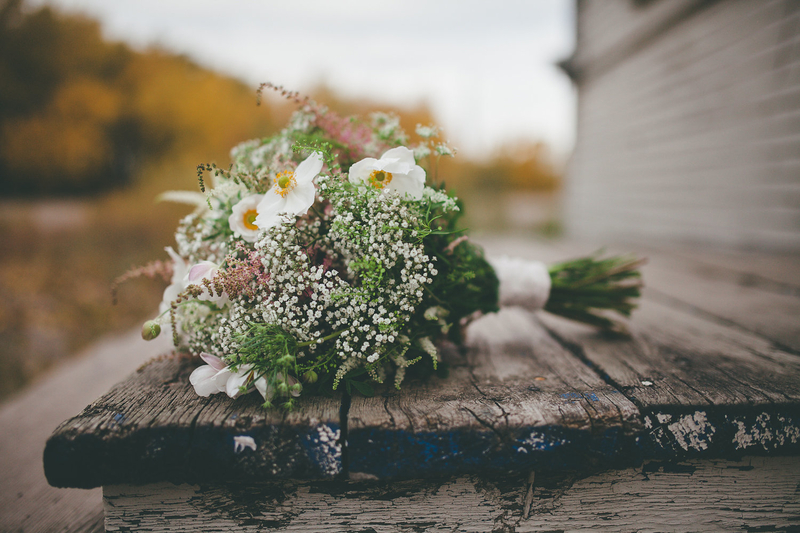 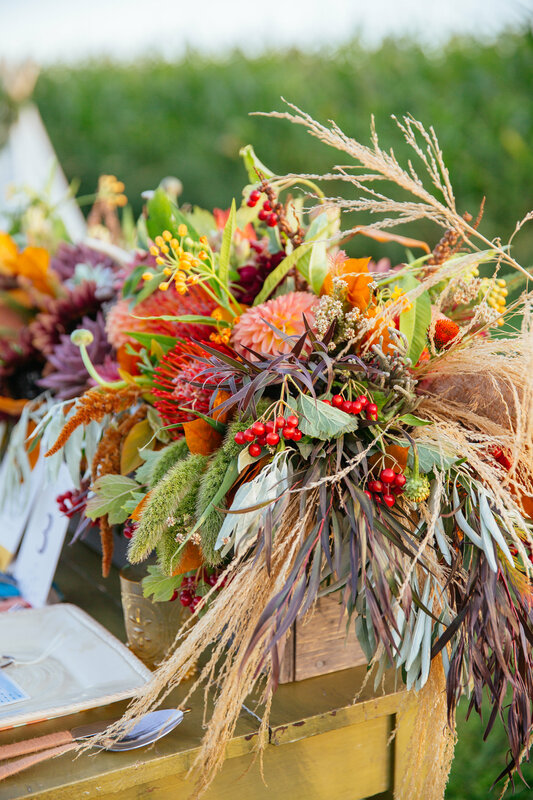 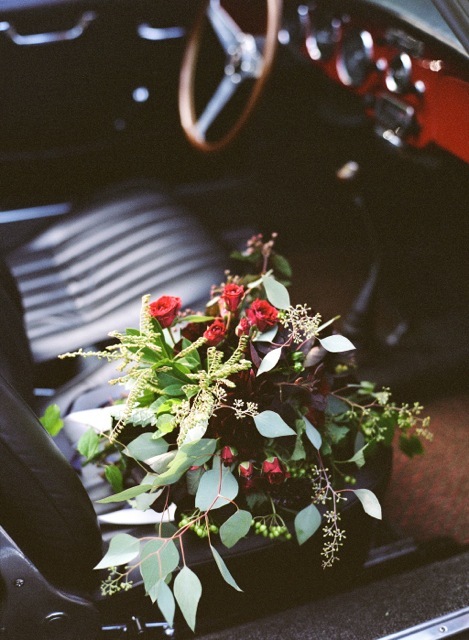 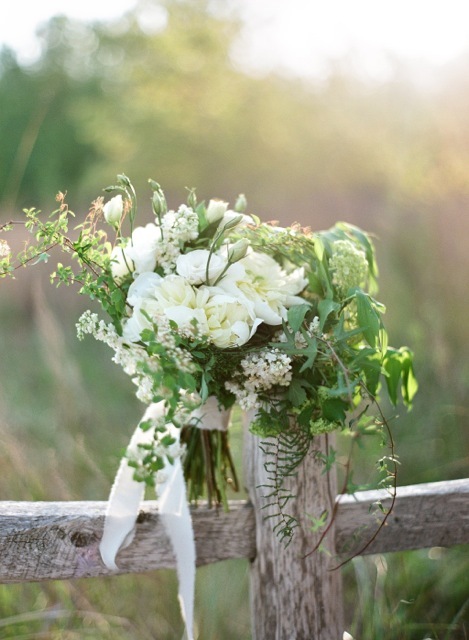 We specialize in Local & Green Options for weddings, by hand-picking local and seasonal flower and plant varieties. 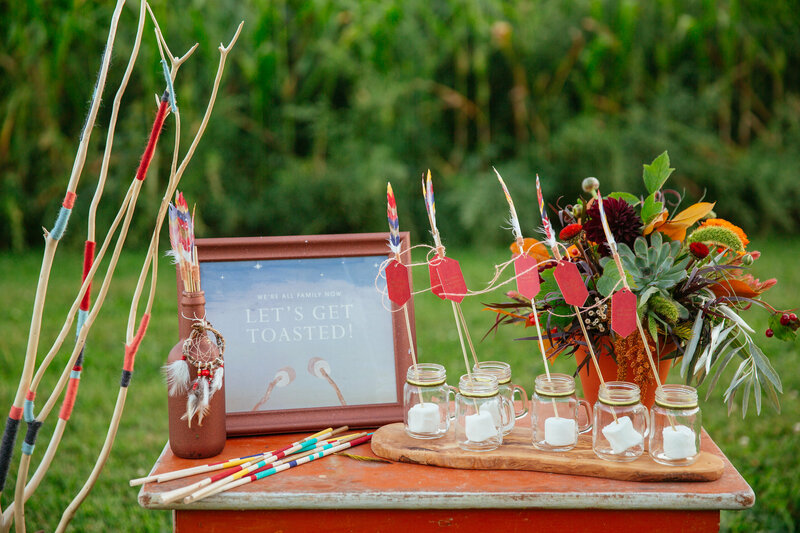 We offer Event Styling. 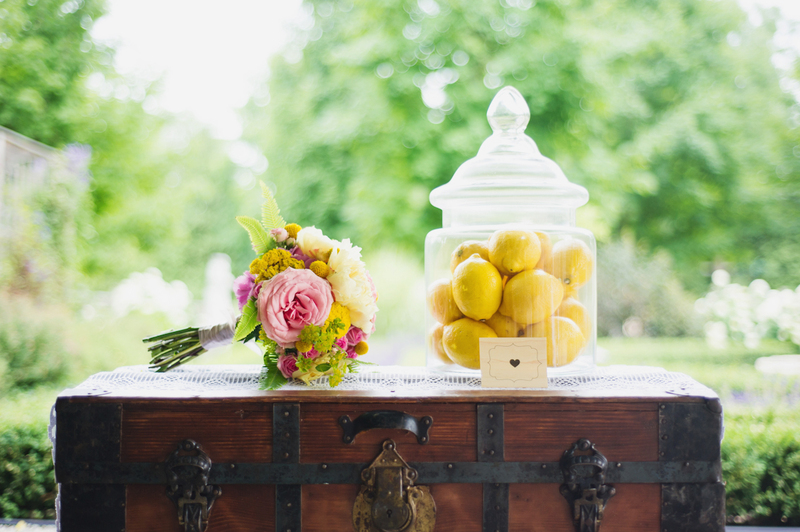 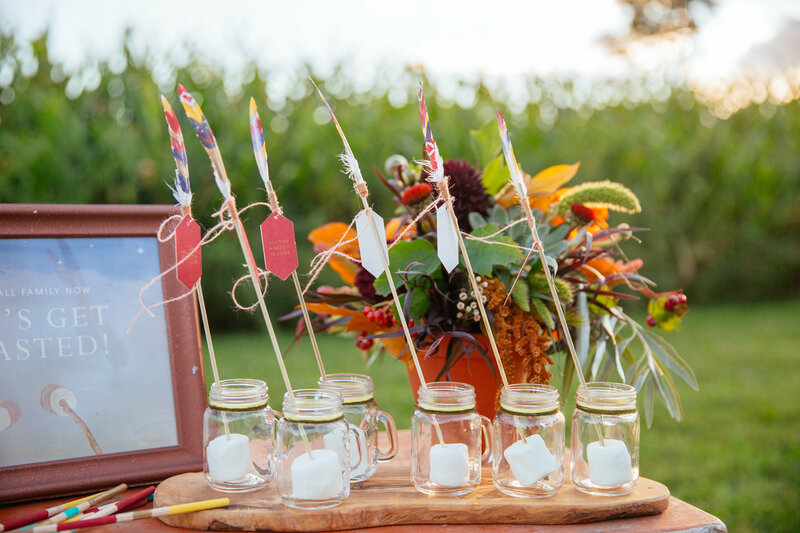 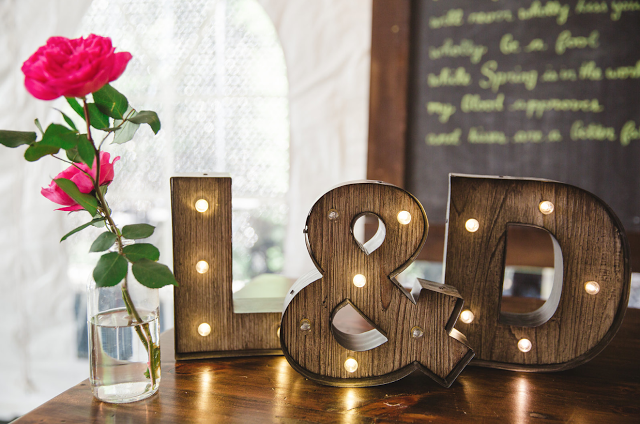 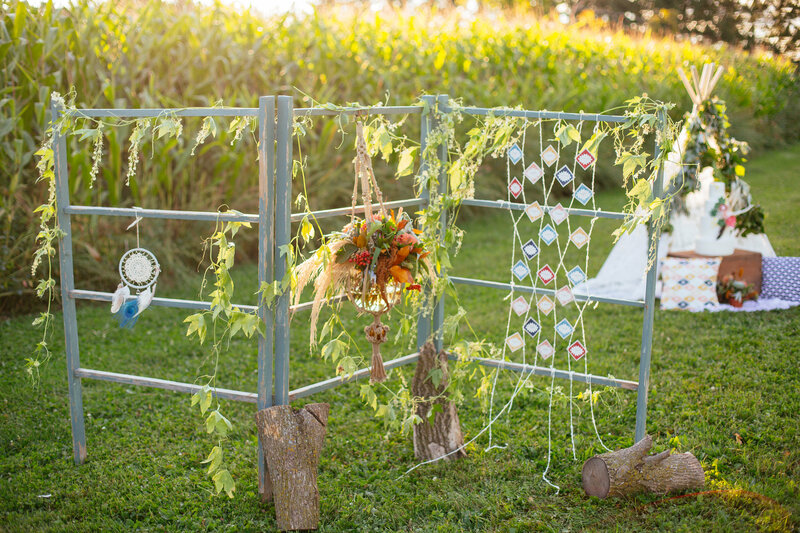 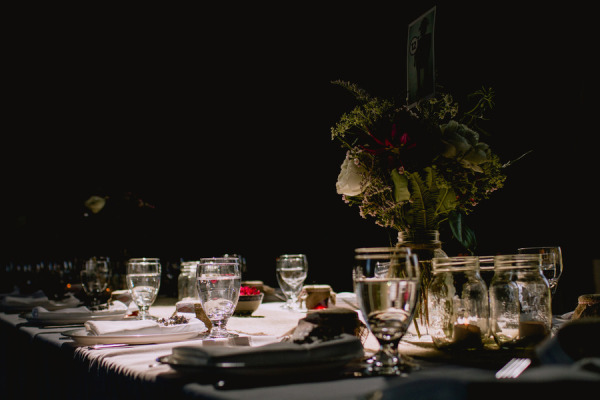 Have us create custom pieces and locate props for your one-of-a-kind wedding. 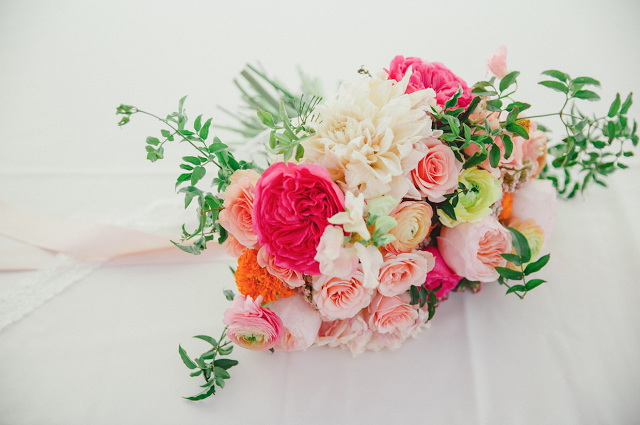 Most importantly, we make sure that YOU, our lovely client, are thrilled with your stunning wedding flowers! 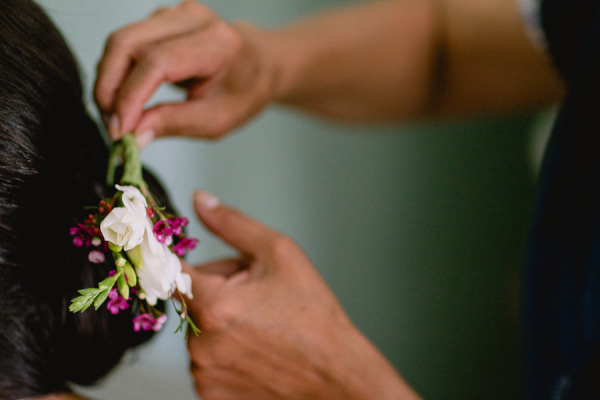 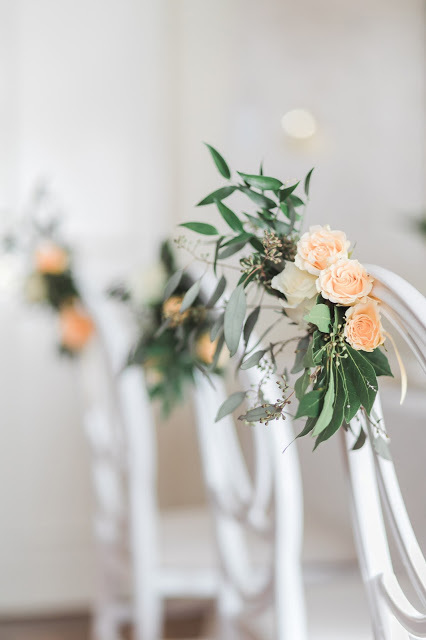 Let us take care of your complete floral décor on your big day. 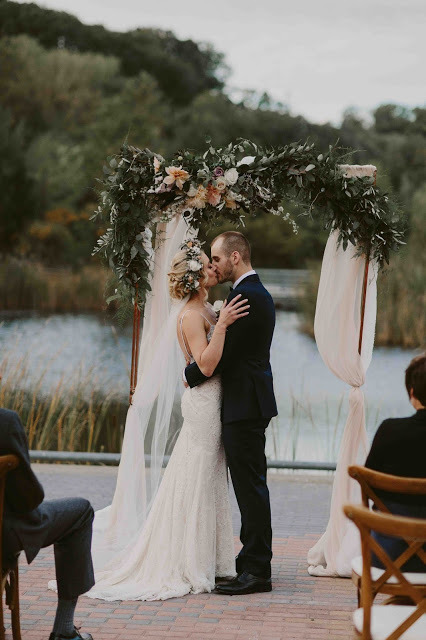 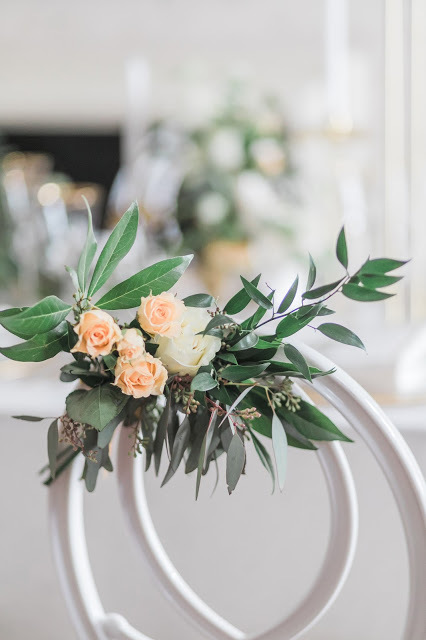 This can include any combination of Bouquets, Boutonnières, Corsages, Centrepieces, Tablescapes, Candles, Ceremony Flowers, Garlands, Installations, and more. 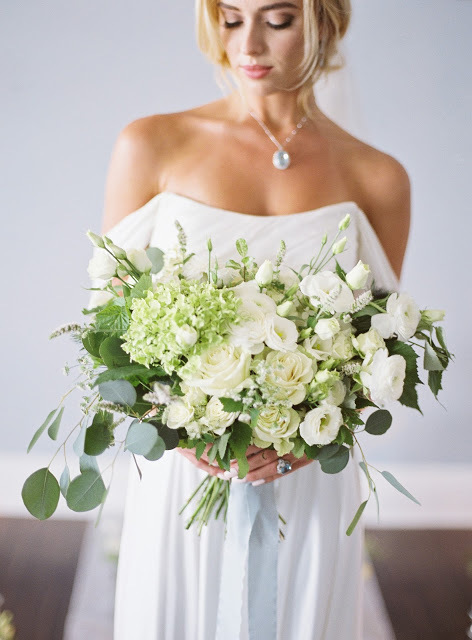 Full service wedding floral design starts at a minimum of $2,000, not including tax, delivery and set-up fees. 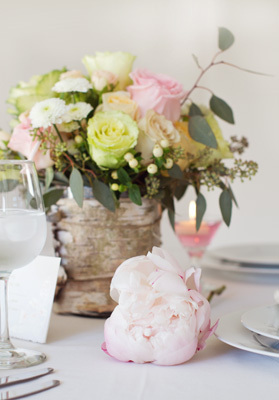 Wedding consultations are by appointment only. 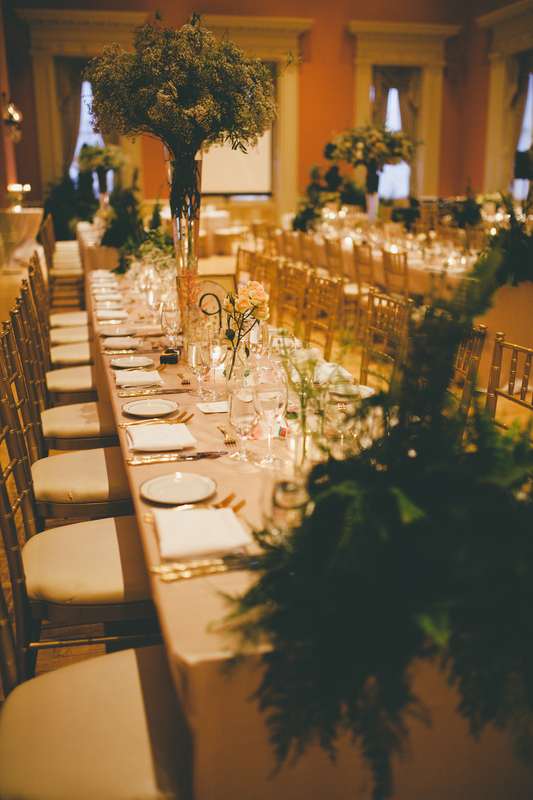 Contact Us today as we book limited weddings to ensure quality design. 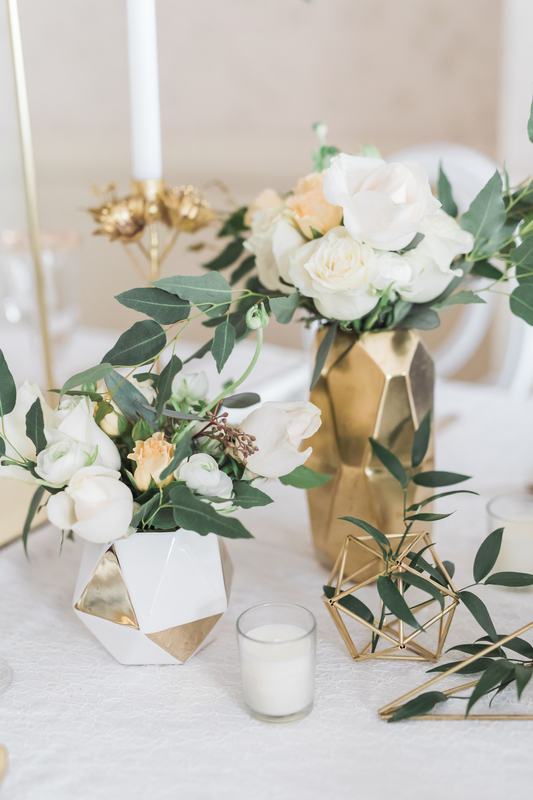 Our initial consultation will give us the opportunity to sit down and get to know you, while also giving you the chance to share with us your must-haves and your flower dreams. 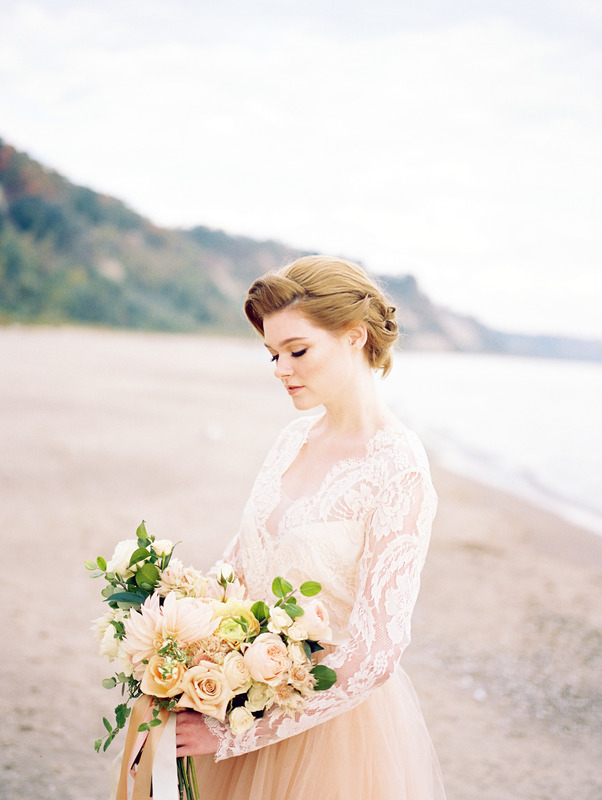 We take this hour to look through images, jot down notes, consider logistics, and brainstorm. 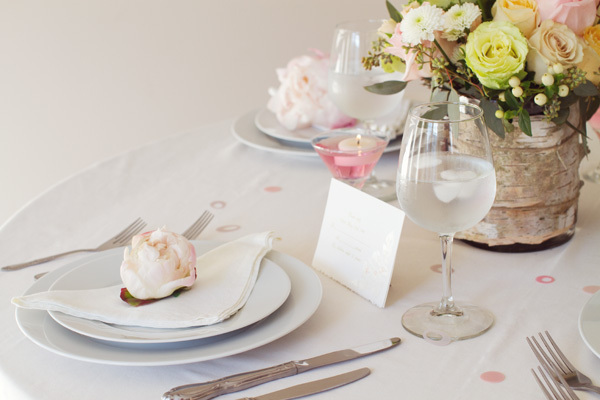 We also ask that you come prepared with an idea of a budget, so that we know how we can service you best. 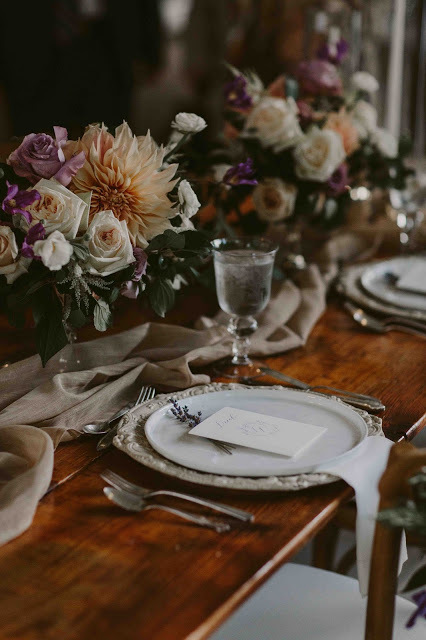 What to expect during your consultation - We will discuss floral elements that suit your taste, the season, chosen venue, and colour palette. 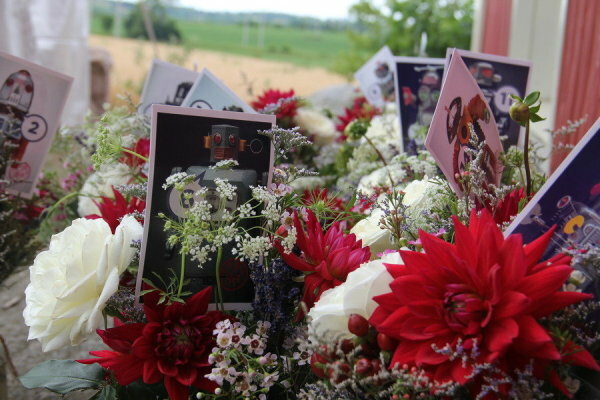 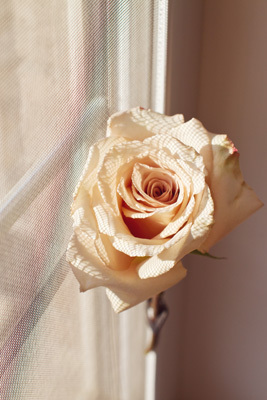 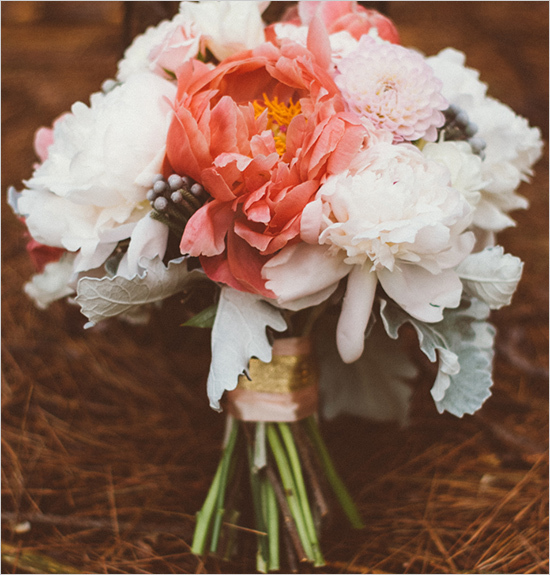 It would be helpful to bring any photographs of floral styles or flower types you may have in mind. 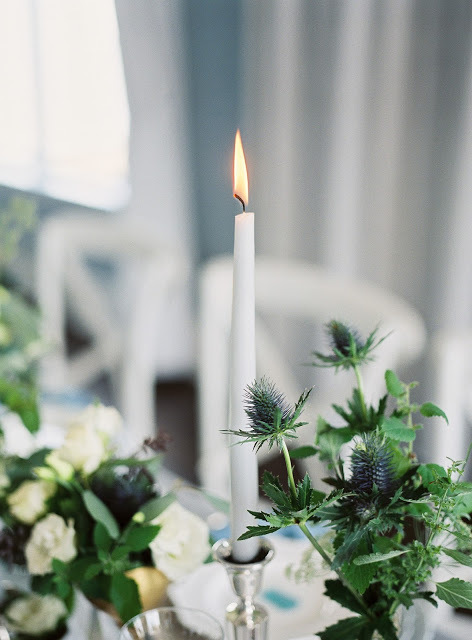 If you haven't made many decisions yet, don't fret, we can help get you inspired! 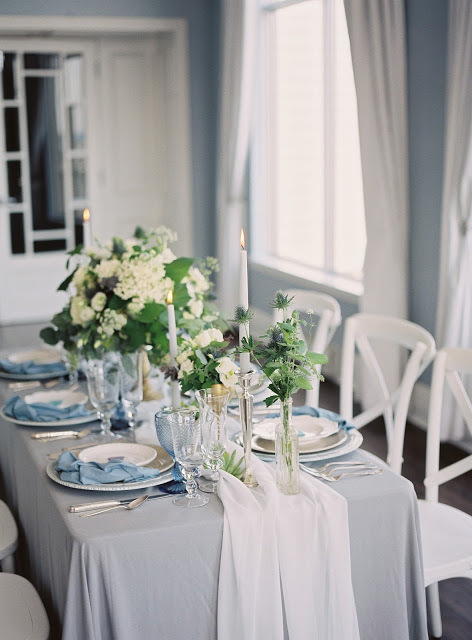 After we meet, our design team will discuss ideas you've given us to create one, cohesive design especially for you! 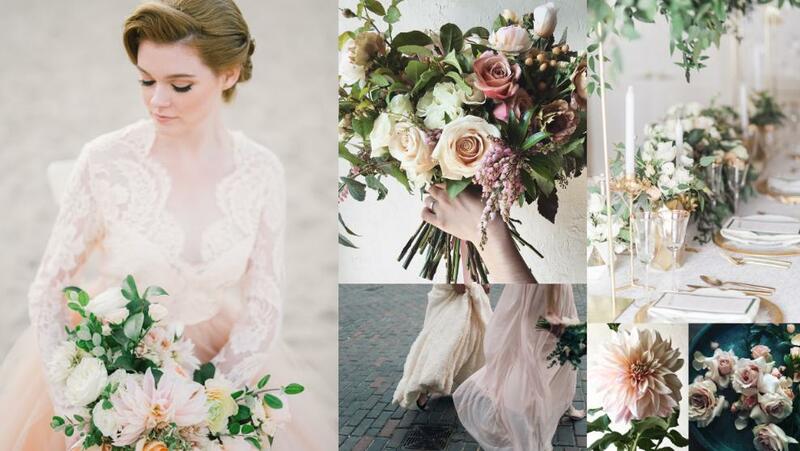 We will present you with a floral design proposal for your wedding that was inspired by you and created by us. 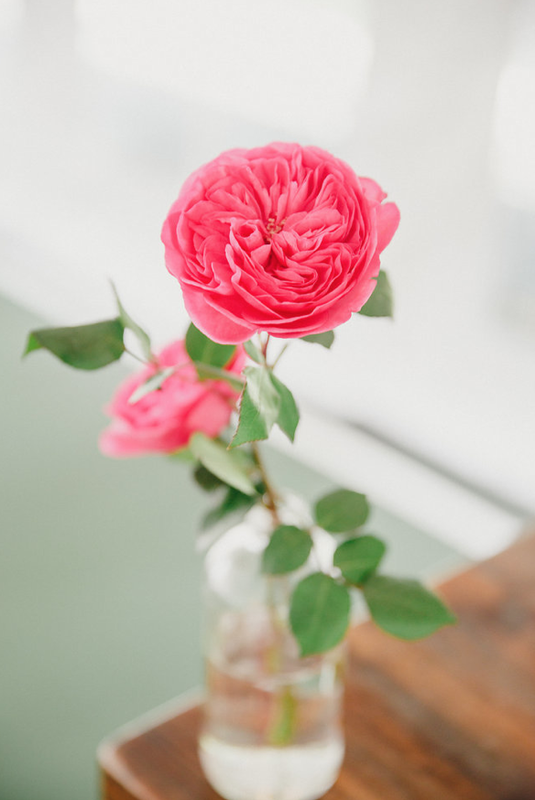 We will email you with a quote and from there we'll figure out what works and what doesn't; what you simply can't live without and what may not be as crucial. 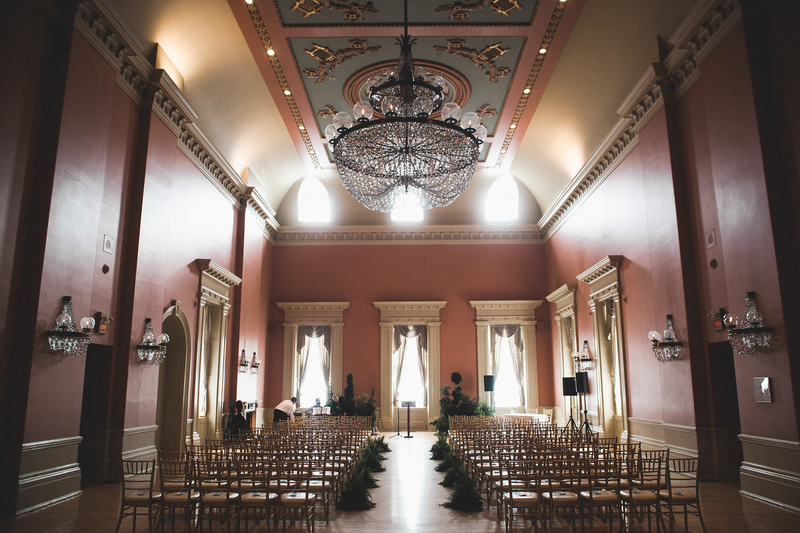 We get the design to a place where we all can leave in excitement and anticipation. 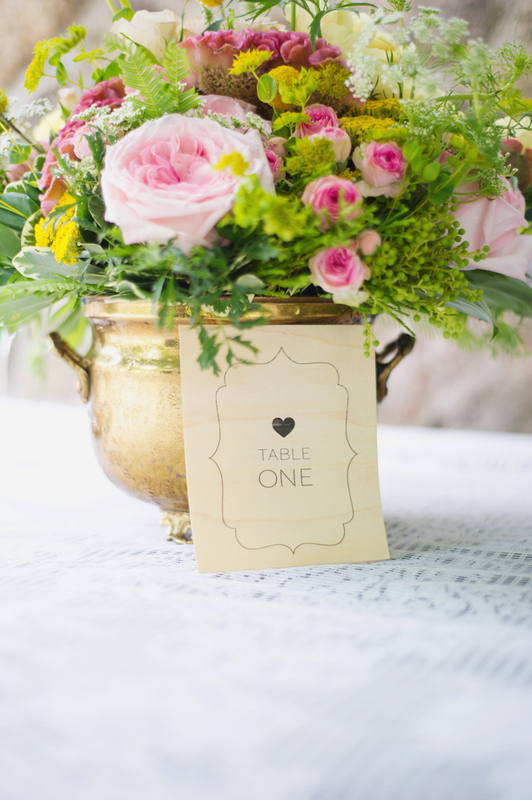 Based upon your consultation, a customized quote will be prepared for you. 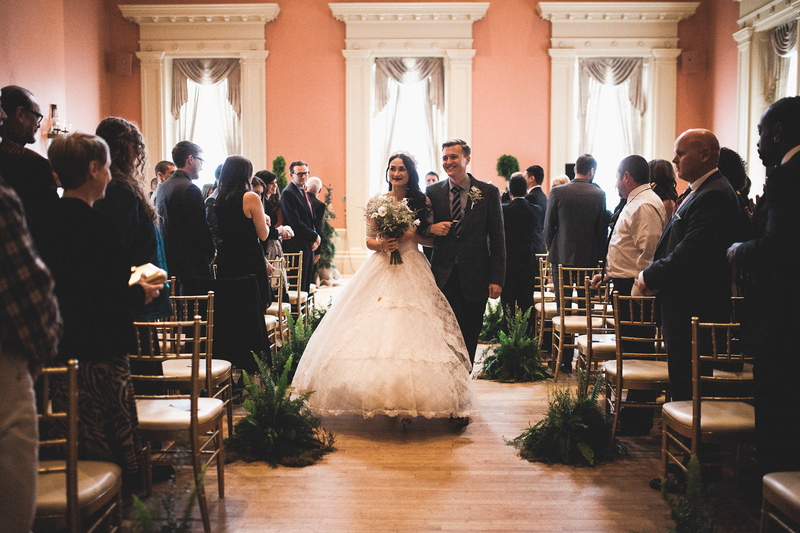 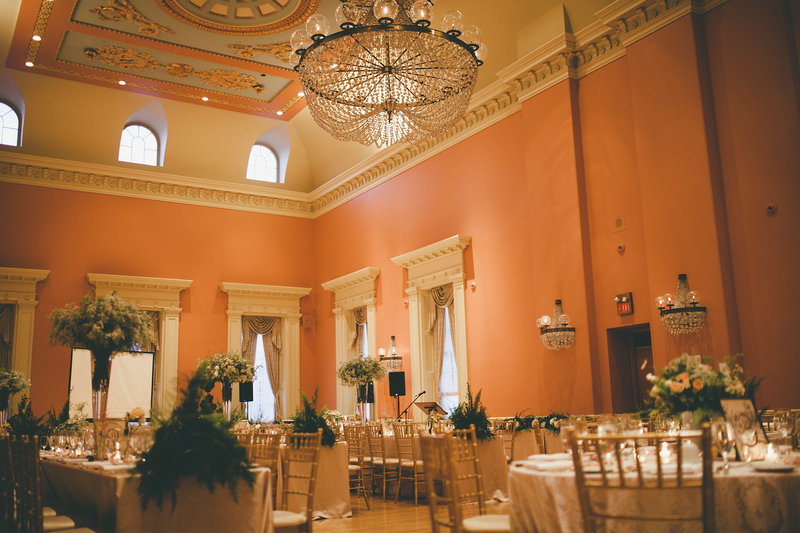 For your convenience, read our Wedding Pricing Guide for general pricing. 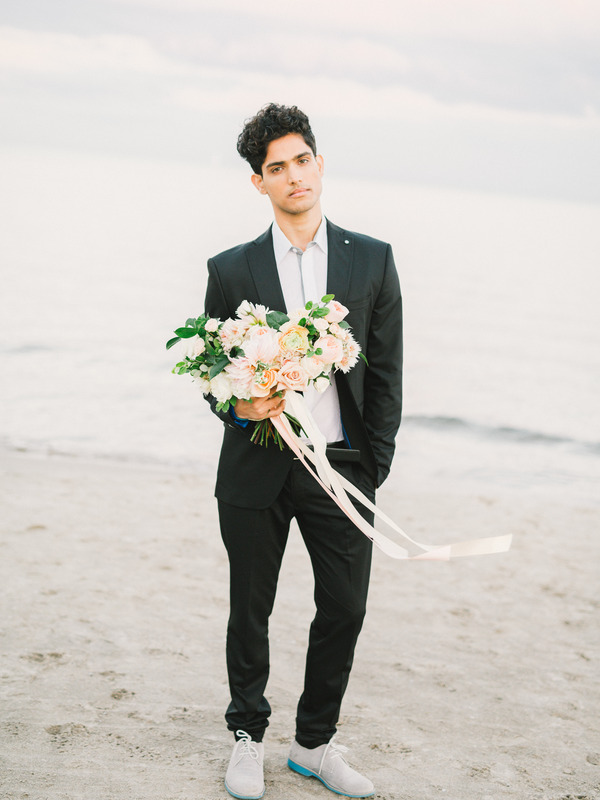 In order for us to pencil your date in our calendar, a 50% retainer is required to secure our services for your wedding date. 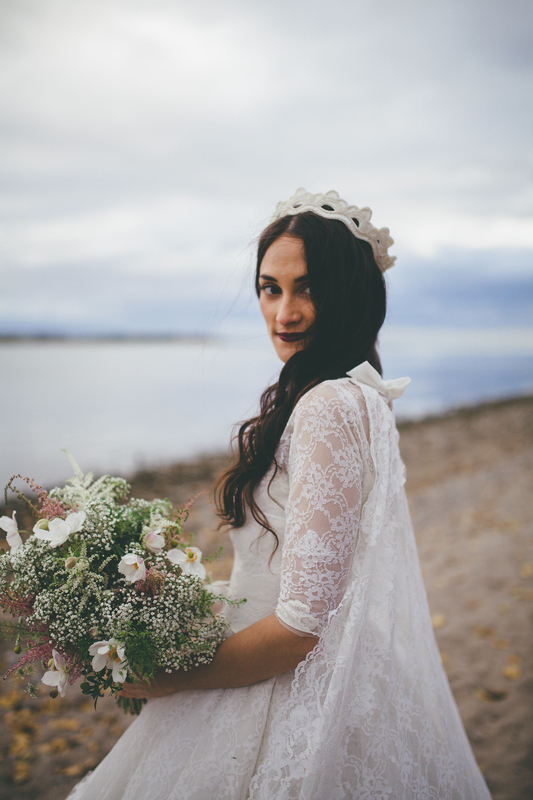 This retainer allows us to commit to you our time. 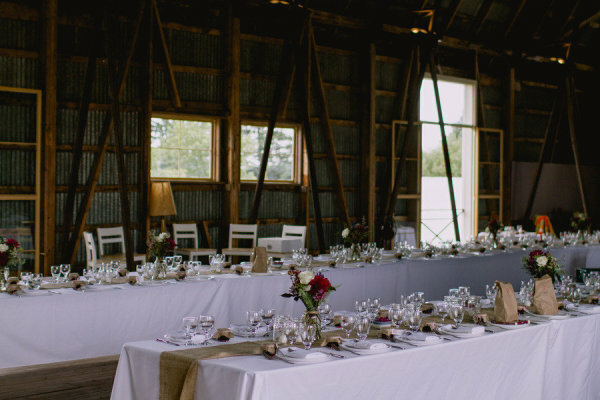 Your booking can be made within the due date set on your quote and until then we cannot ensure date availability or ongoing design consultations. 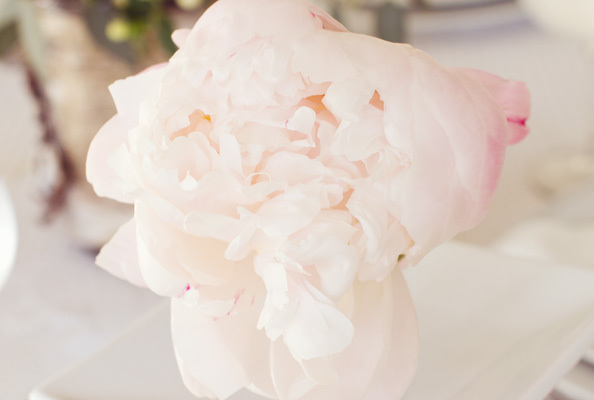 For the smaller scale wedding, not requiring full service, we offer ‘À La Carte’ Floral. 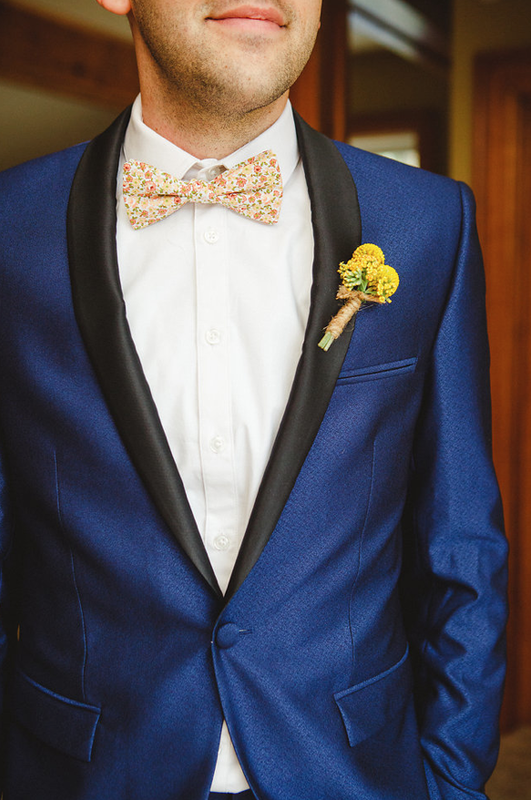 For our couples who do not need a custom design for the wedding, but still want Botany's signature floral look. 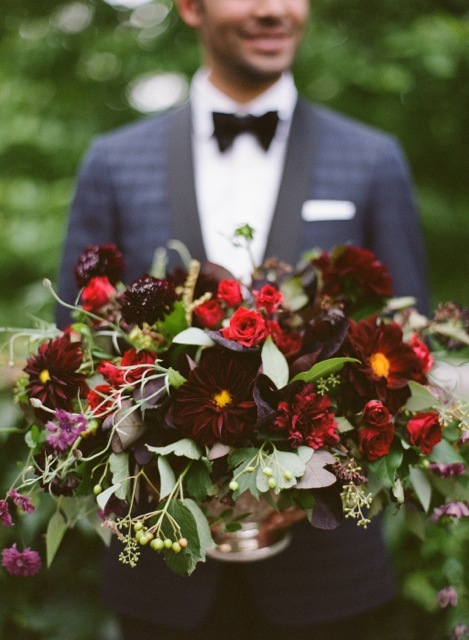 Options include Bridal Party Bouquets, Boutonnières, Corsages, Centrepieces, Garland, and Ceremony Flowers. 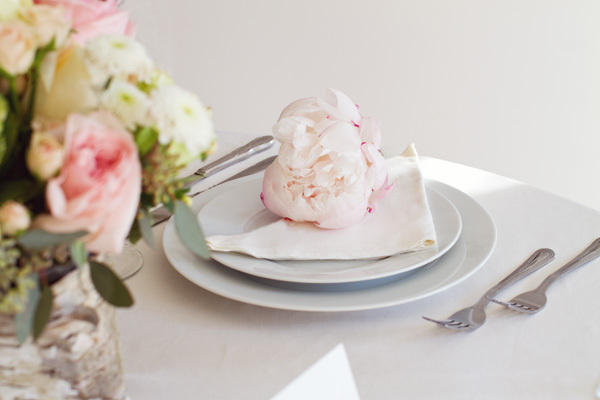 ‘À La Carte’ orders can be scheduled for picked up from our studio or for delivery in Toronto or throughout the GTA. 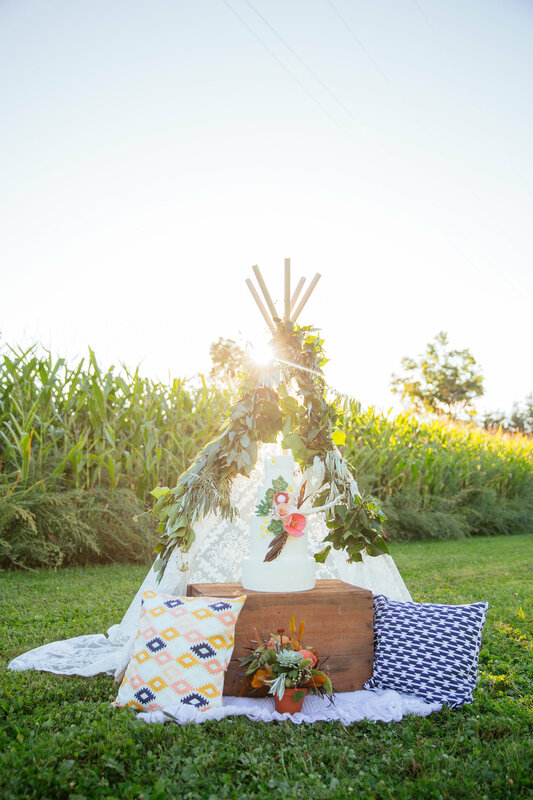 Set-up is not available. 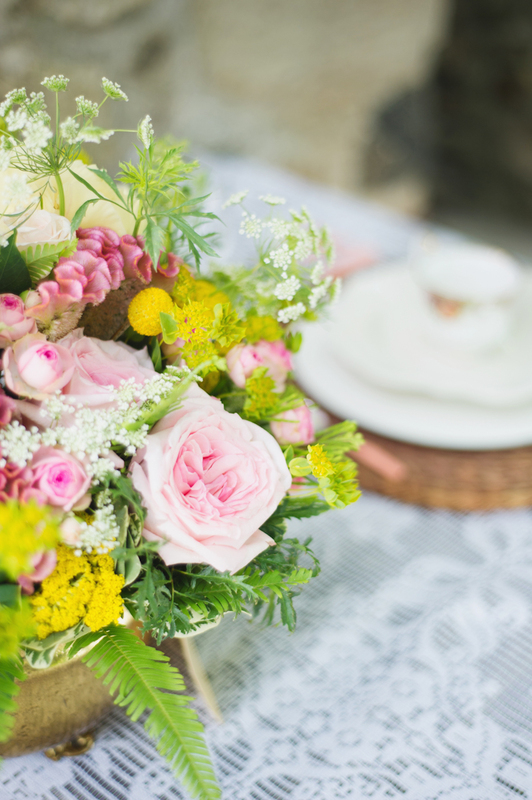 There is no minimum purchase for ‘À La Carte’ Floral. 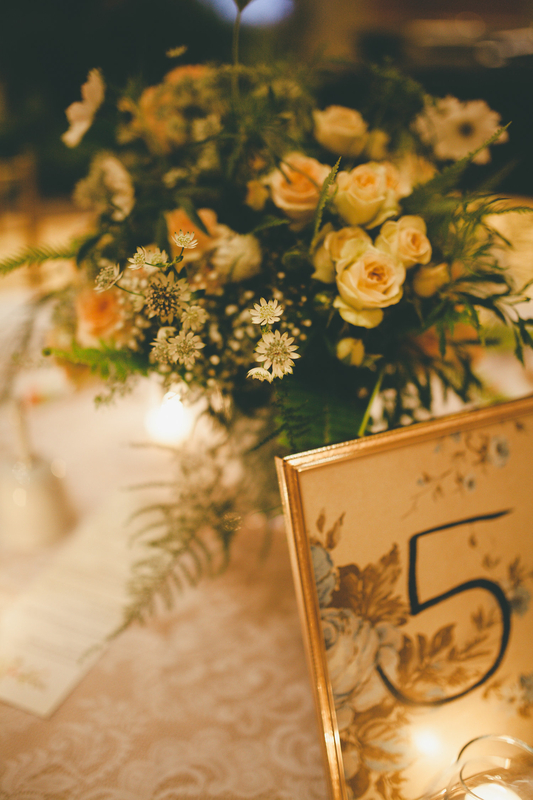 Browse our ‘À La Carte’ Wedding Menu and Order Online. 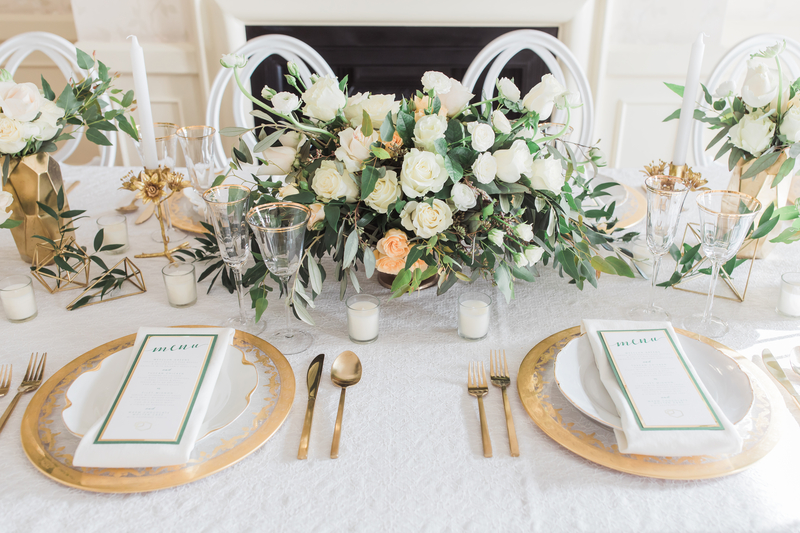 This greenery-filled dream wedding with ivory and gold details was featured recently on WedLuxe. 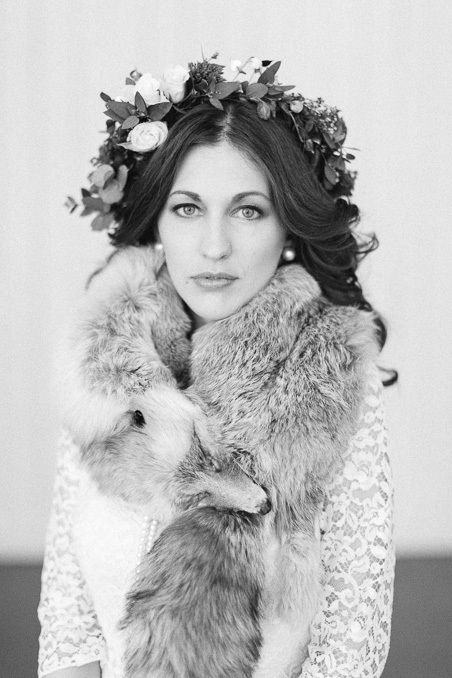 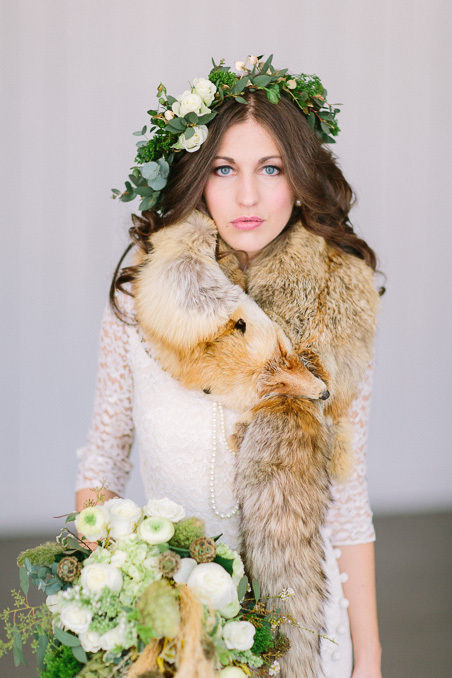 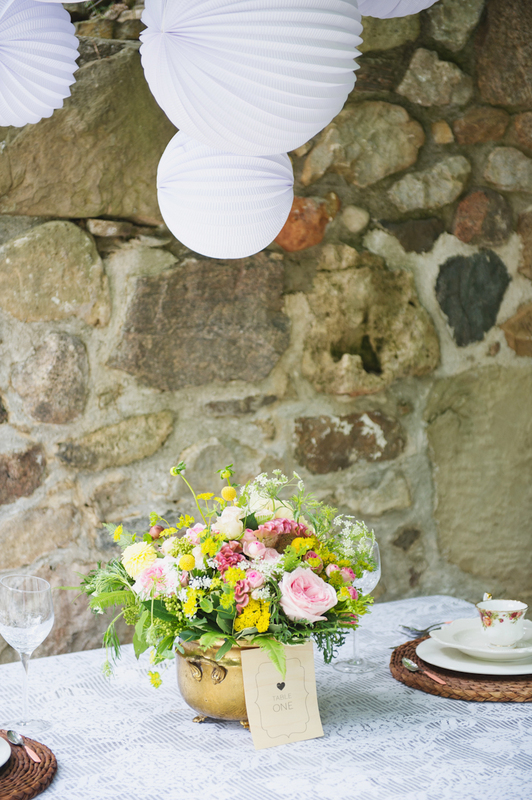 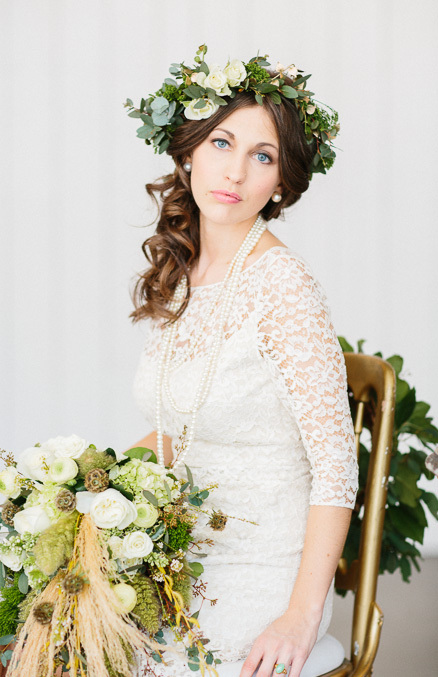 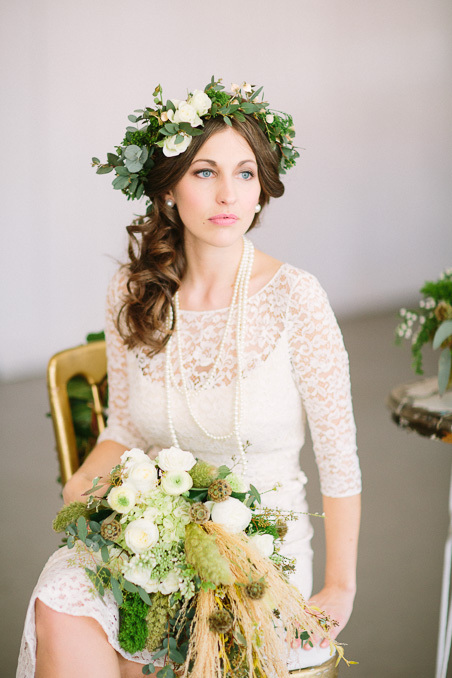 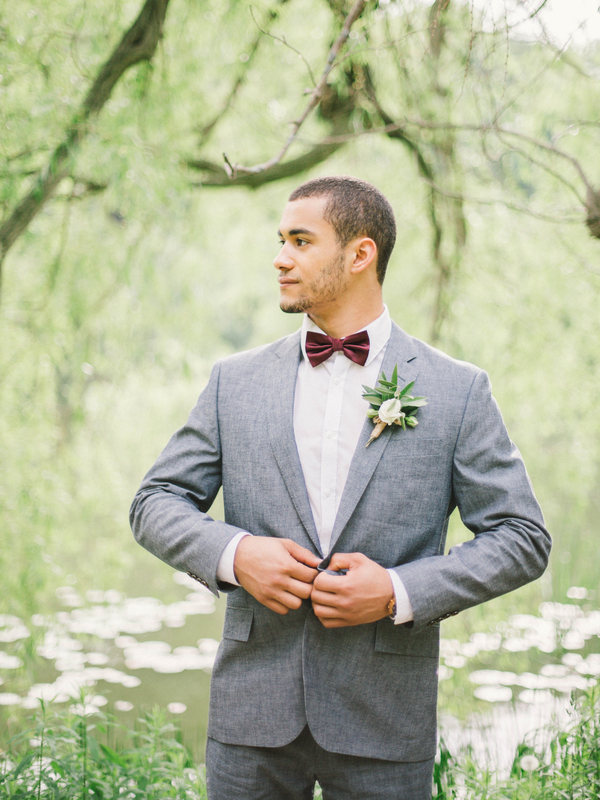 A juxtaposition of modern chic and vintage romance is at the forefront of this styled shoot. 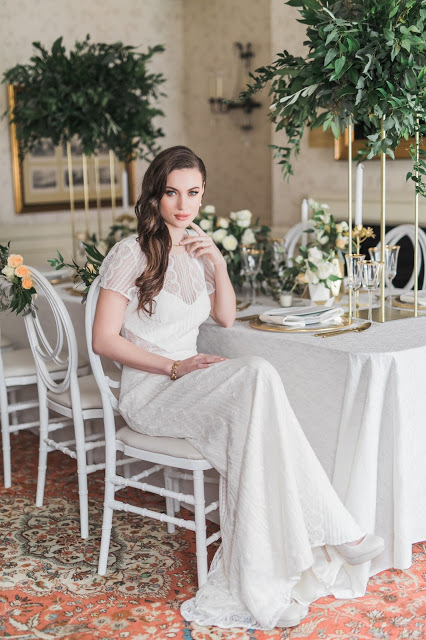 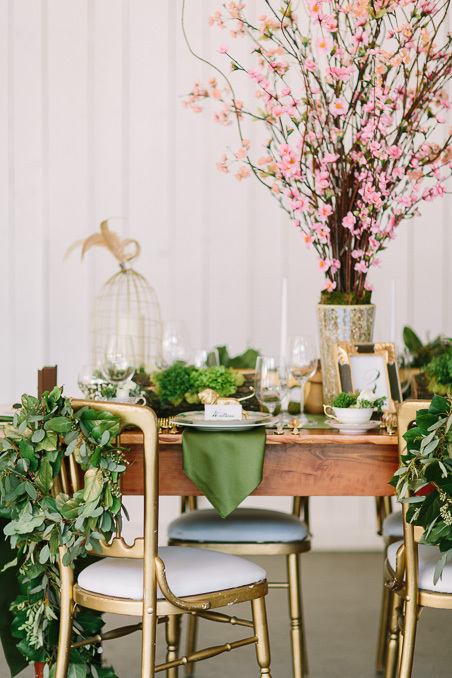 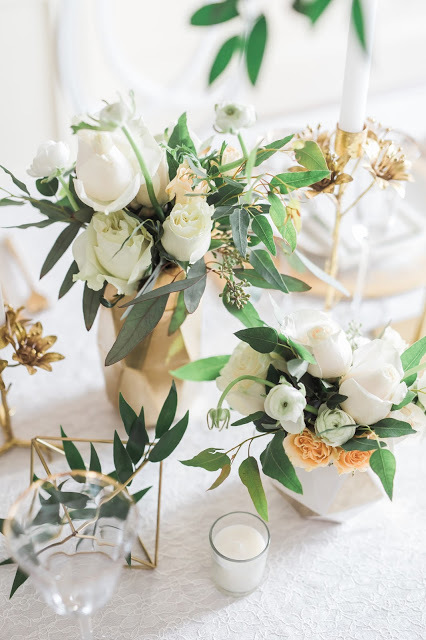 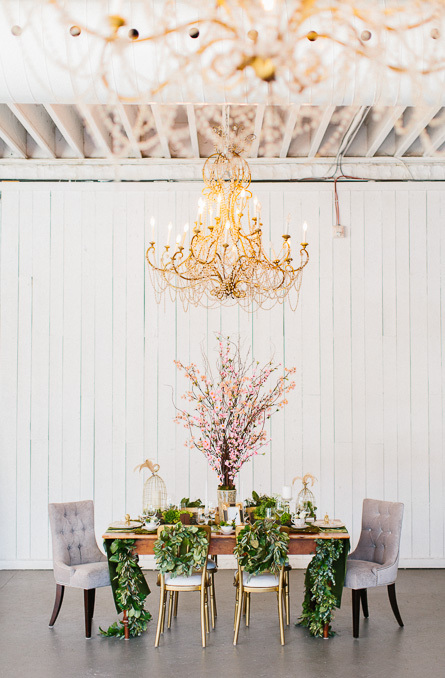 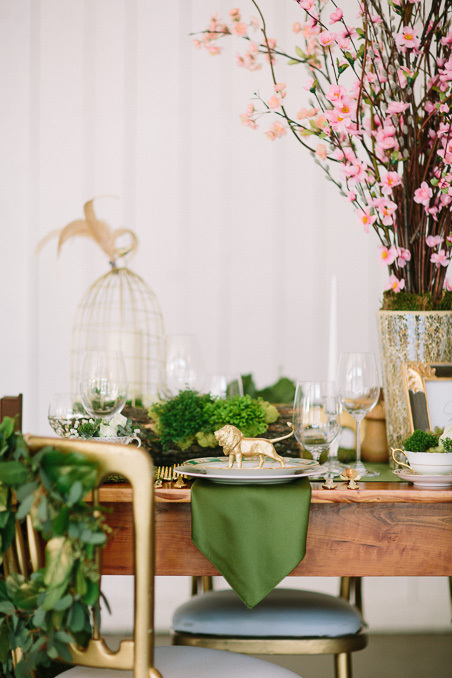 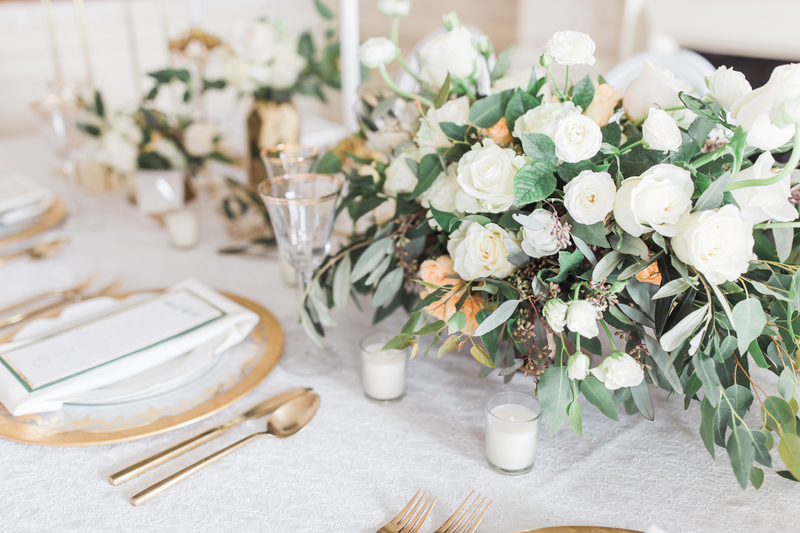 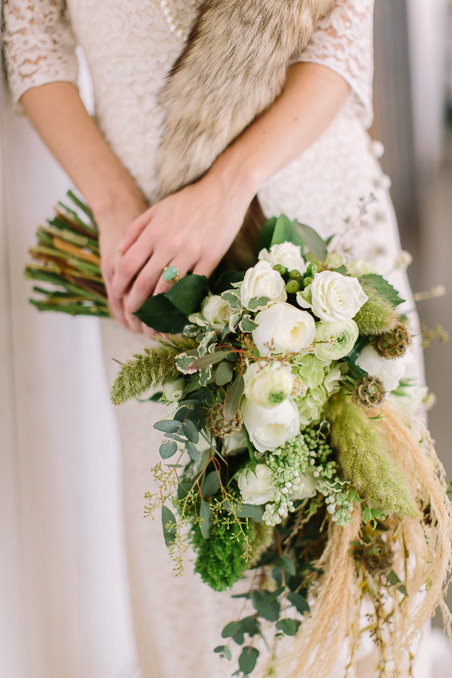 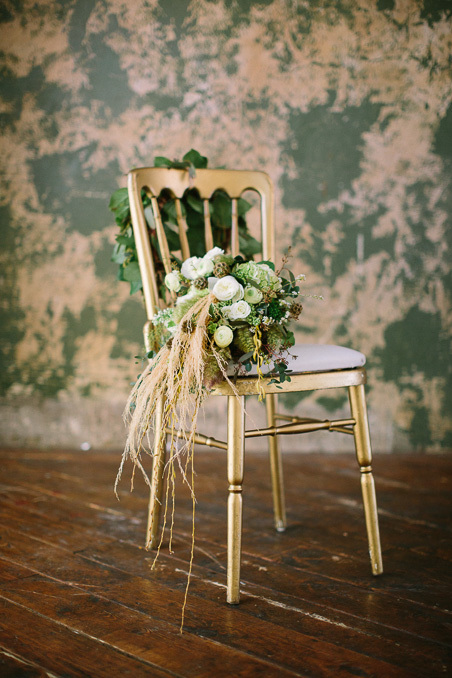 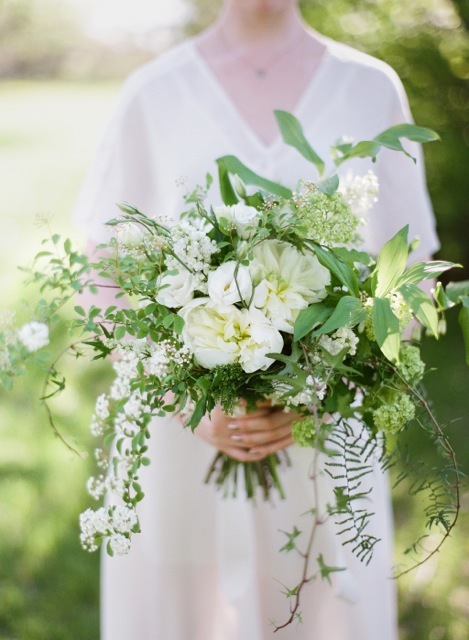 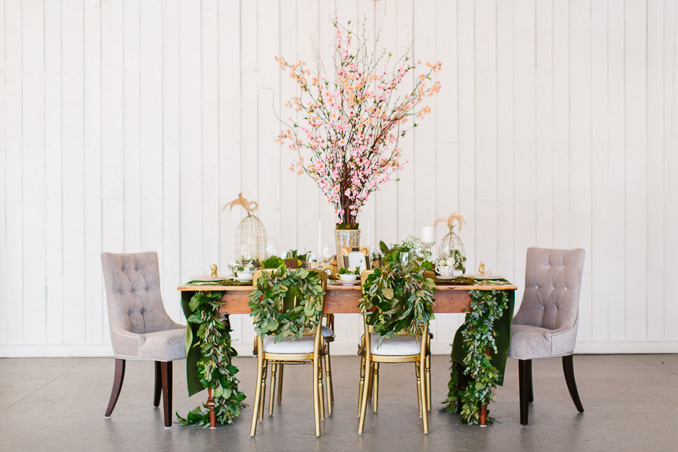 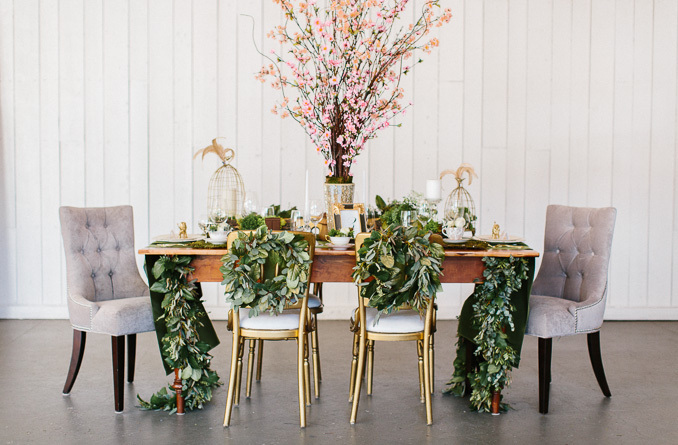 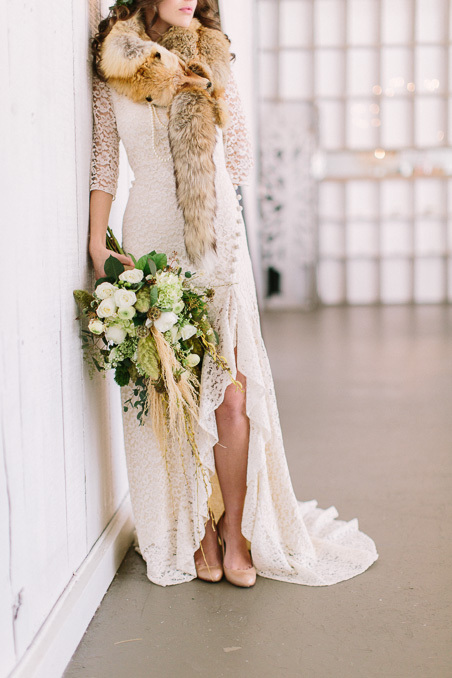 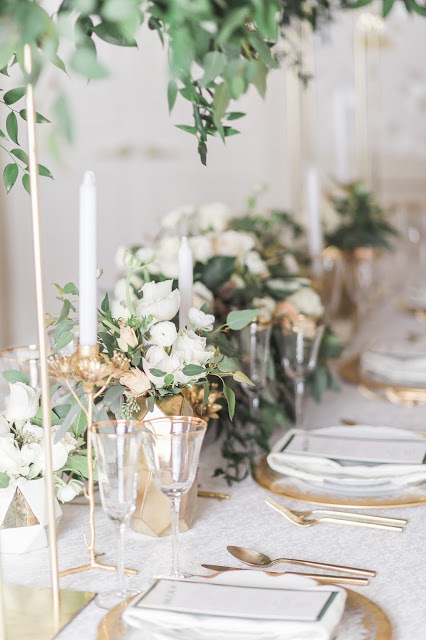 Soft, natural florals that feature plenty of greenery are perfectly accented by crisp ivory and gold details. 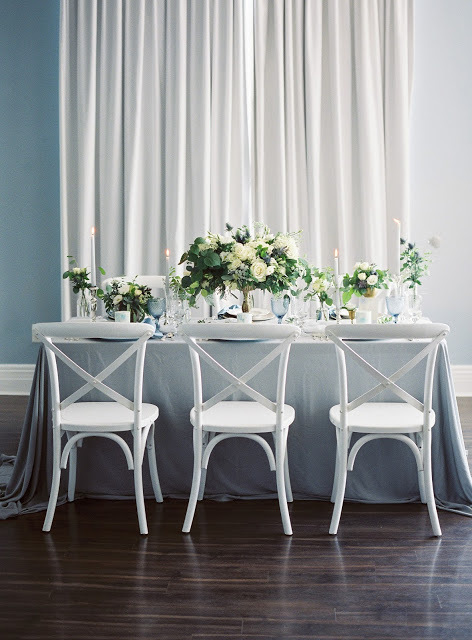 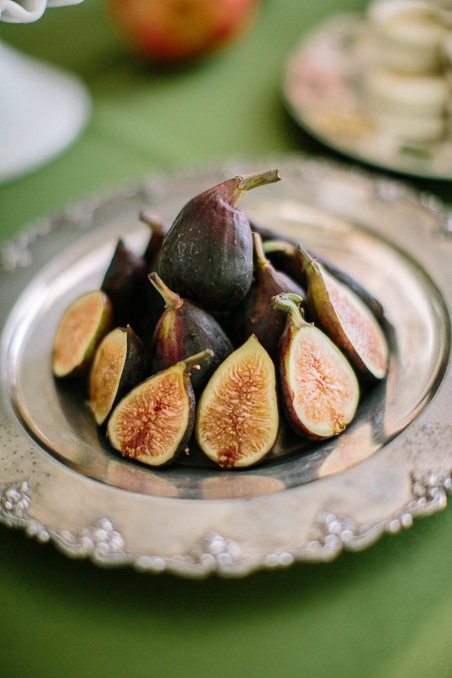 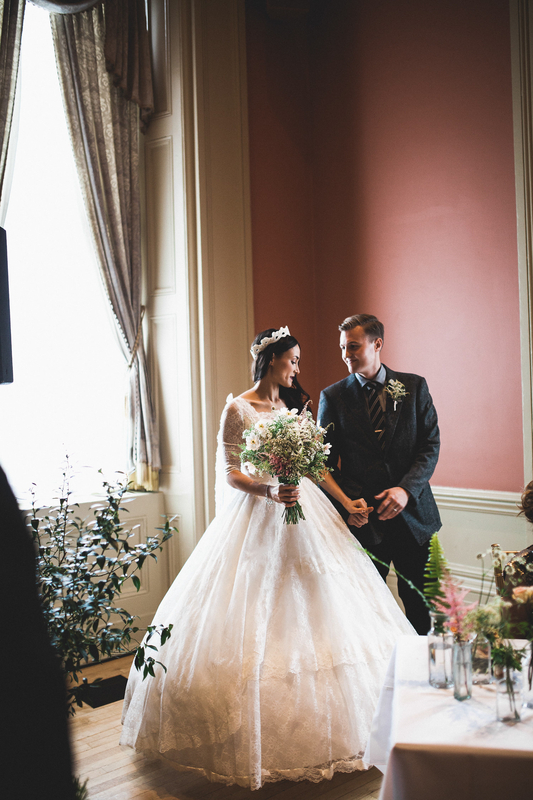 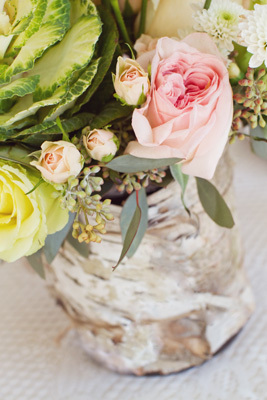 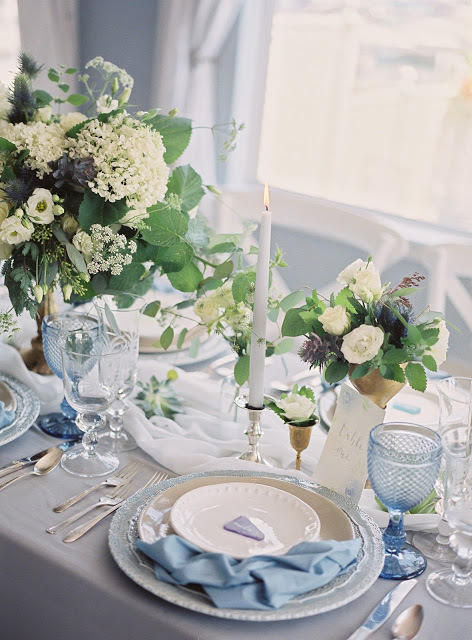 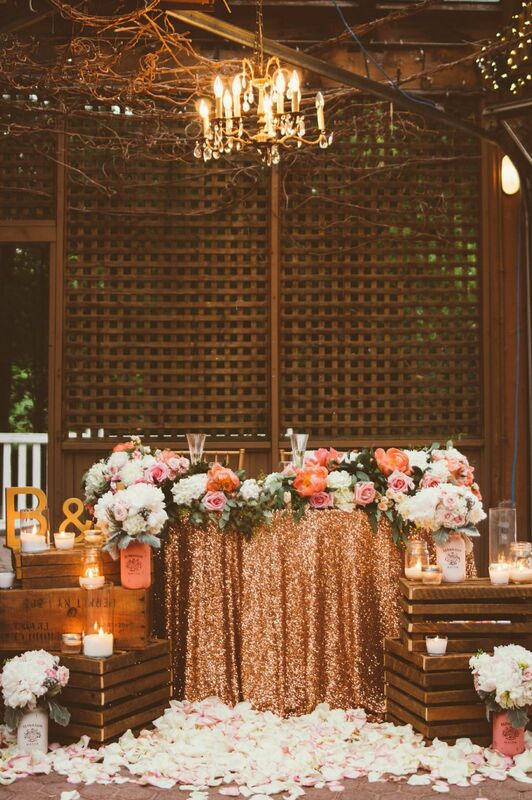 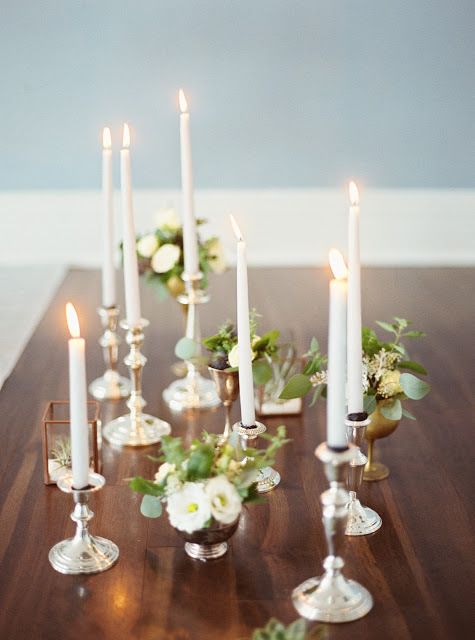 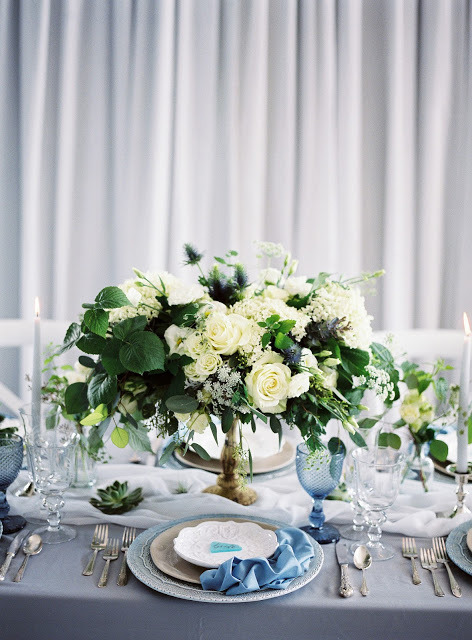 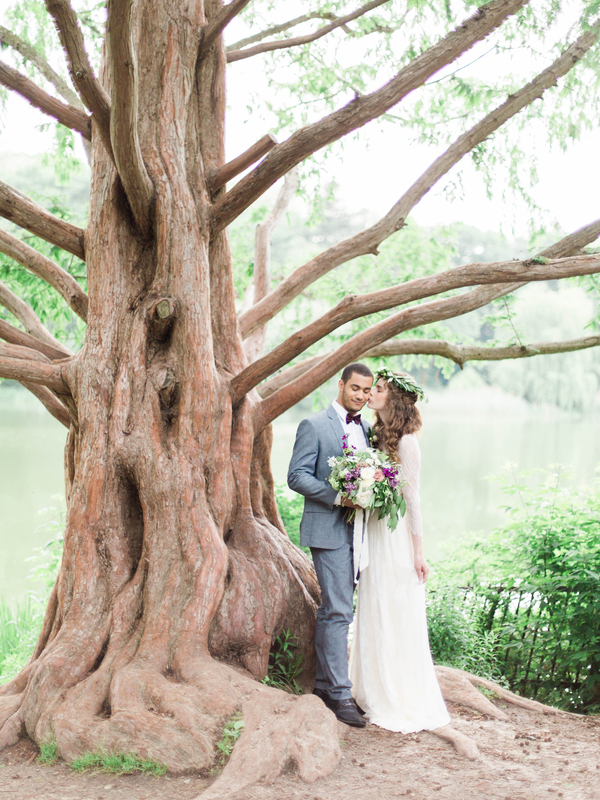 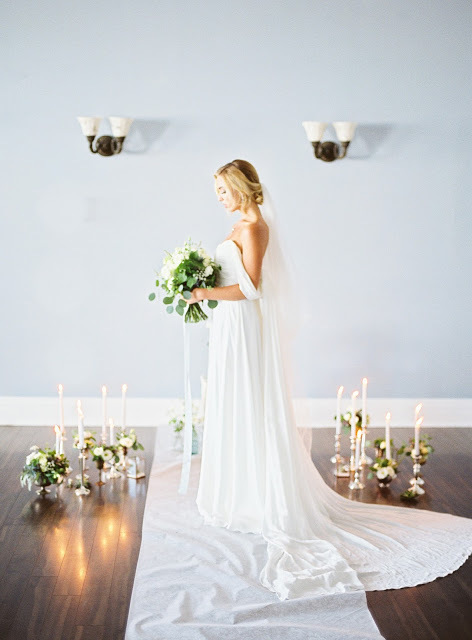 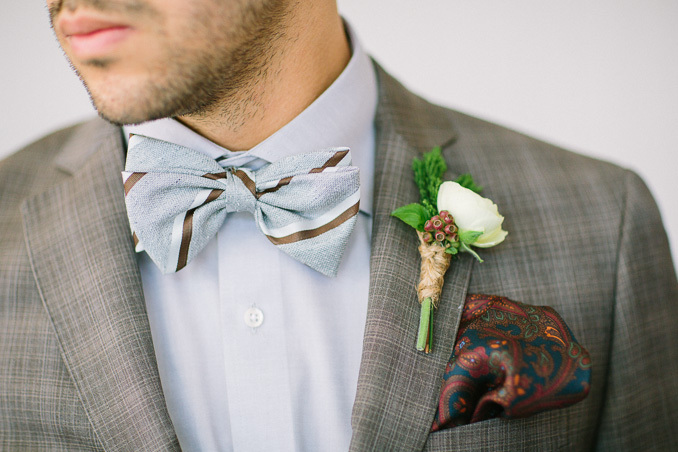 This classic and stylish wedding inspiration is a perfect marriage of contrasts. 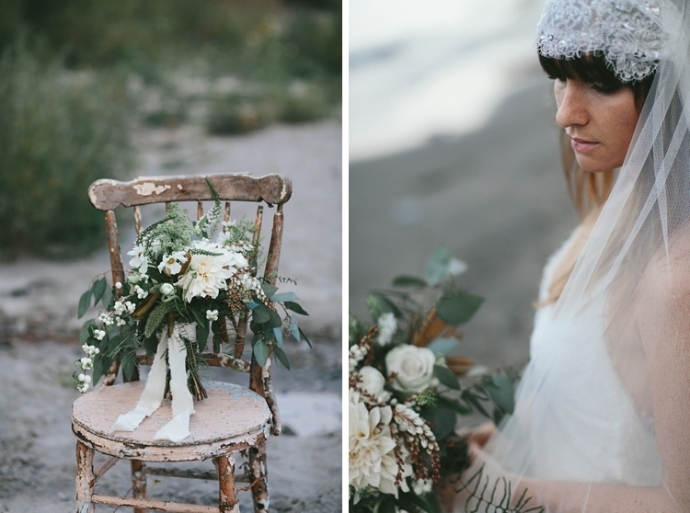 Get inspired by all the details - see the full feature HERE. 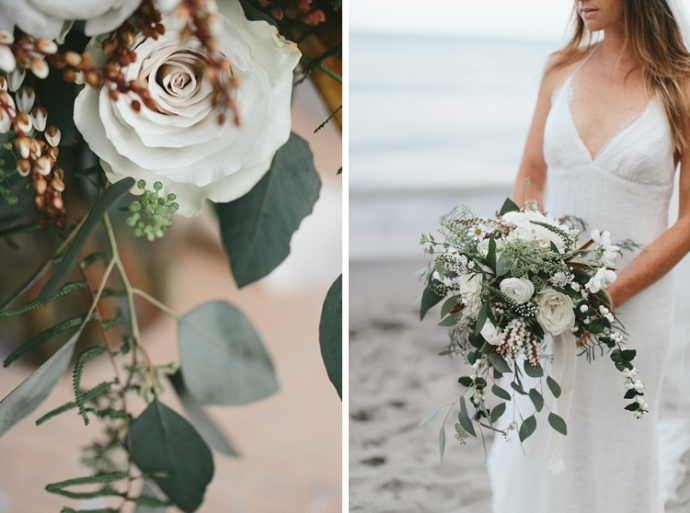 Soft and beautifully romantic pieces which incorporate a subdued colour palette of dusty blue and ashen gray to give a comfortably cooling atmosphere which matches the magnificence of a vast seaside horizon. 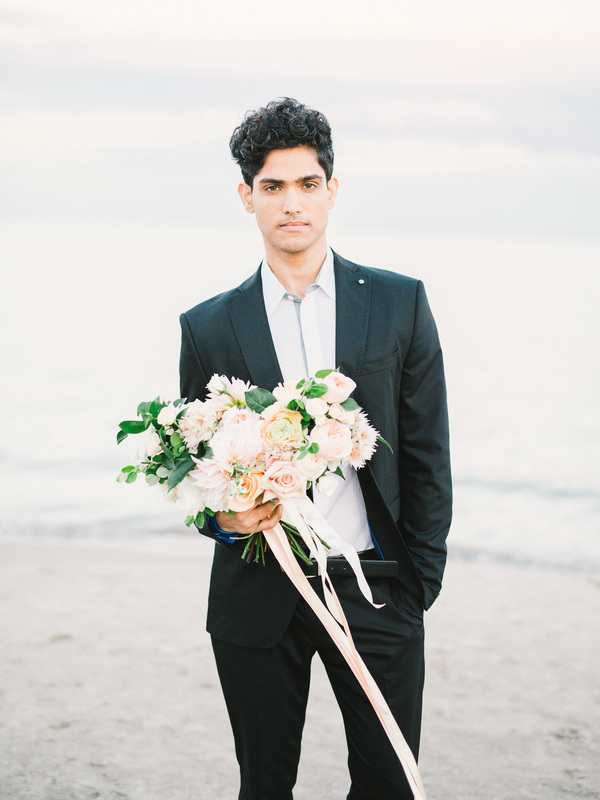 With the goal of simplicity and elegance in mind, the use of a uniform colour theme throughout all the many elements of the shoot alongside incorporating the natural scenery of Toronto’s harbourfront gave the styled shoot both a nuanced, minimalist yet authentic vibrance. 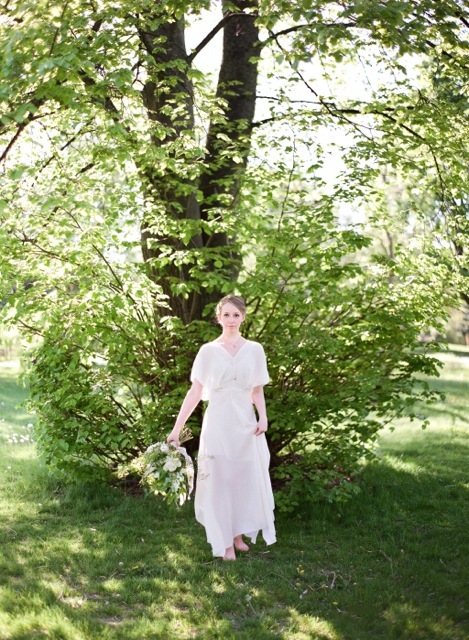 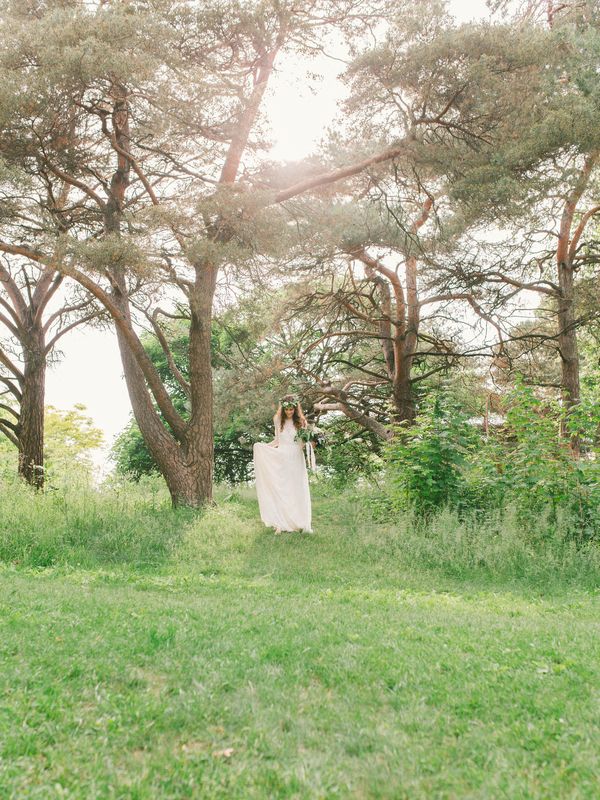 This Kinfolk-inspired styled shoot was shot in High Park, Toronto. 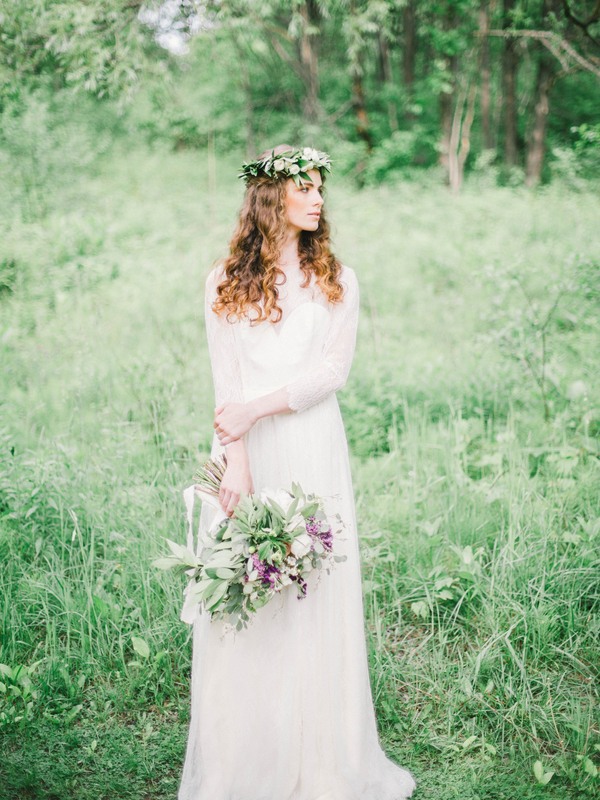 Full of whimsy, lush flowers with a freshly plucked-from-the-ground feel, and flowy, ethereal gowns. 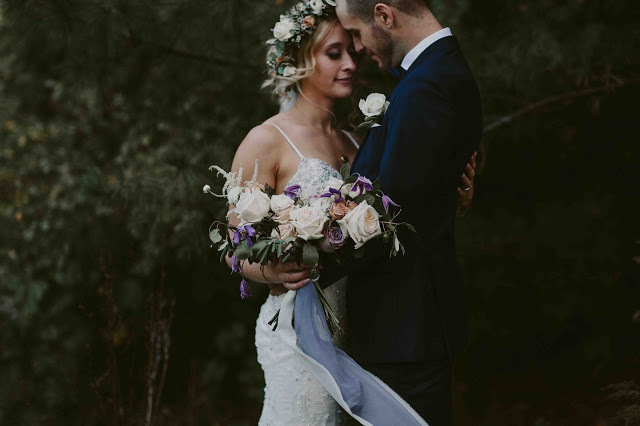 A bridal bouquet, flower crown and a large lush arrangement were filled with some of our favourite blooms and foliage, including lilac, garden roses, peonies, ranunculus, anemones, wild rose branch, stock, and olive branch. 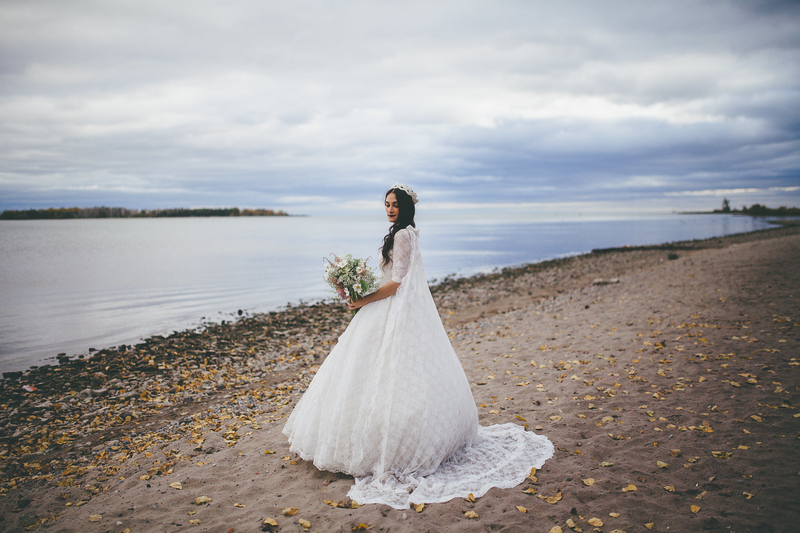 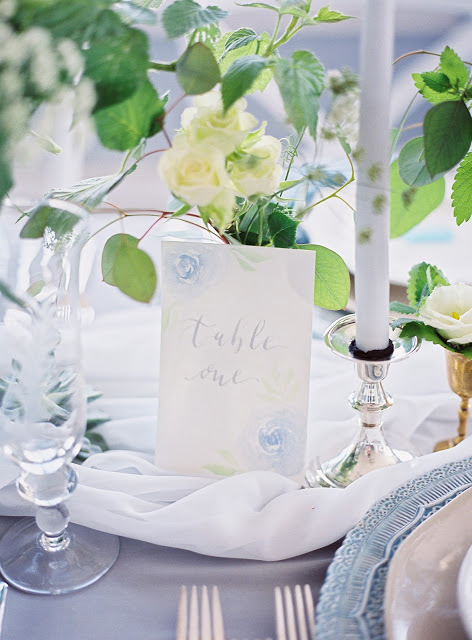 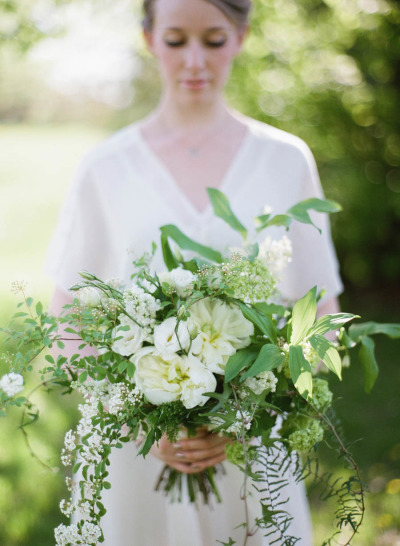 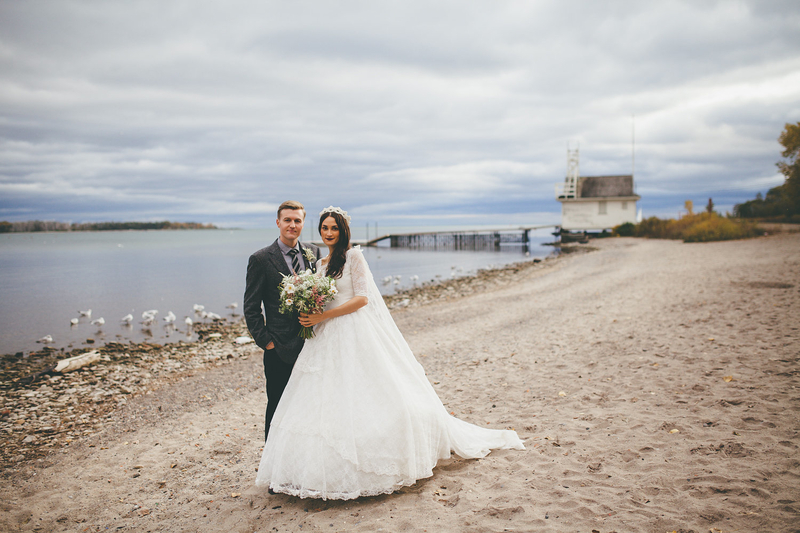 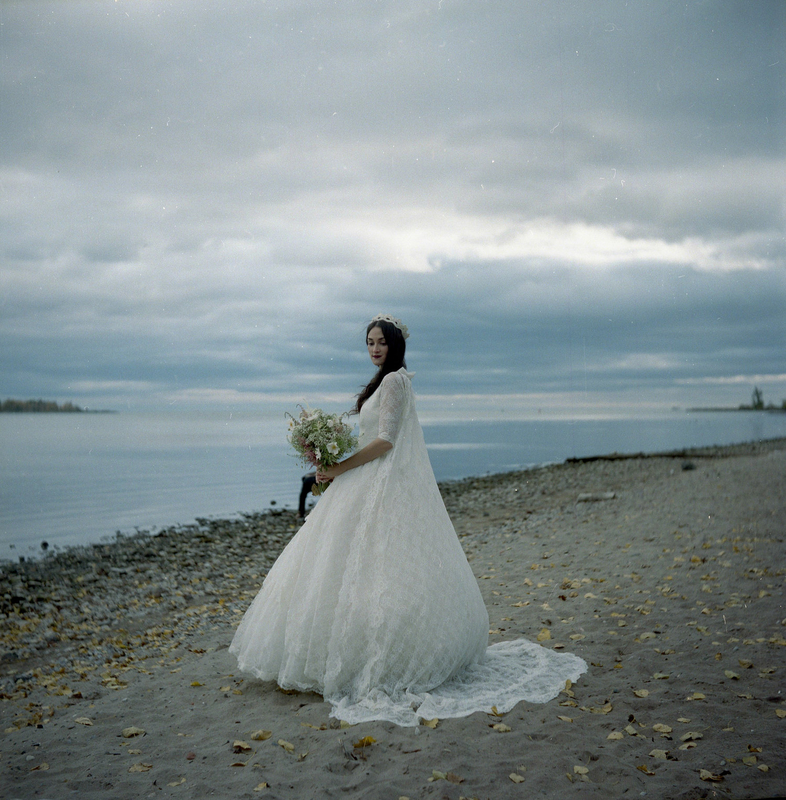 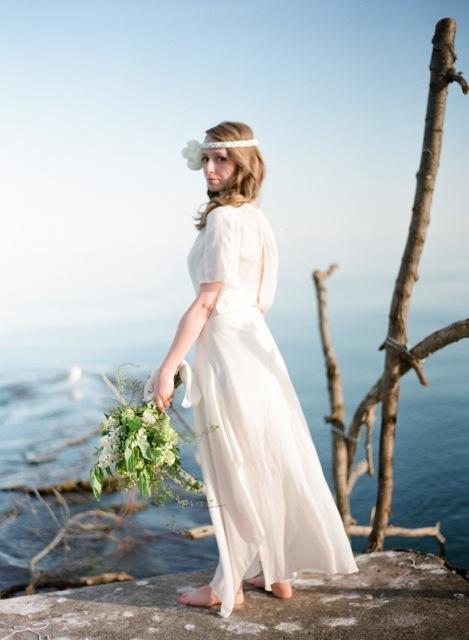 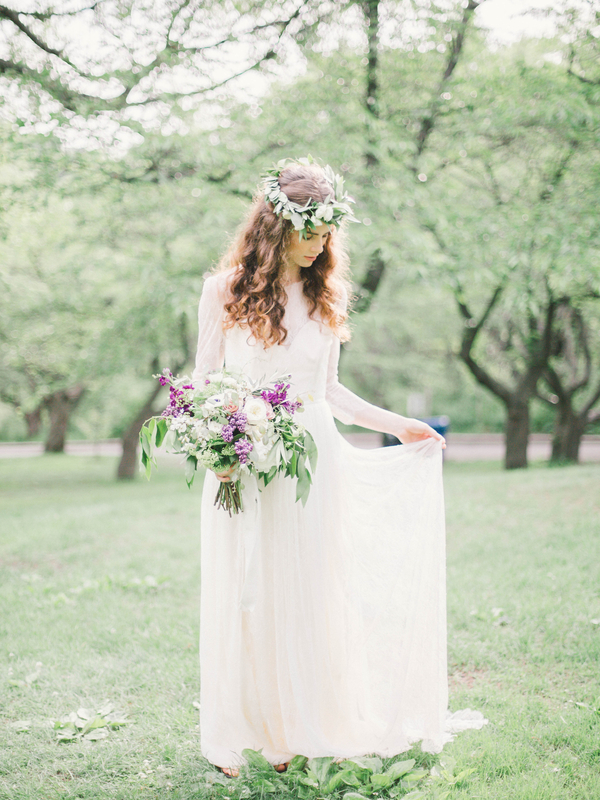 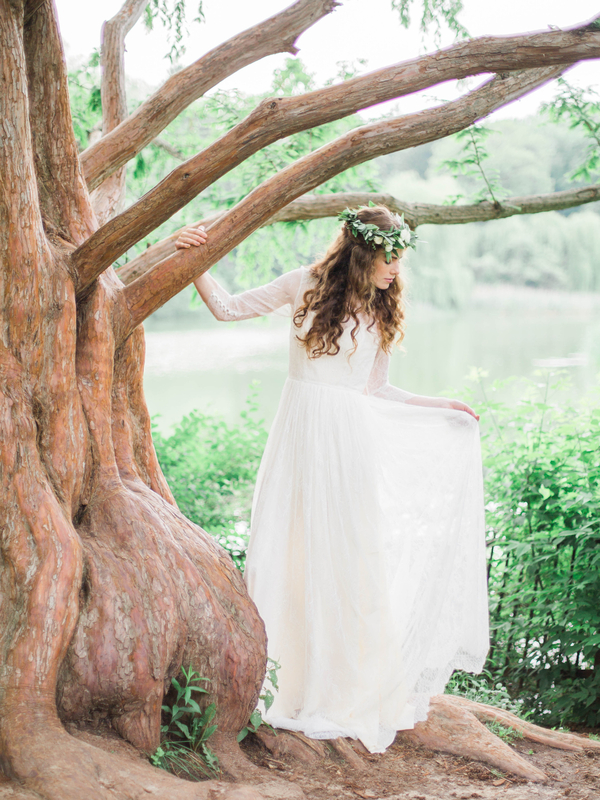 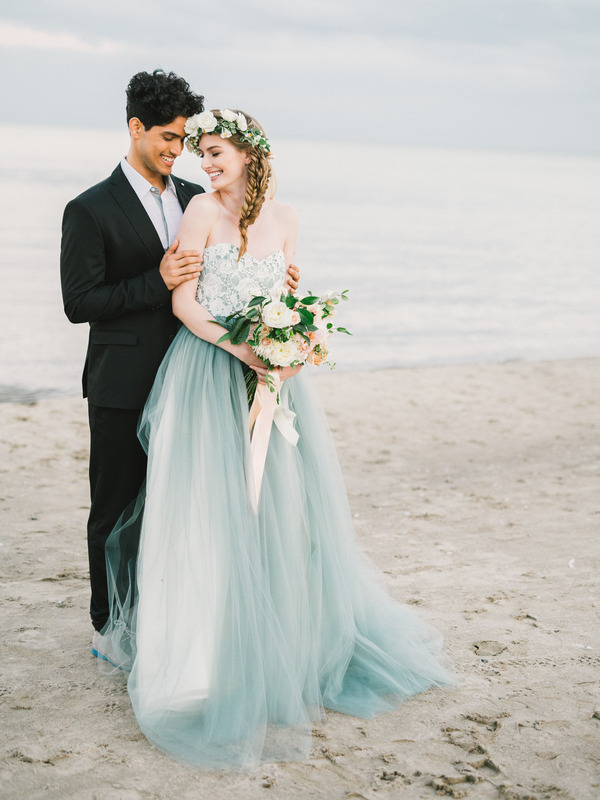 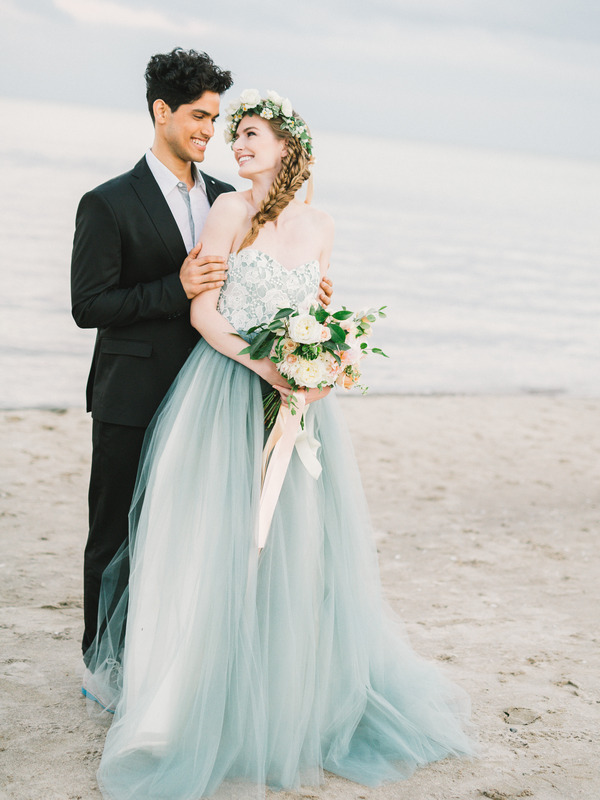 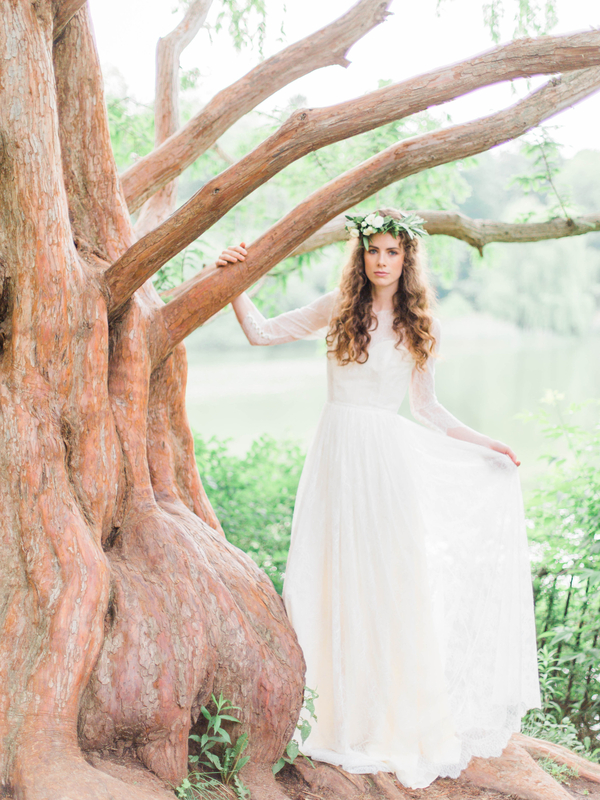 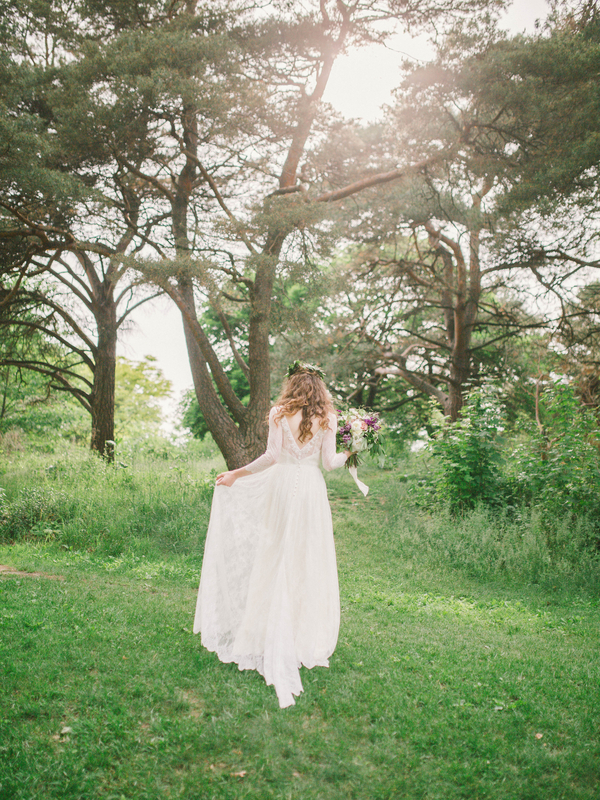 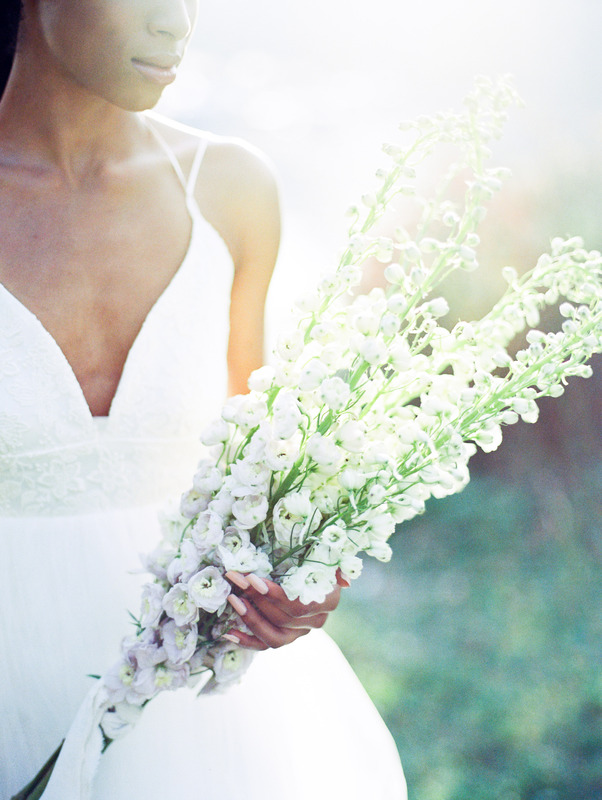 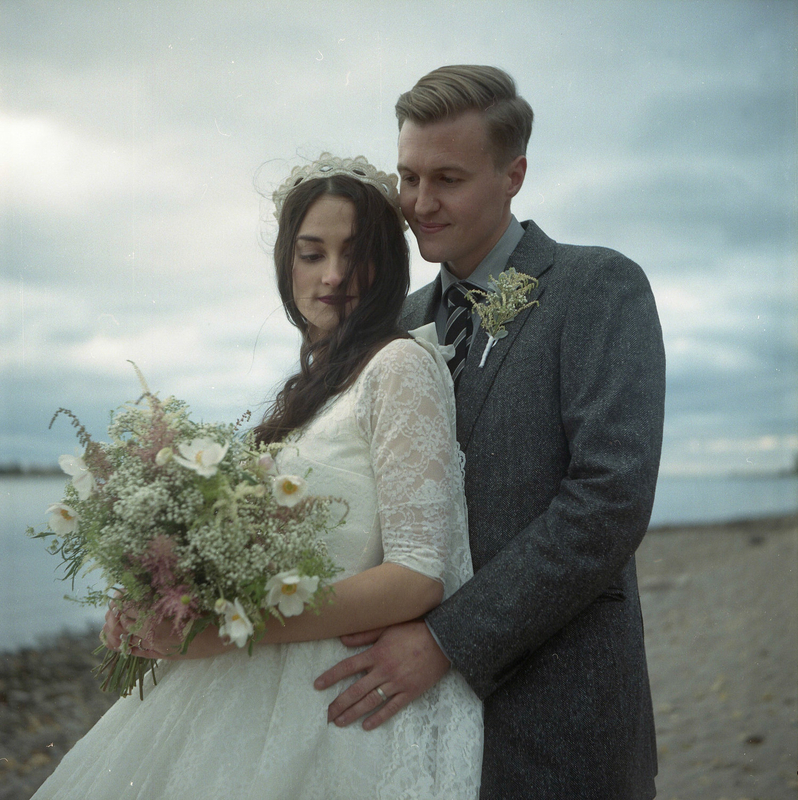 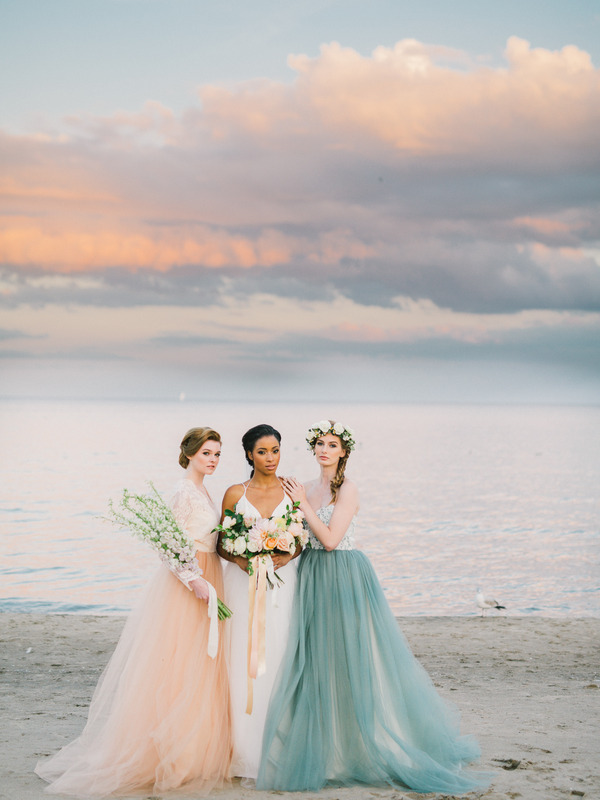 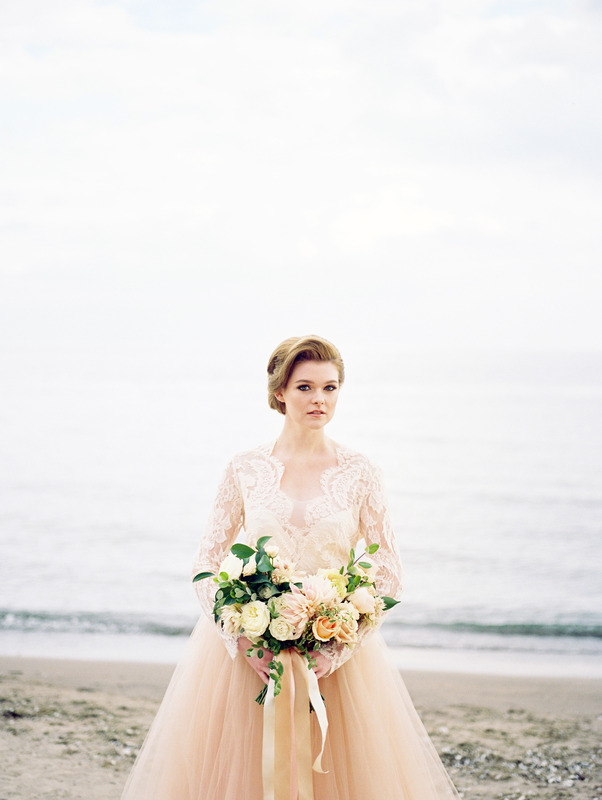 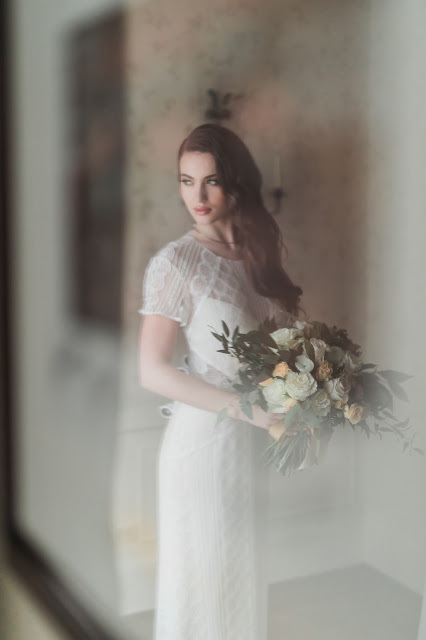 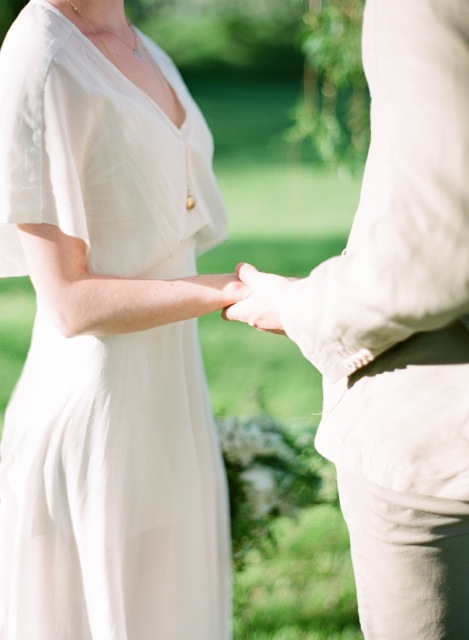 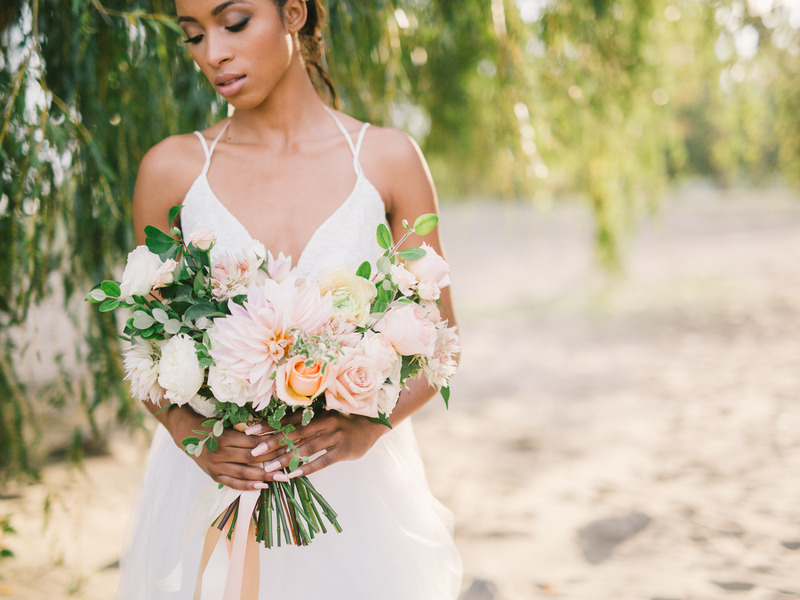 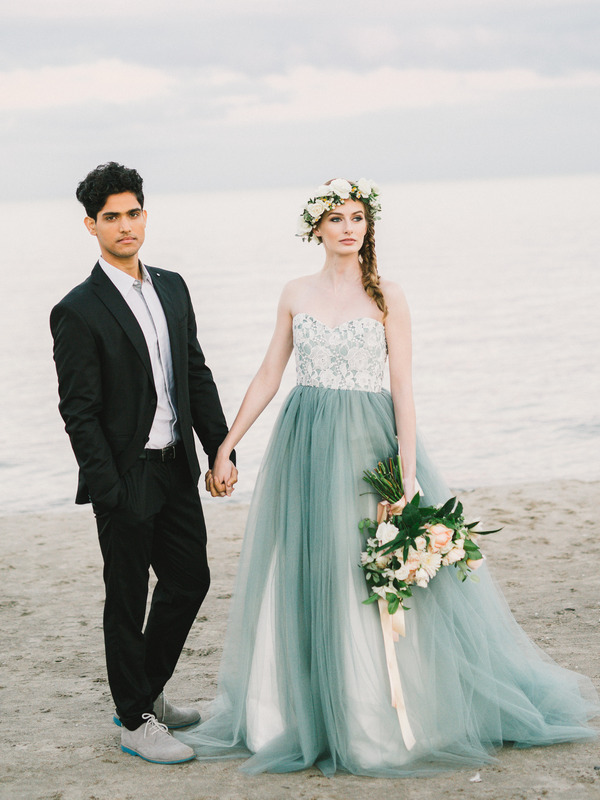 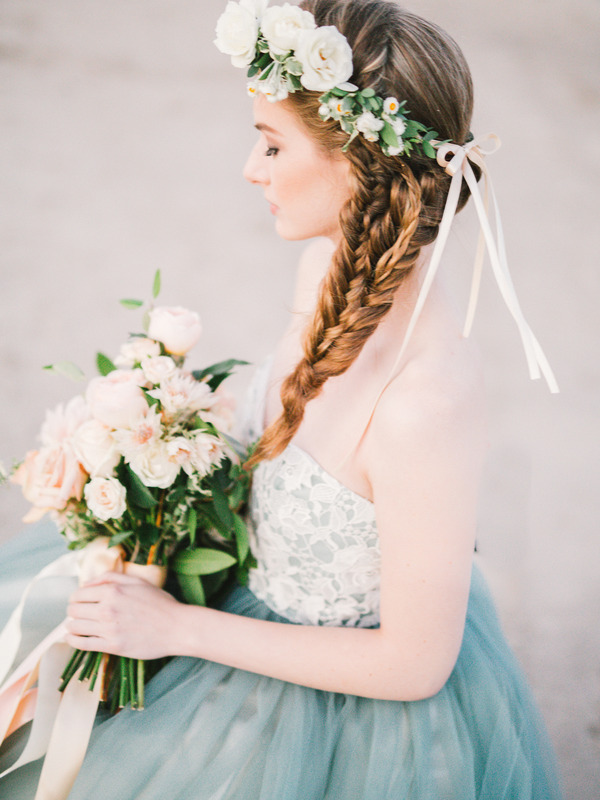 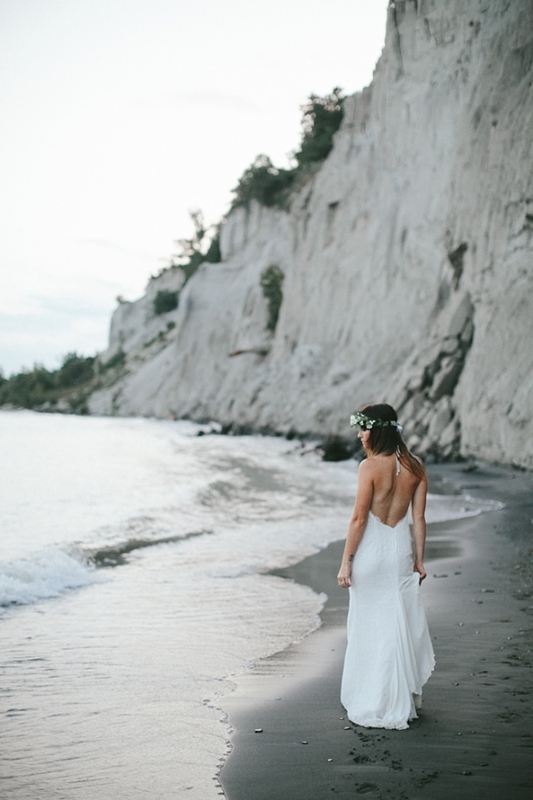 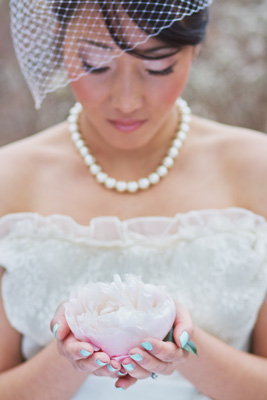 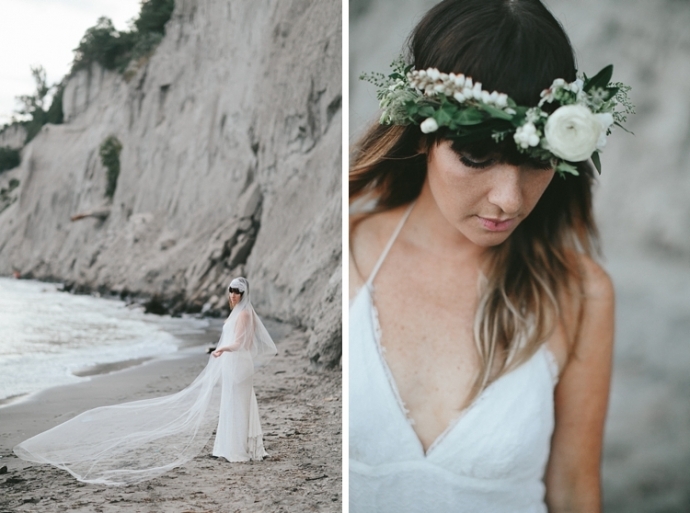 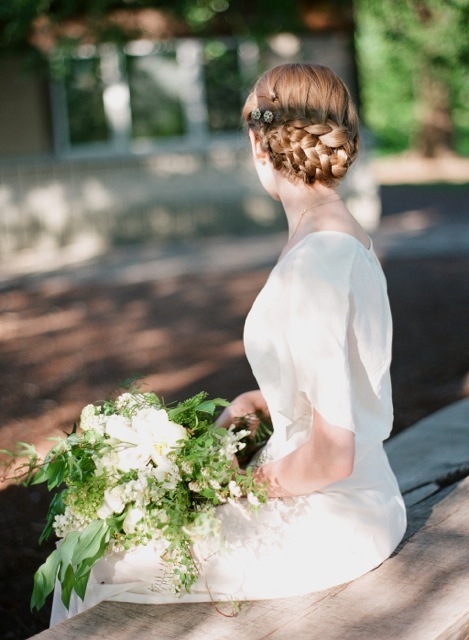 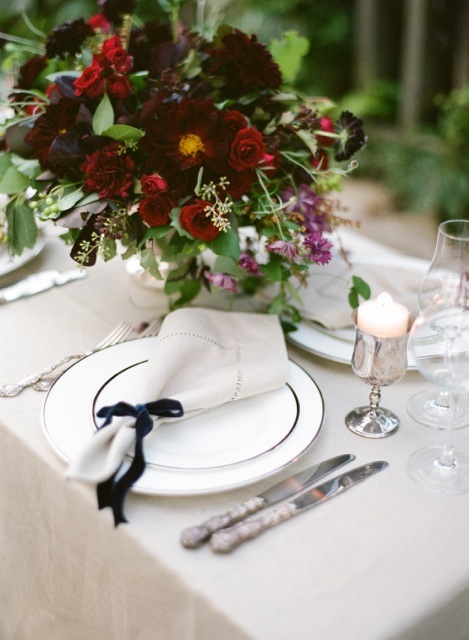 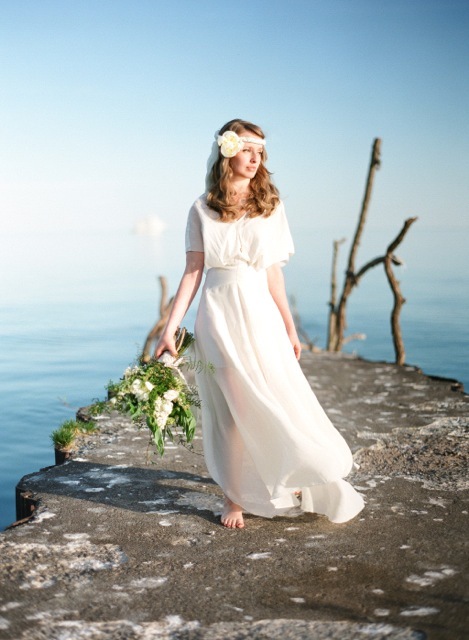 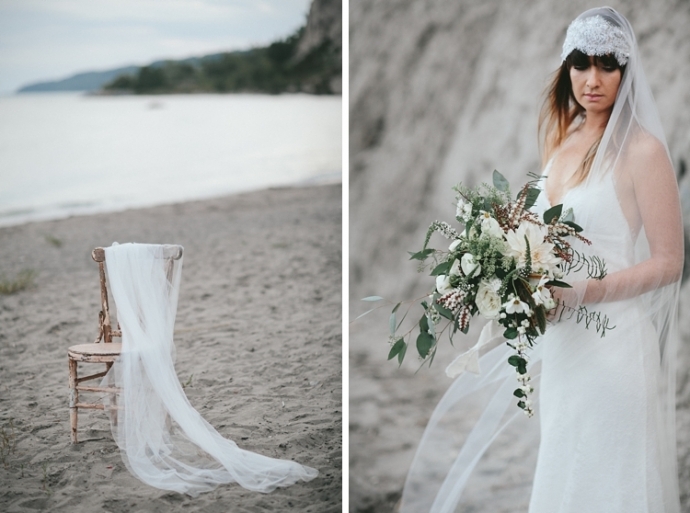 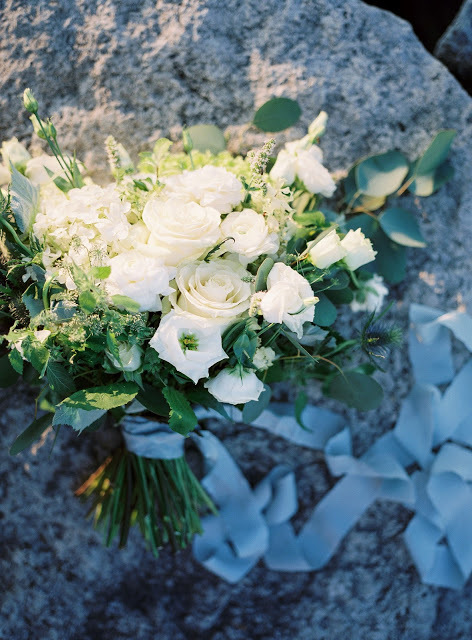 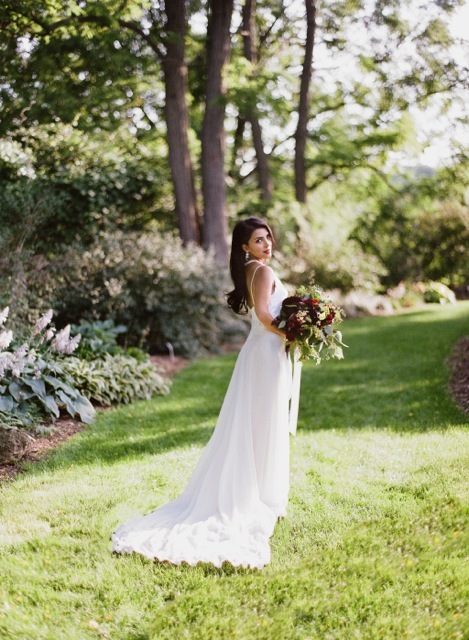 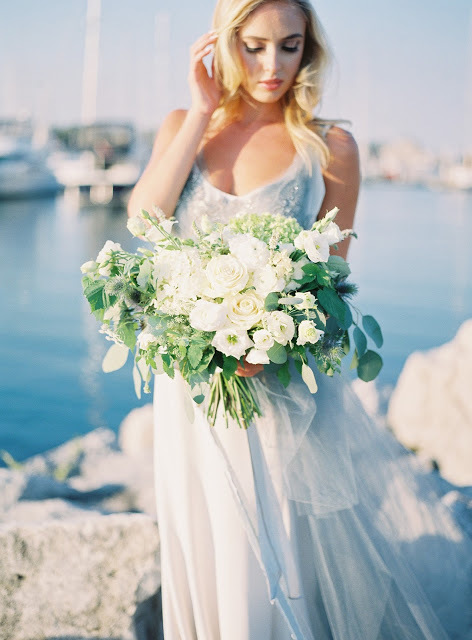 This ethereal lake-side styled shoot took place at the Beaches in Toronto. 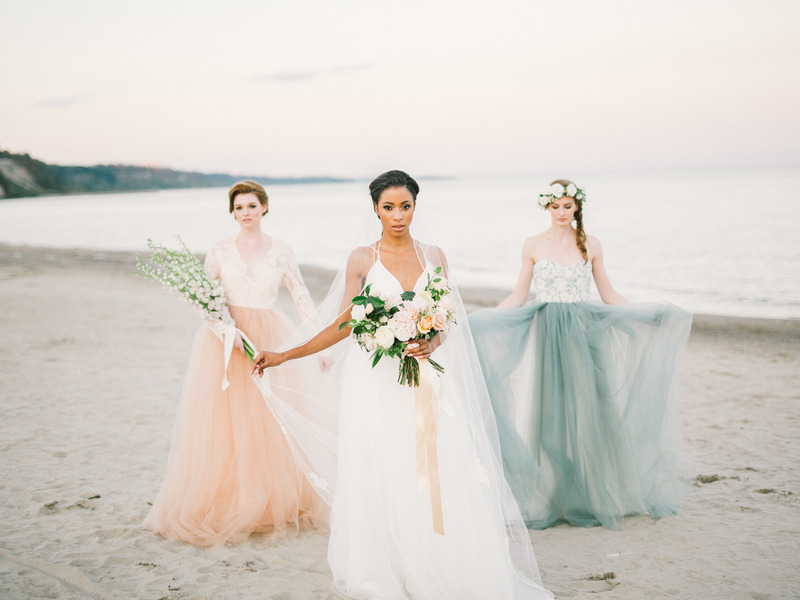 Full of lush flowers and flowy, ethereal gowns that tell the story with each layer of soft tulle and pastel hue, matching perfectly to the sunset sky. 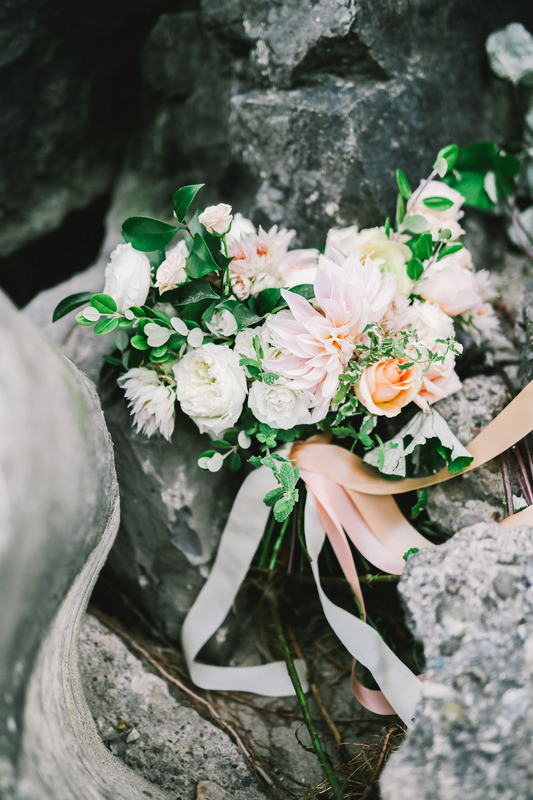 Bridal bouquets and a flower crown featuring Cafe au Lait dahlias, roses, garden roses, spray roses, delphiniums, ranunculus, and plenty of lush foliage. 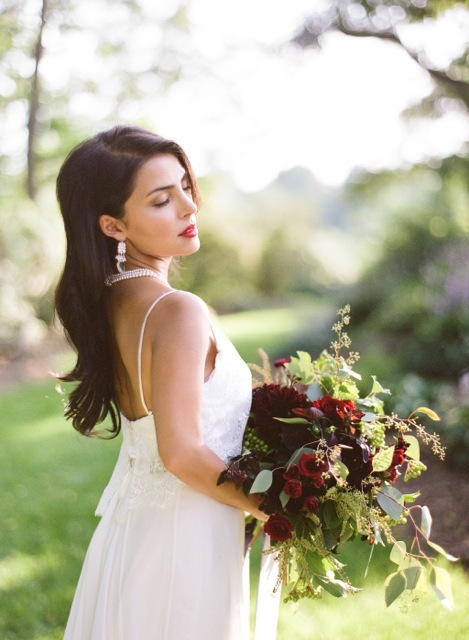 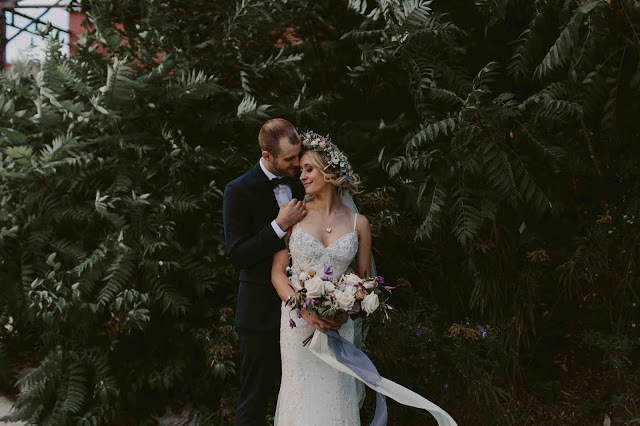 Old Hollywood glamour and a sophisticated colour palette of red, white, and blue were the inspiration for this outdoor styled shoot set on the lush Royal Botanical Gardens. 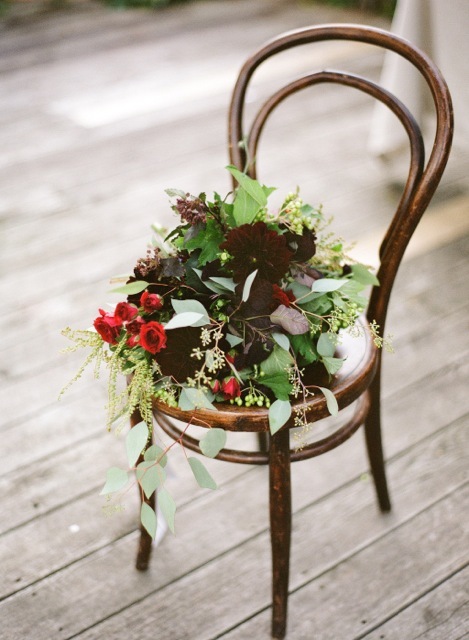 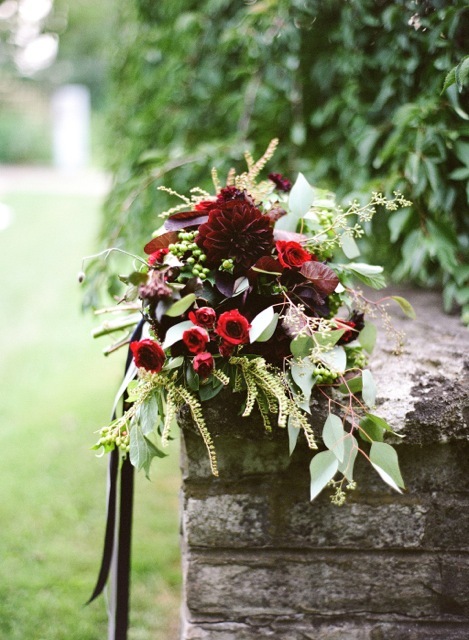 We used ample foliage and deep crimson blooms to create these dramatic and moody florals, such as dahlias, spray roses, clematis, cotinus, bachelor buttons, viburnum berries, pieris, scabiosa, physocarpus, with trailing seeded eucalyptus and ribbons. 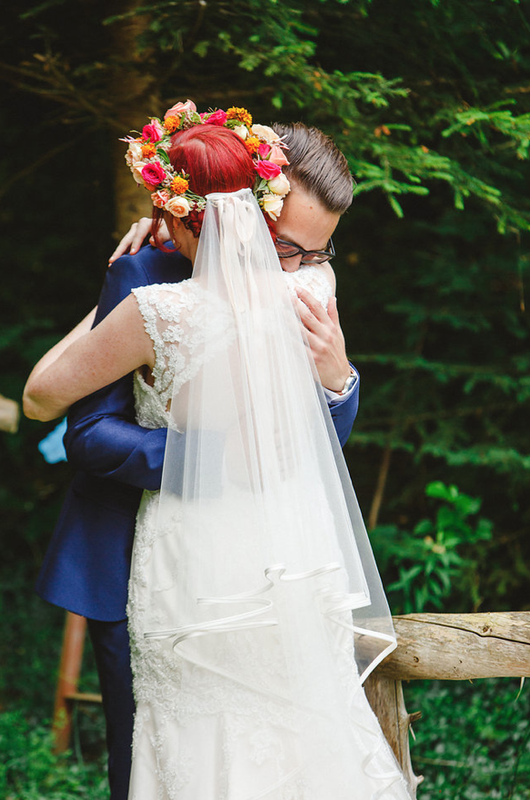 Some of our favourite pictures are found below and you can see the full feature and gallery HERE. 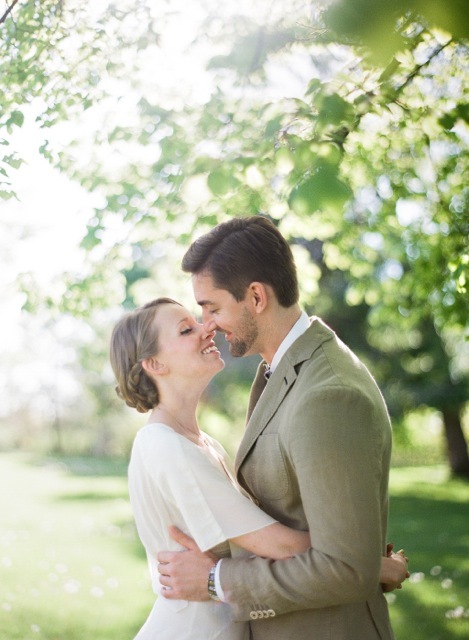 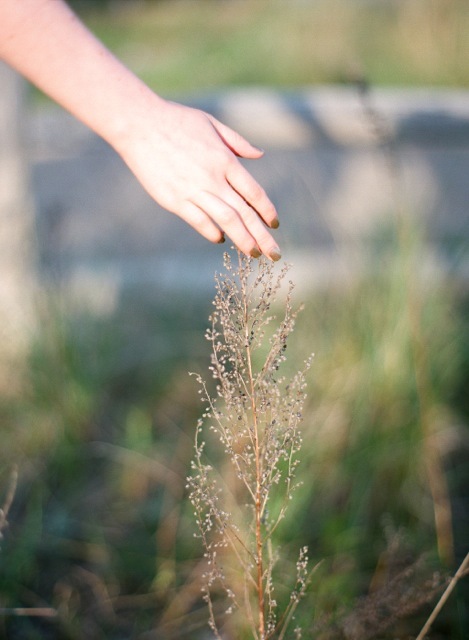 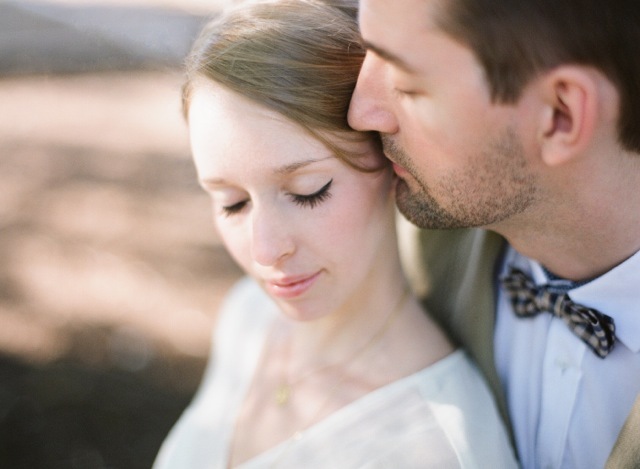 This Toronto Island engagement session was inspired by a looser, more natural style. 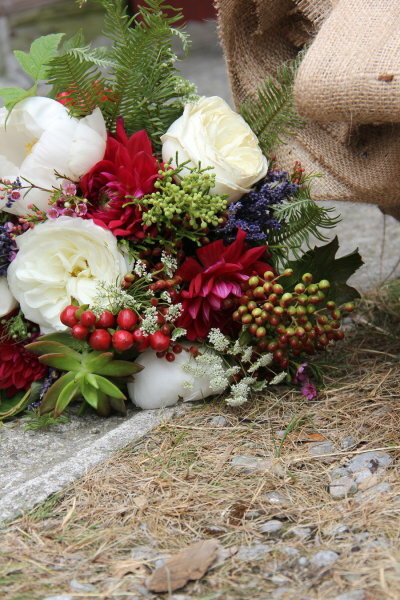 We used ample foliage and trailing blooms such as ferns, ivy viburnum, trachellium, bridal wreath spiraea and soloman's seal, along with larger ruffled blooms like peonies and lisianthus. 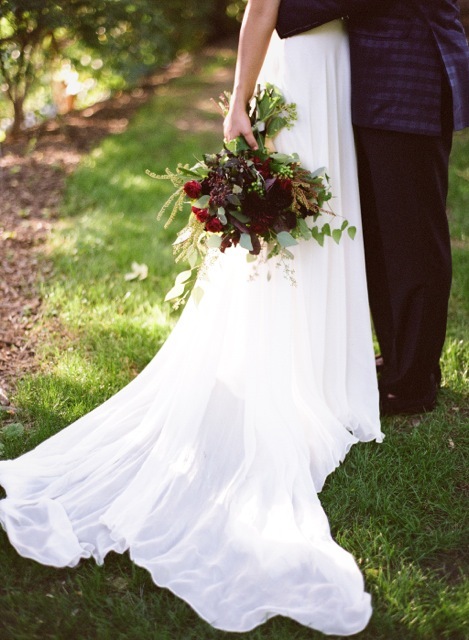 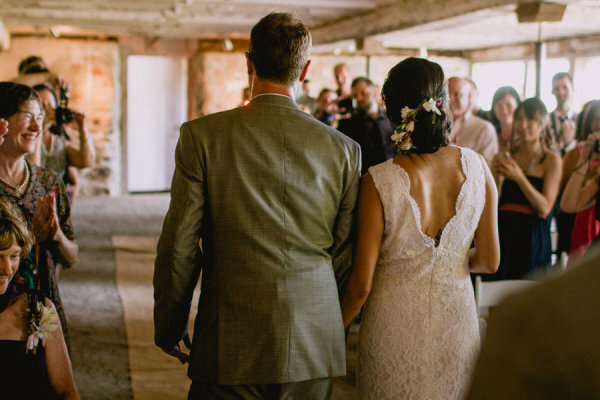 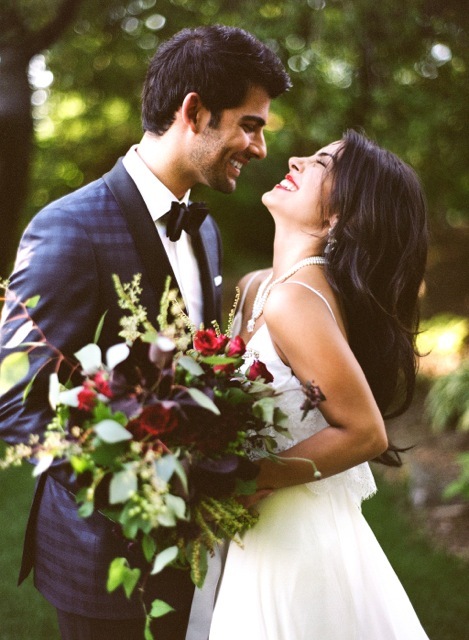 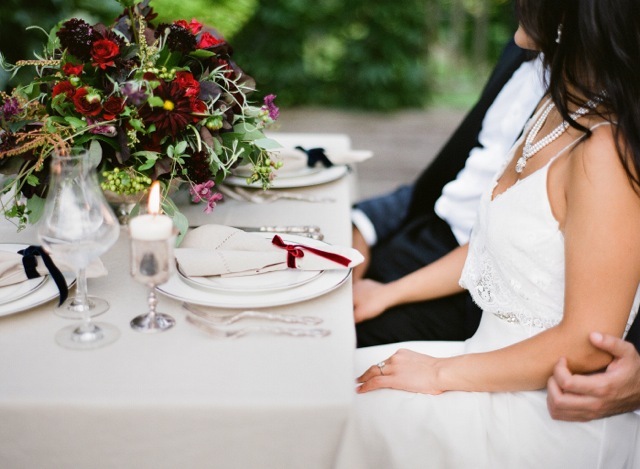 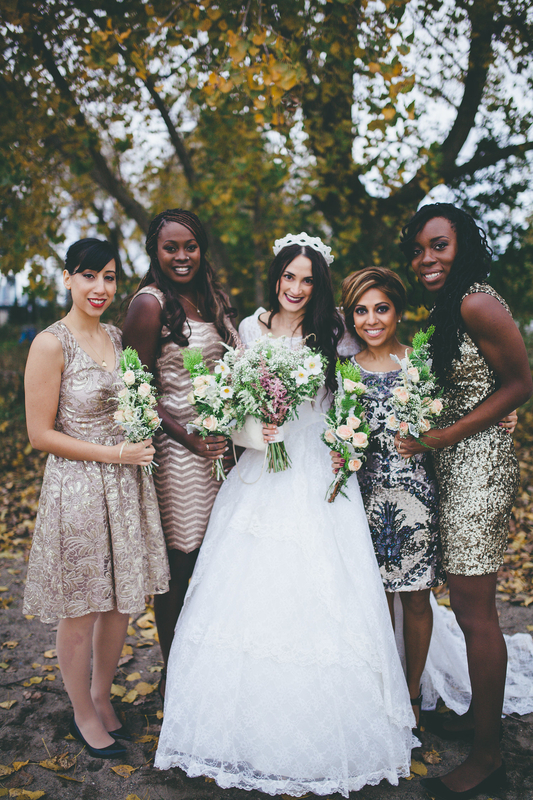 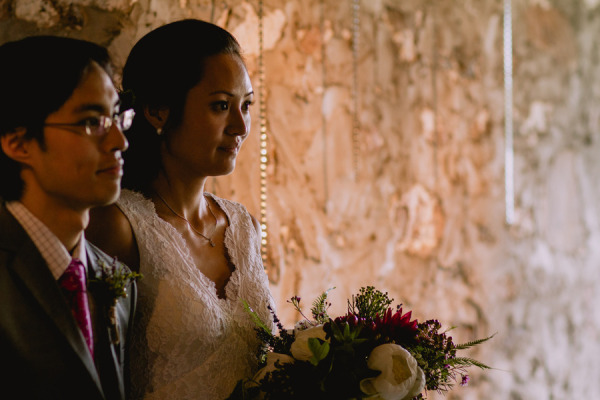 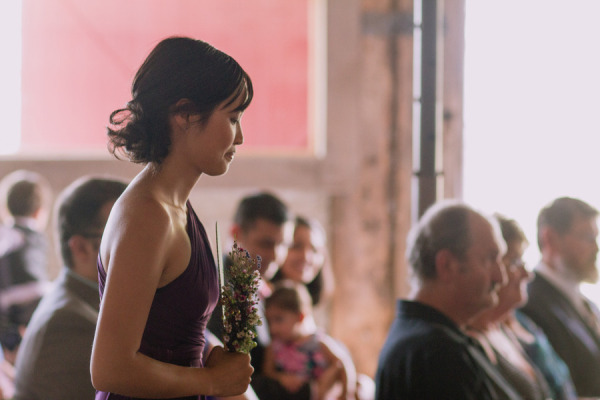 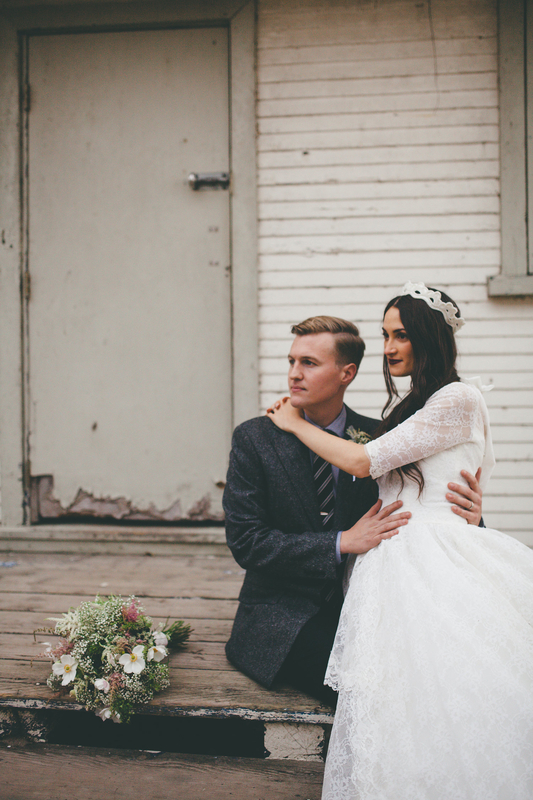 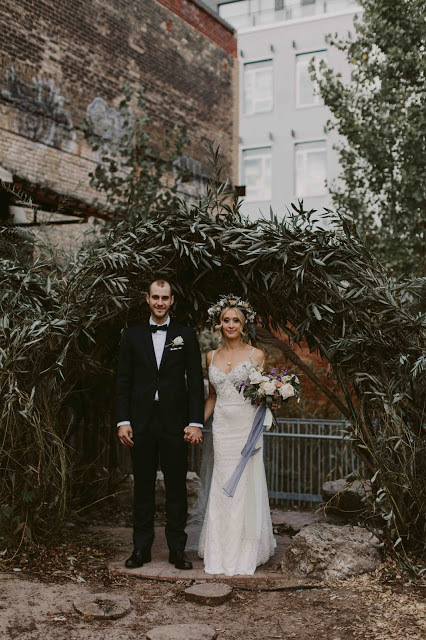 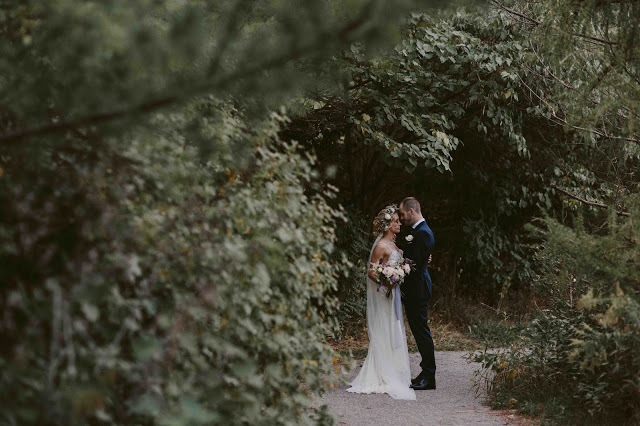 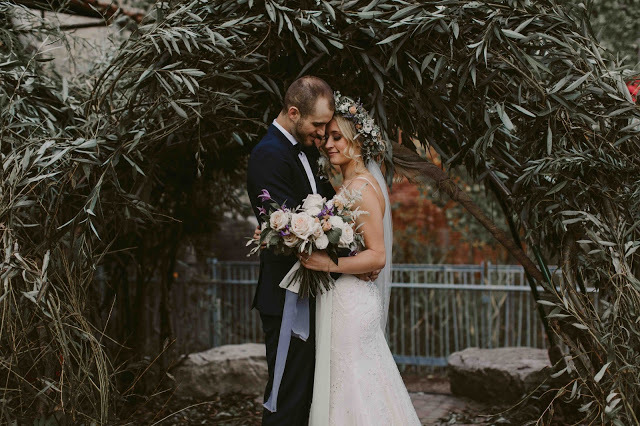 This intimate wedding at Evergreen Brickworks was romantic and moody. 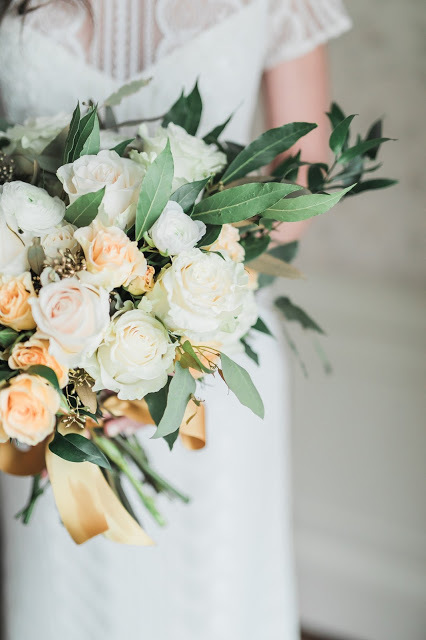 We filled the bridal bouquet and compote vases with lush displays of our farm grown Cafe au lait dahlias, O'Hara garden roses, ranunculus, clematis, astilbe, Grey Knight roses, and olive branch. 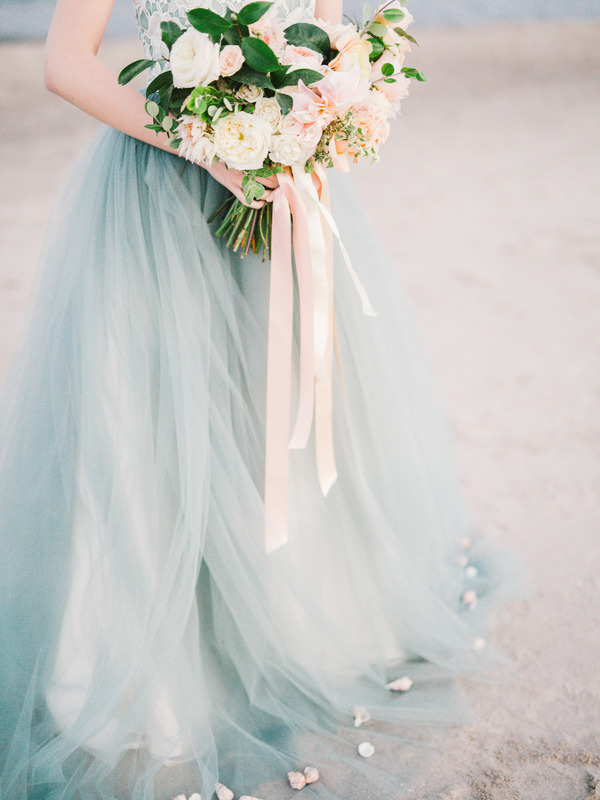 We love the billowy ribbon in the bride's bouquet! 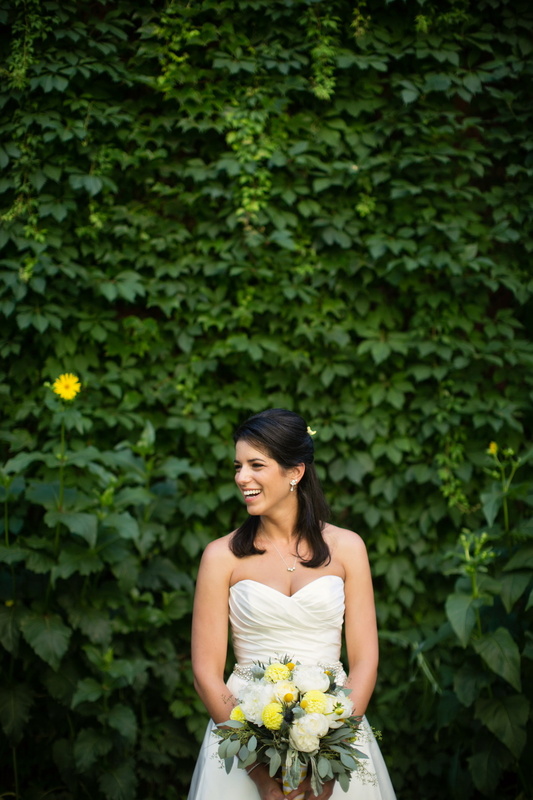 Their ceremony was framed with a beautiful archway filled with lovely flowers and spilling foliage. 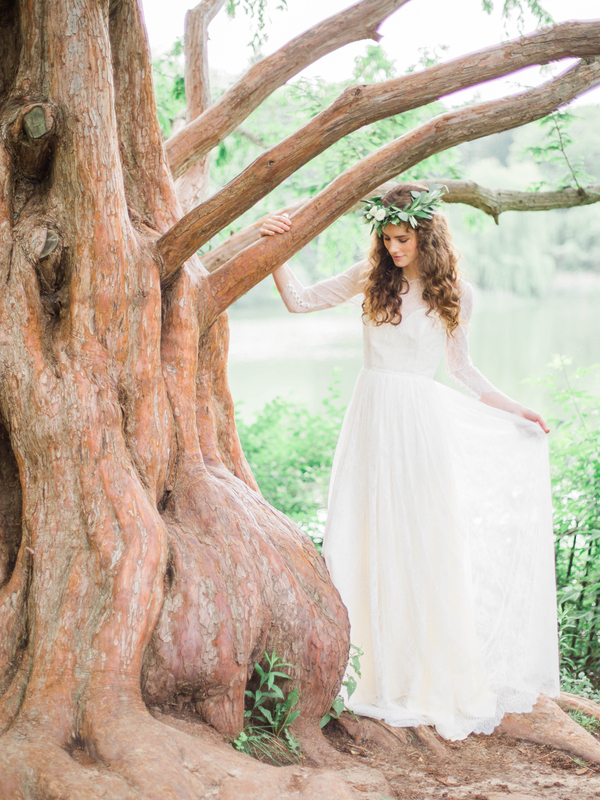 Berkeley Church and the Field House provide the backdrop for this Narnia-inspired styled shoot. 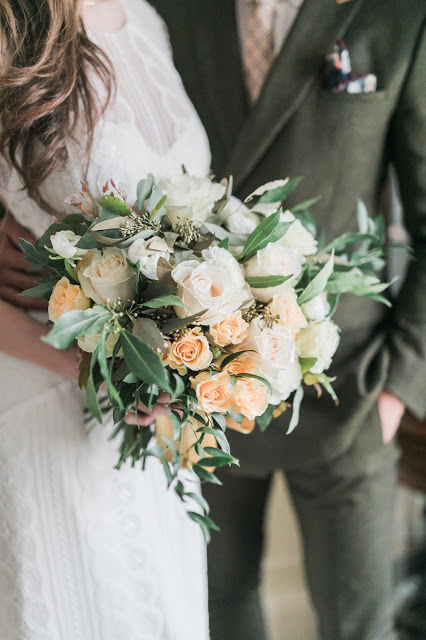 A woodland-inspired bridal bouquet includes garden roses, sweetheart roses, ranunculus, stiletto scabiosa pods, lilac, hypericum berries, and textural foliage such as uva grass, foxtail, trachellium, seeded eucalyptus, New Zealand pittosporum, and weeping willow. 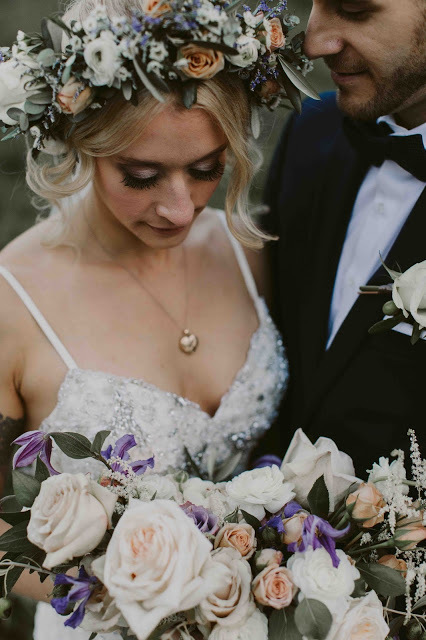 Truly romantic - the flower crown features white sweetheart roses and gilded million hearts set amoungst woodsy foliage. 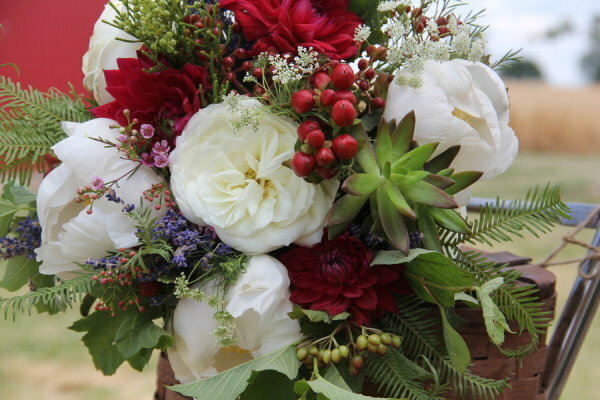 The flower girld carries a rich ruby red bouquet filled with ranunculus, sweetheart roses, and textural greenery including trachellium, foxtail, stiletto scabiosa pods, and seeded eucalyptus. 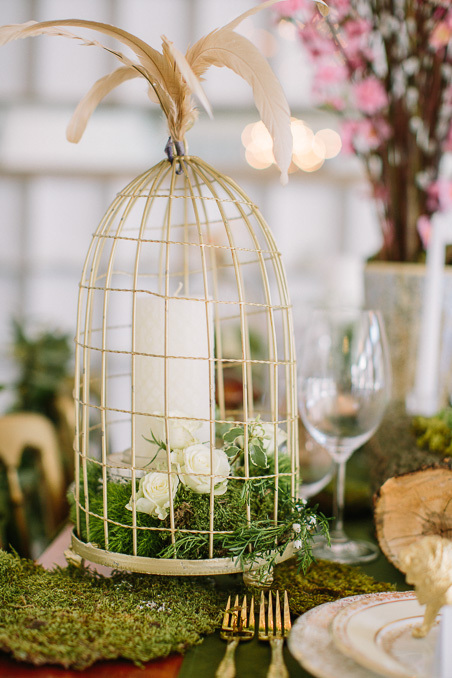 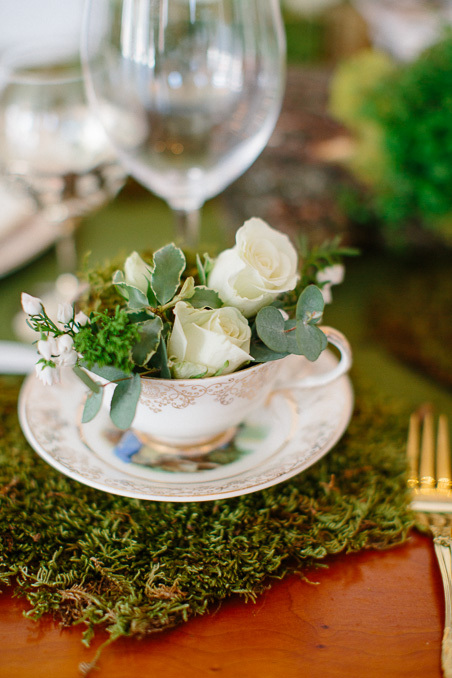 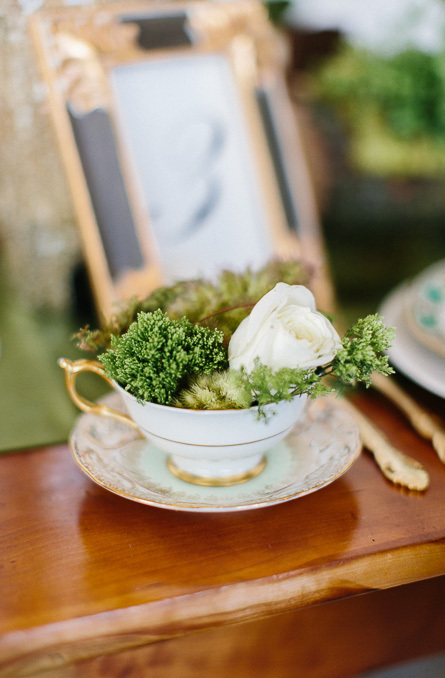 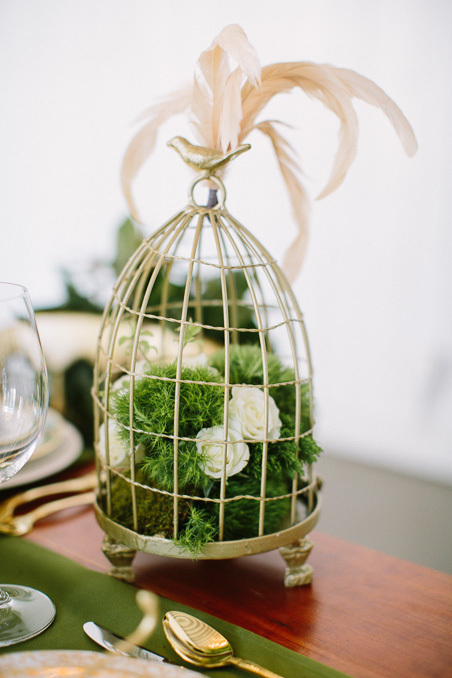 The theme is carried through to table settings -Vintage teacups and cages are filled with moss, eucalyptus and white roses. 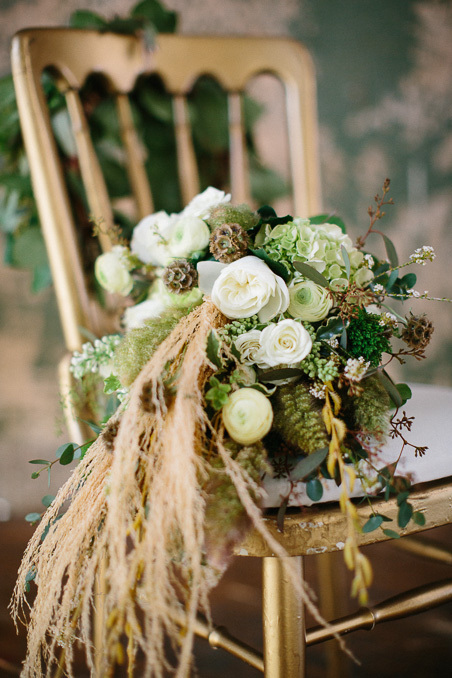 Wooden logs filled with moss and ferns. 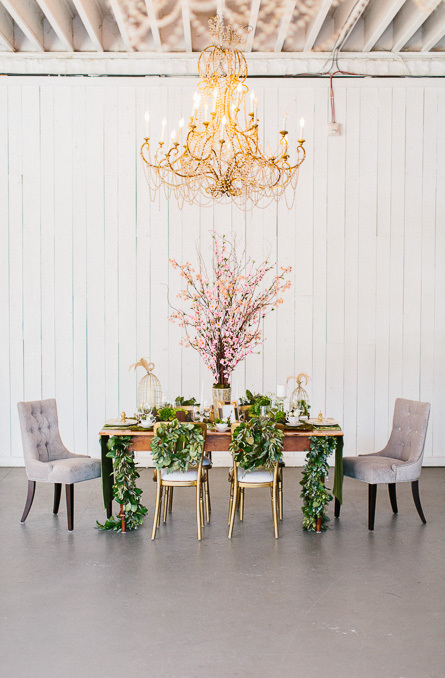 Touches of gold appear in the gilded wreaths and garlands that hang from the table and chairs. 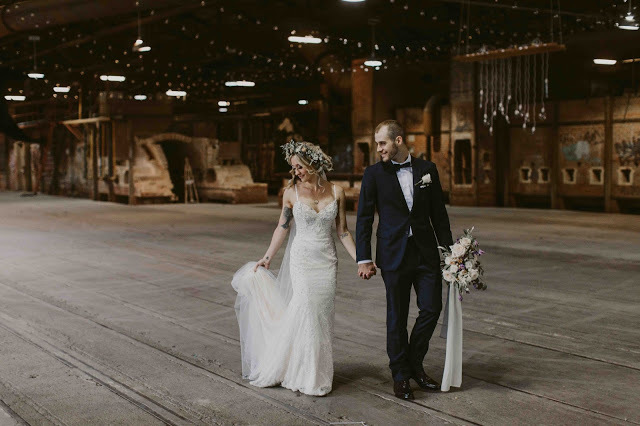 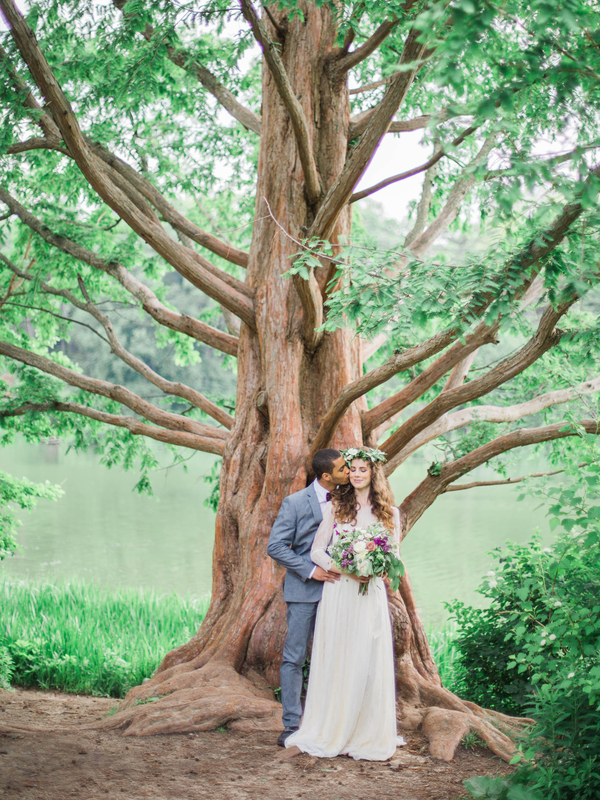 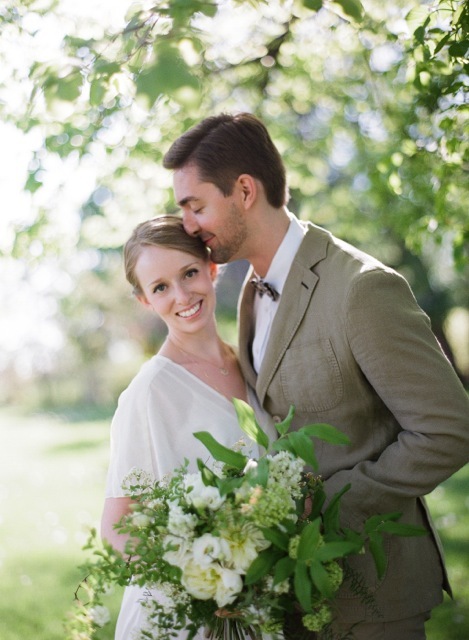 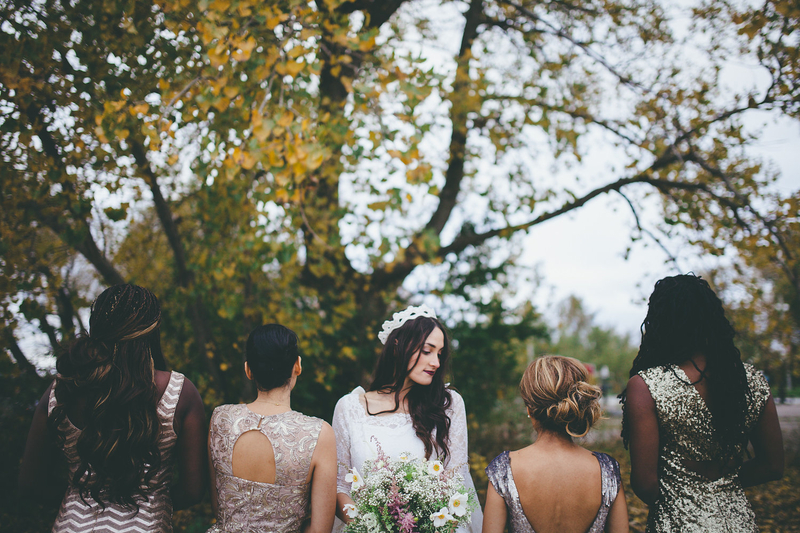 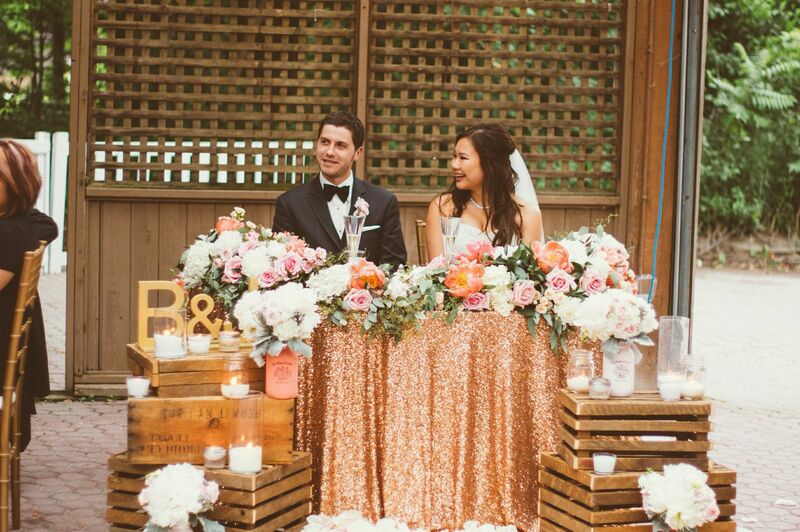 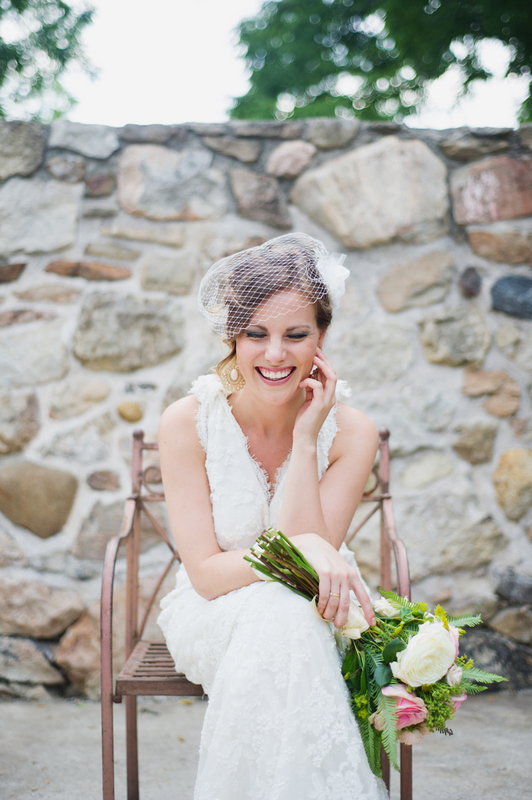 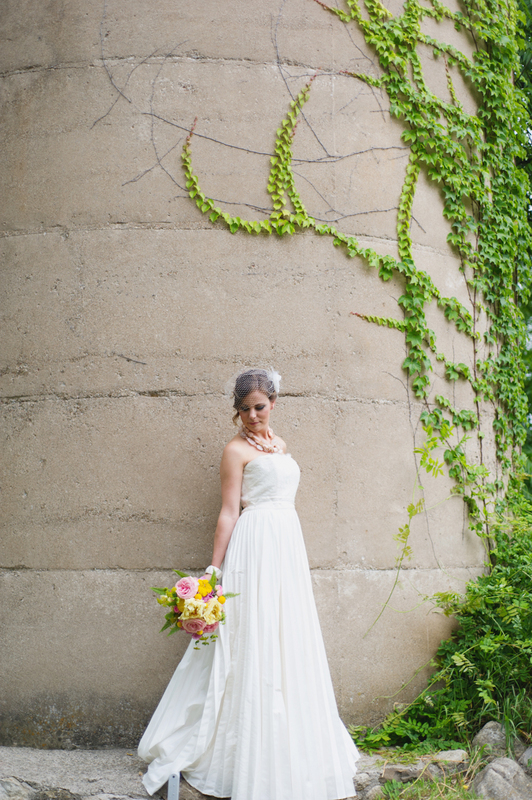 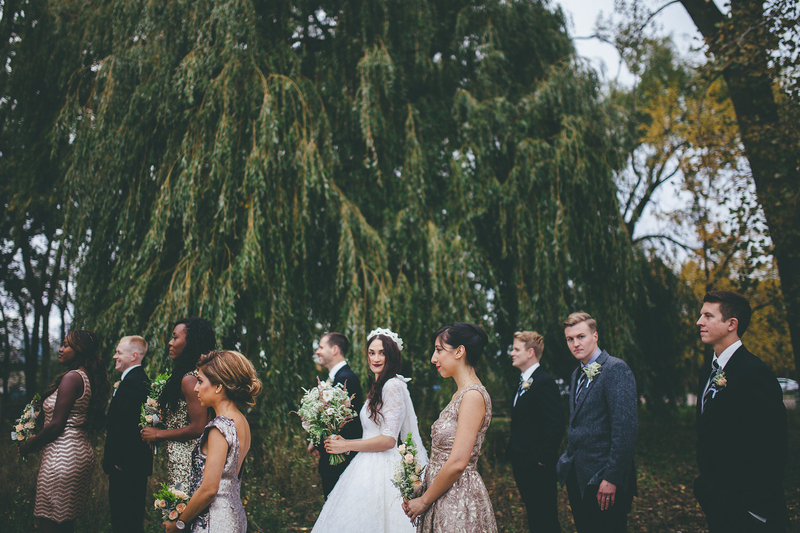 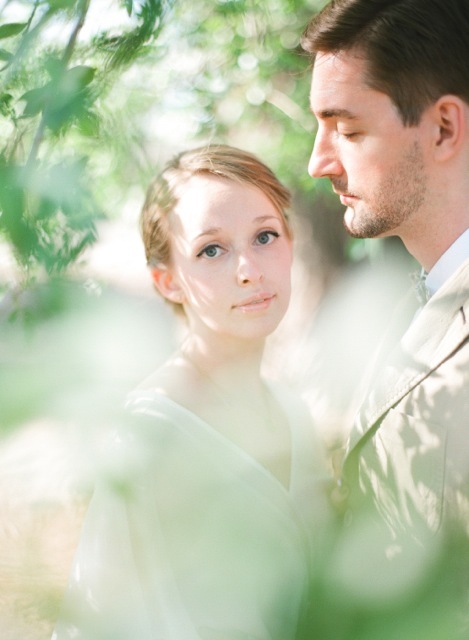 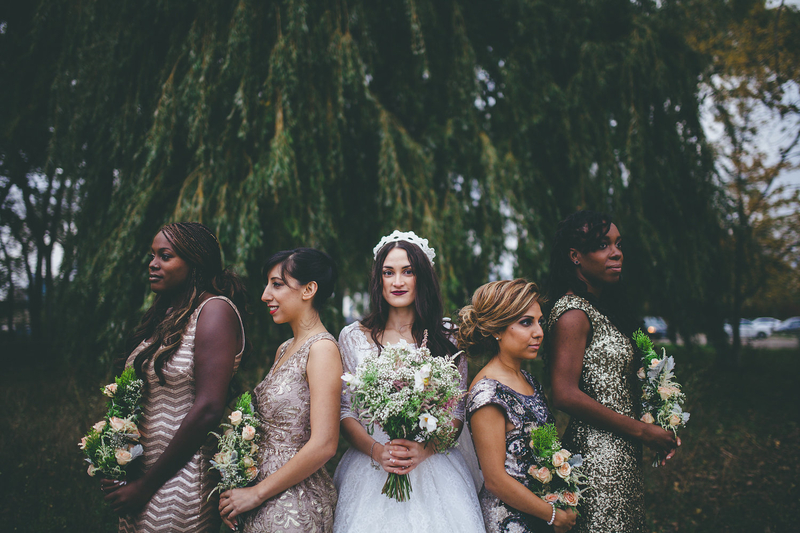 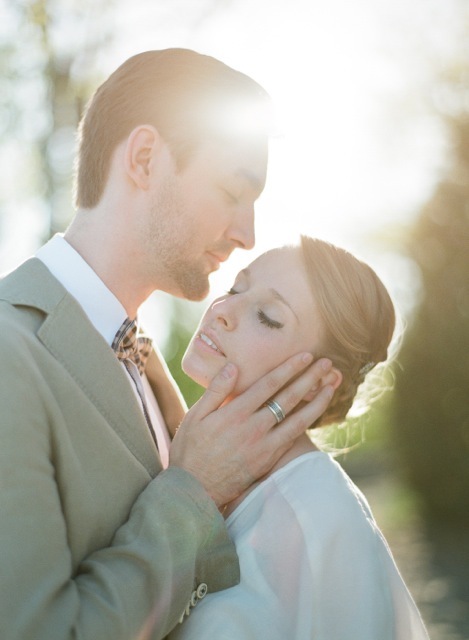 Evergreen Brickworks provides the backdrop for this wedding shoot. 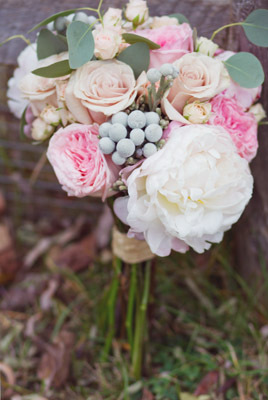 Pretty pastel blooms appearing in this bridal bouquet include peonies, garden roses, and sweetheart roses. 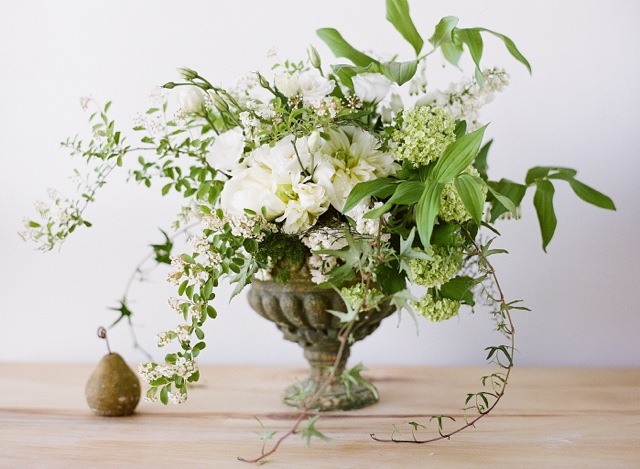 brezillia, hypericum berries, and eucalyptus add touches of cool silvery sage tones and texture. 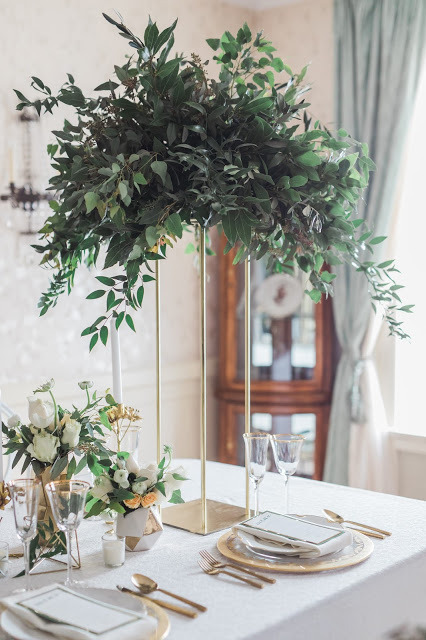 Centrepieces are a mix of garden roses, sweetheart roses, kale, pom pom mums, and seeded eucalyptus arranged in a birch wrapped vase. 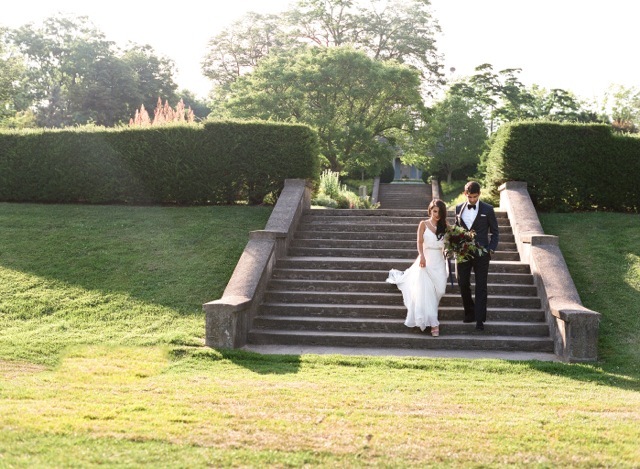 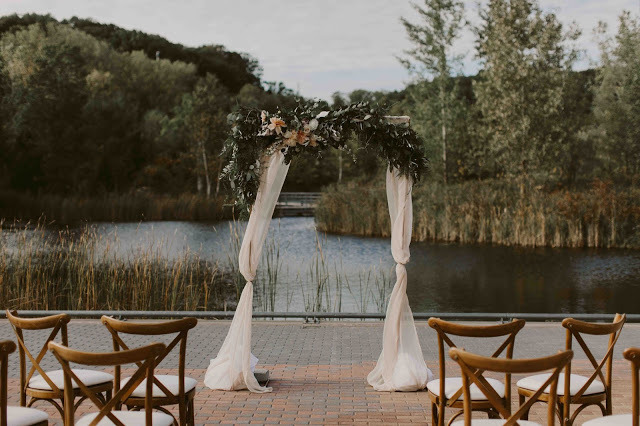 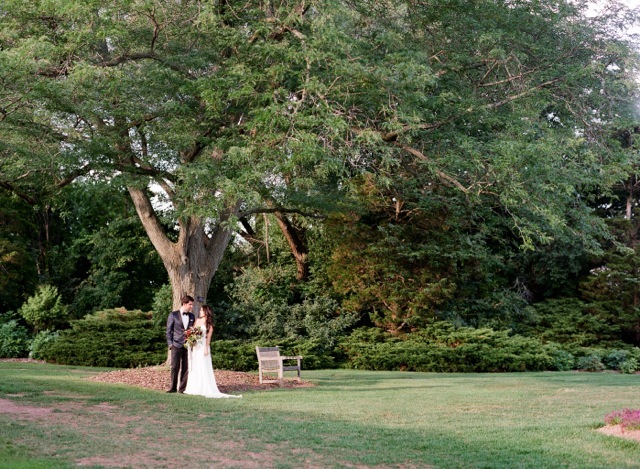 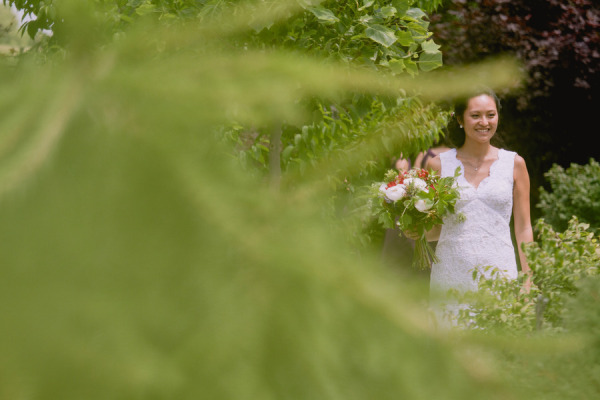 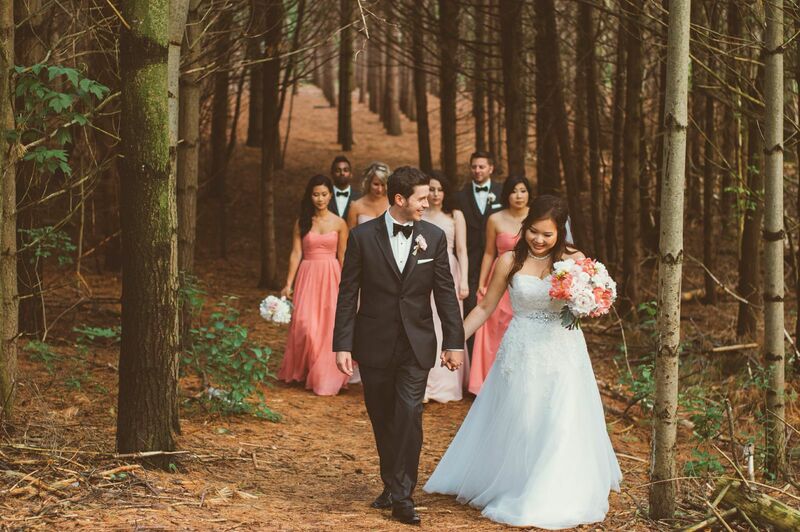 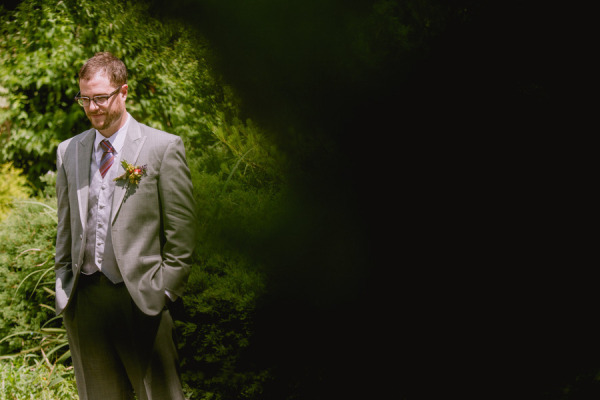 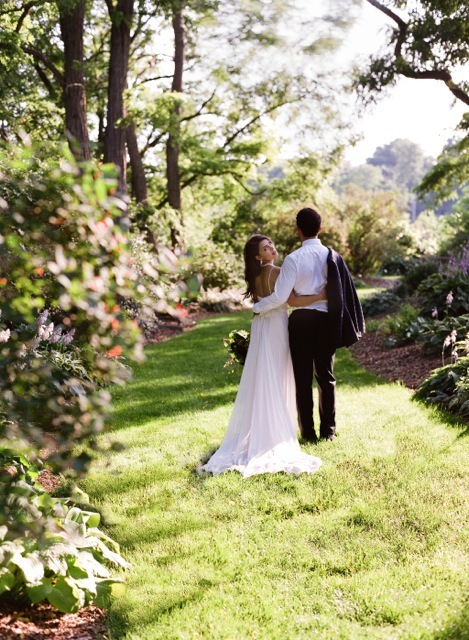 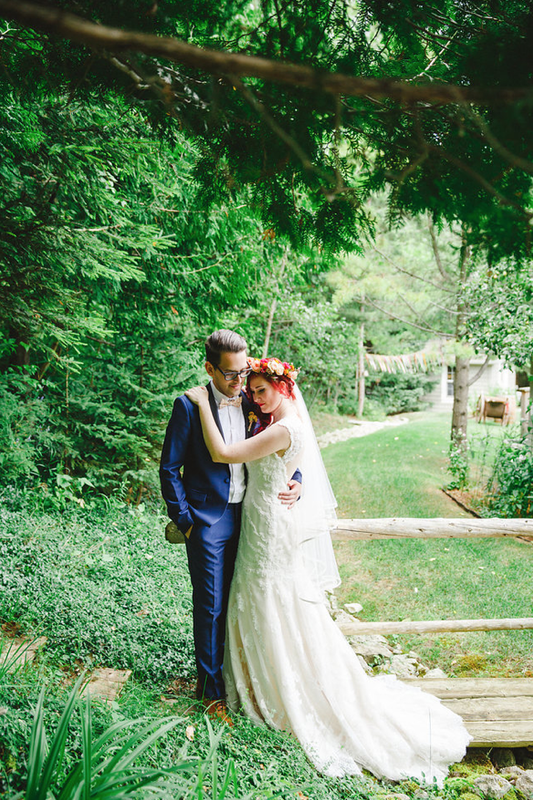 Kortright Centre provides the backdrop for this summer wedding. 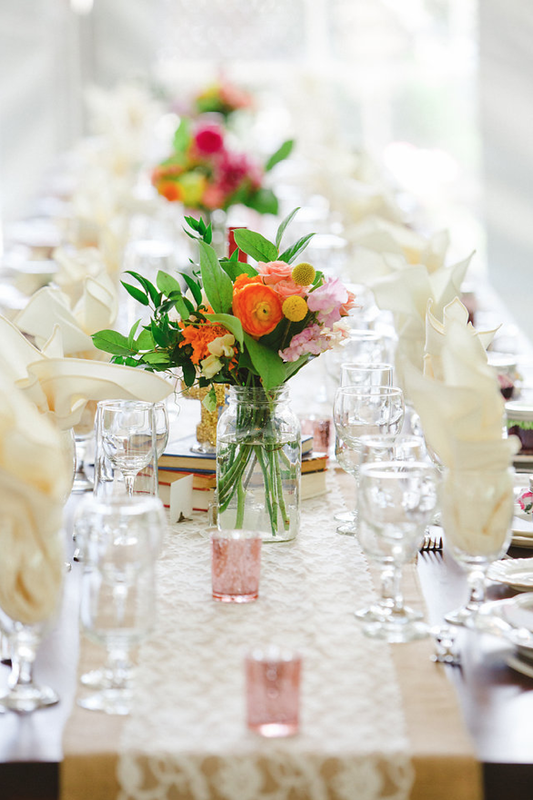 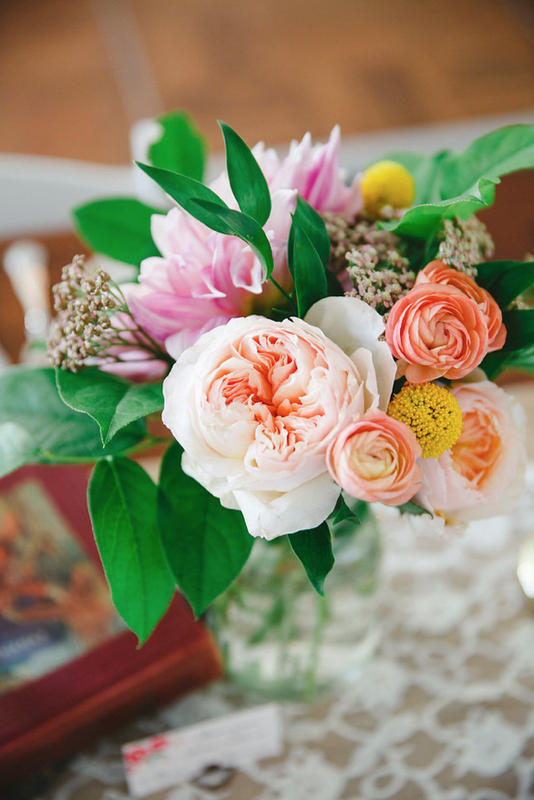 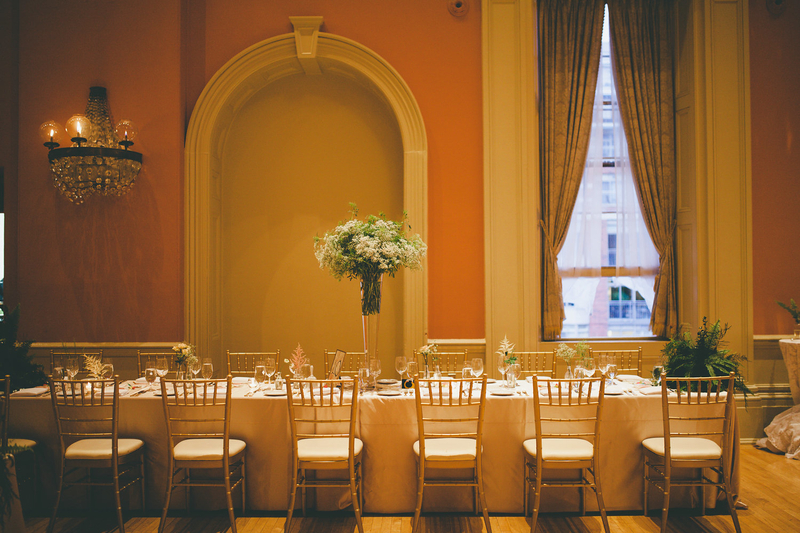 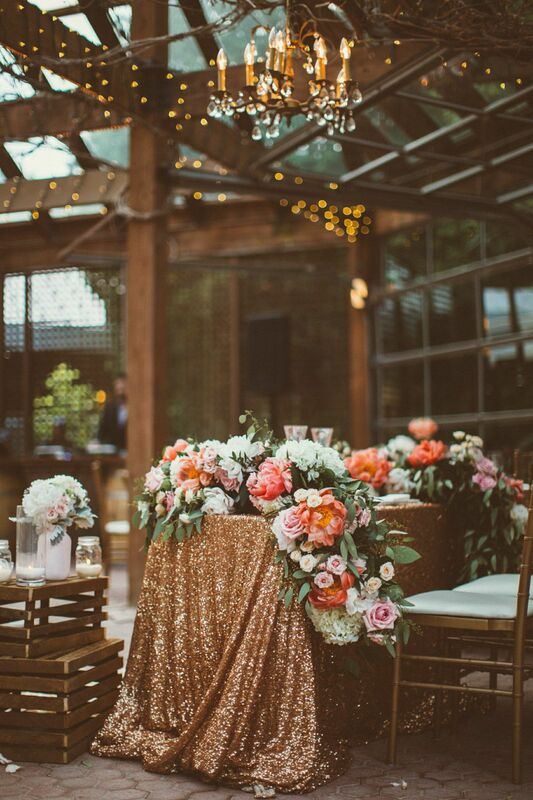 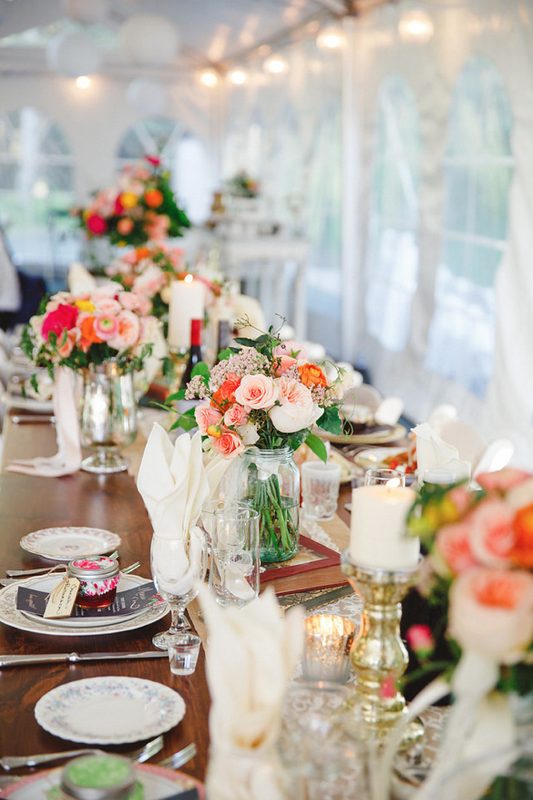 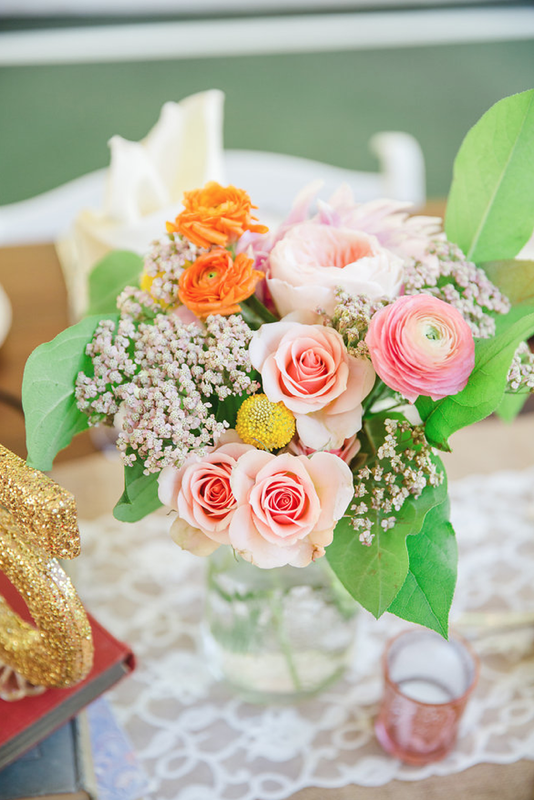 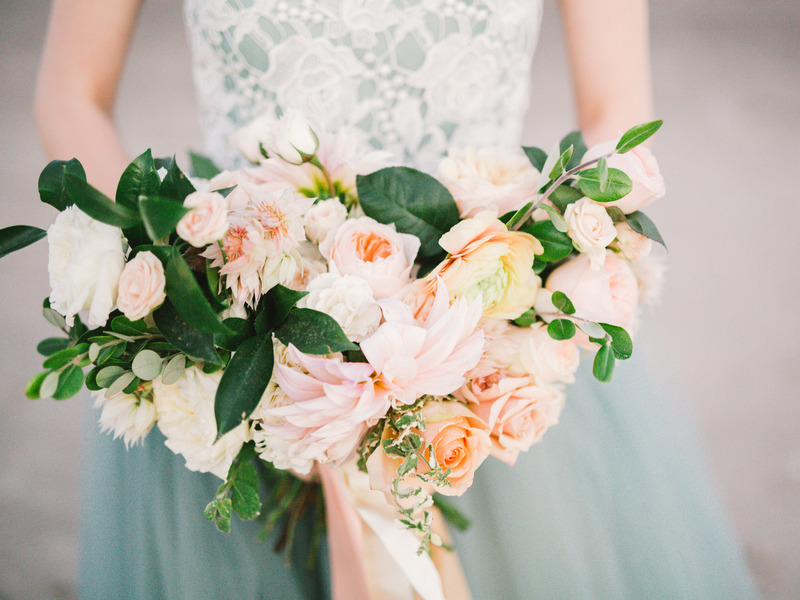 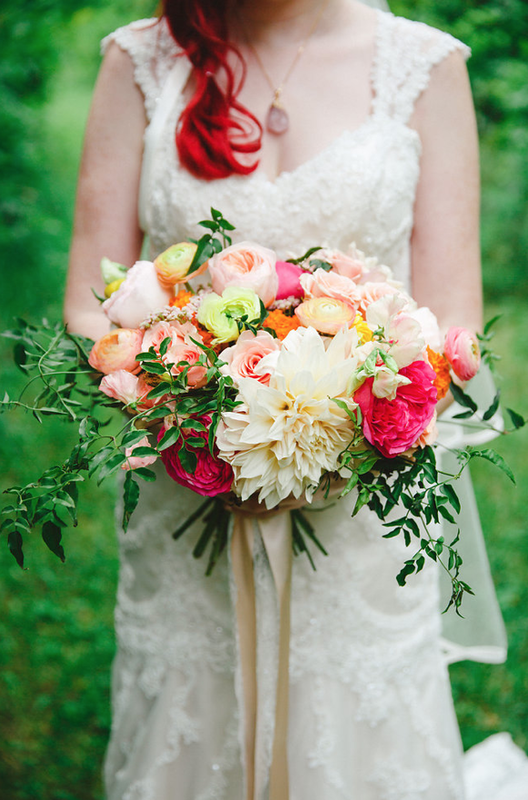 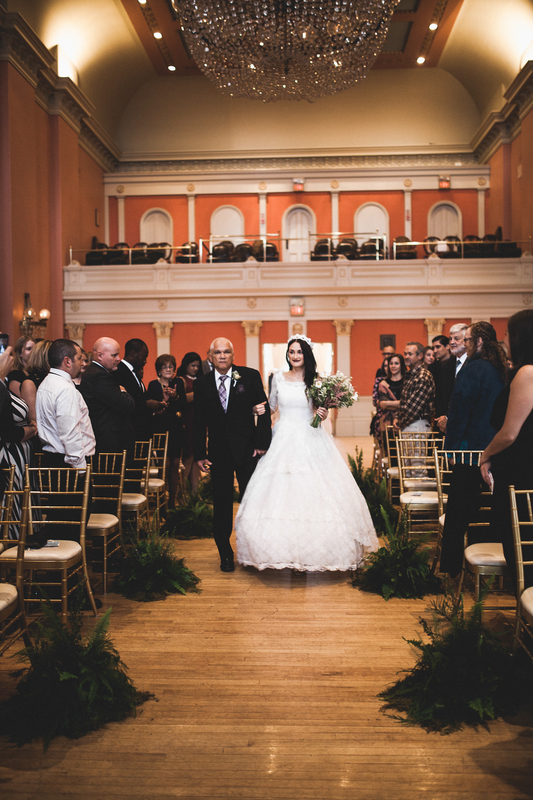 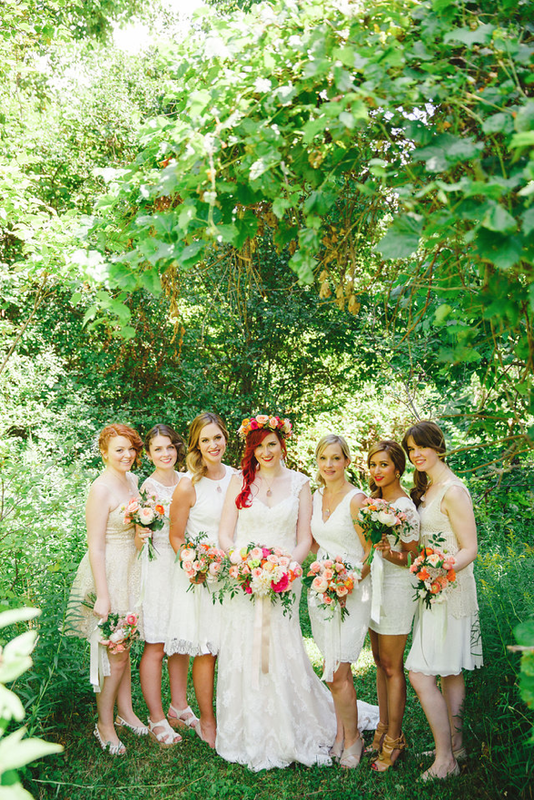 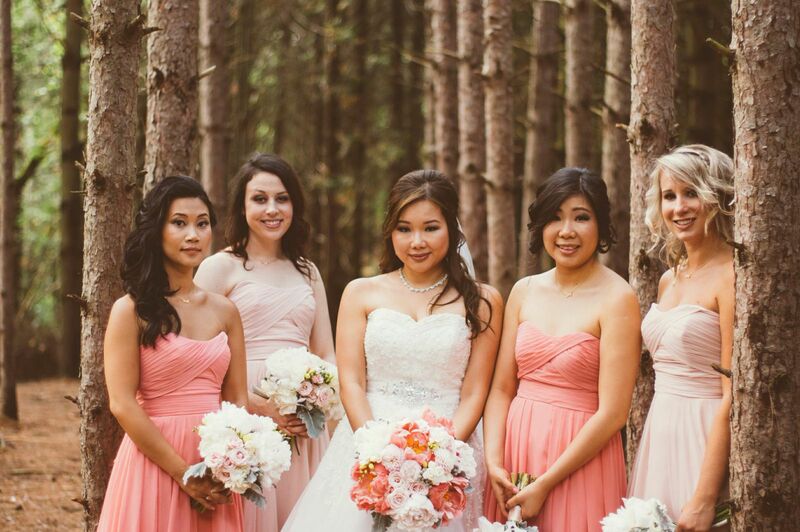 Pretty pastel blooms with pops of coral appear throughout this wedding. 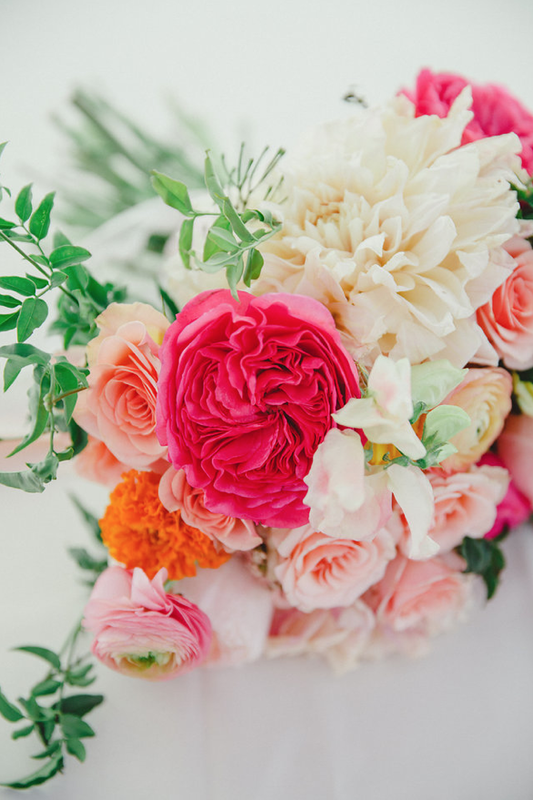 Flowers and foliage found in the bouquets, garlands, and centrepieces include peonies, pink charm peonies, garden roses, sweetheart roses, dahlias, brunia, freesia, and dusty miller. 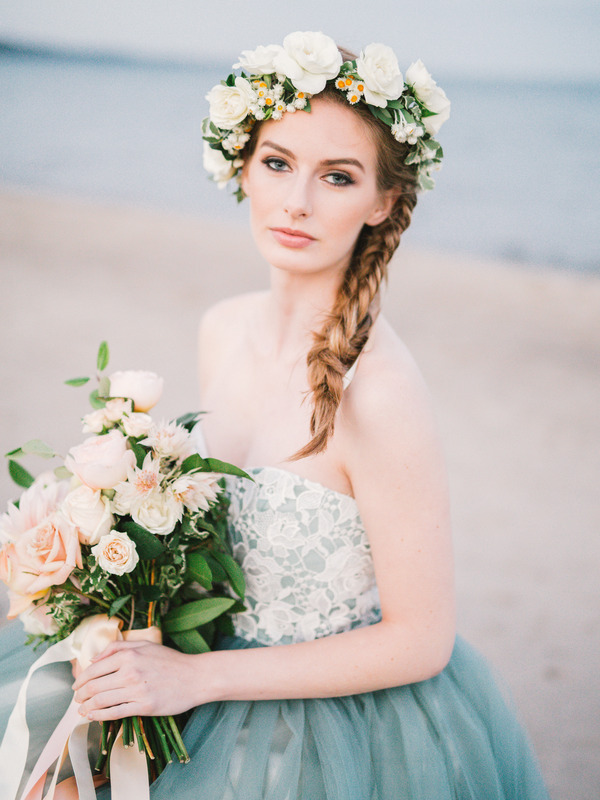 Mid-summer dreaminess inspired by vintage and quirky colours. 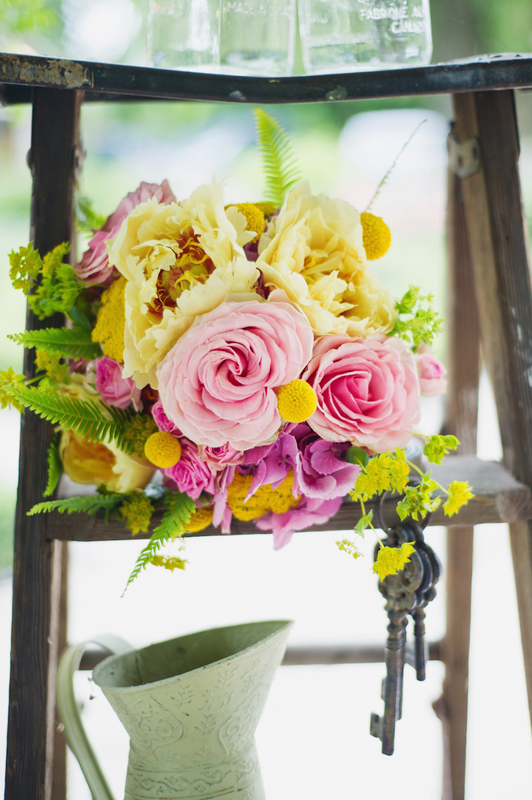 I can't help but see these pops of bright yellows and pinks as bubble gum and lemonade. 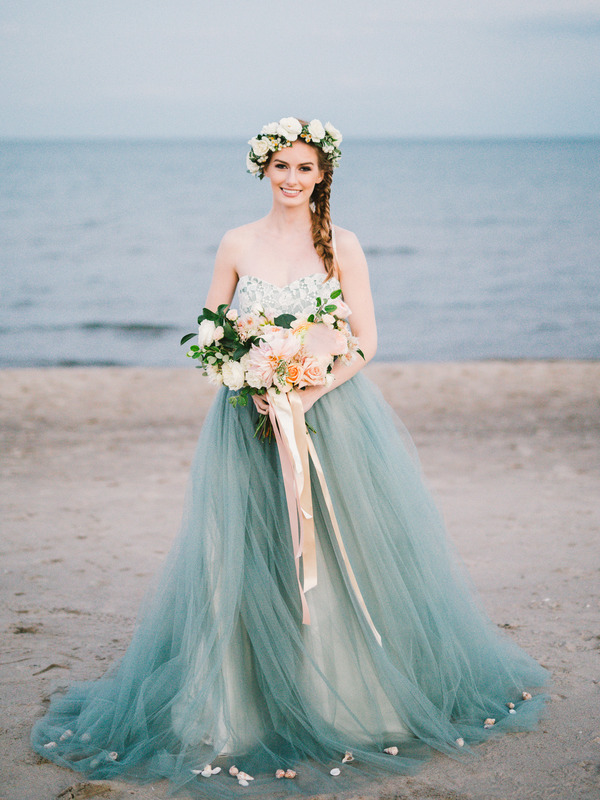 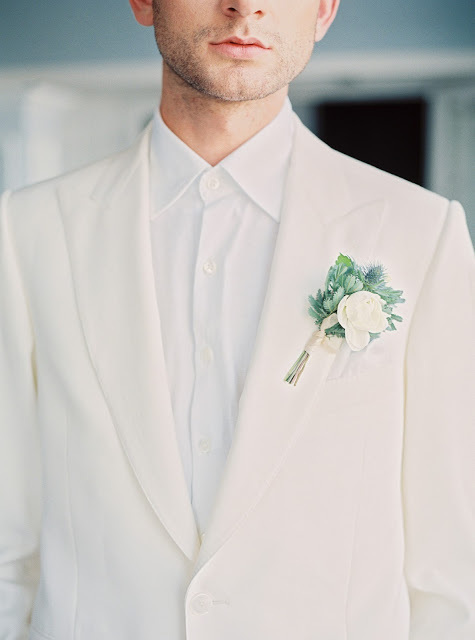 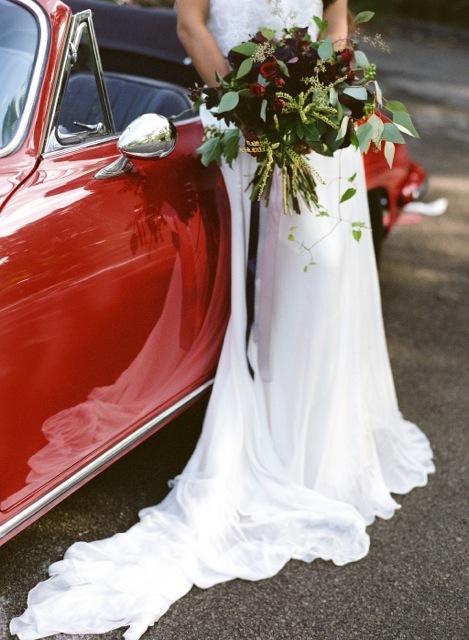 A perfect colour combination for a summer wedding! 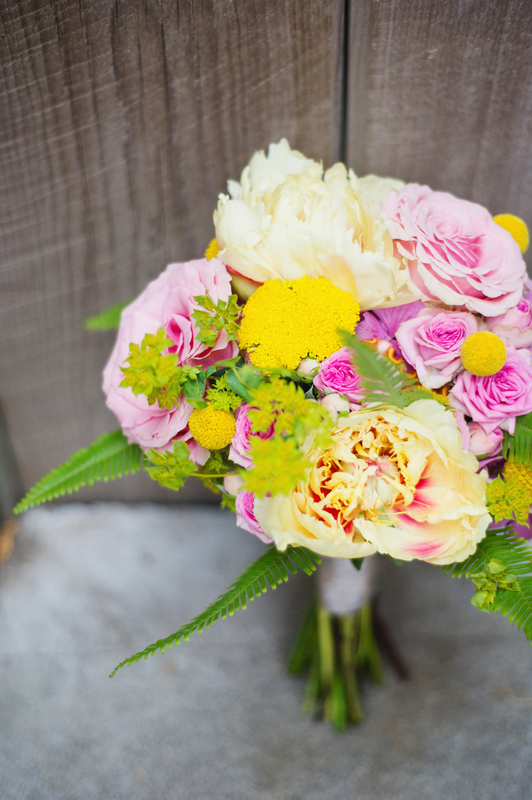 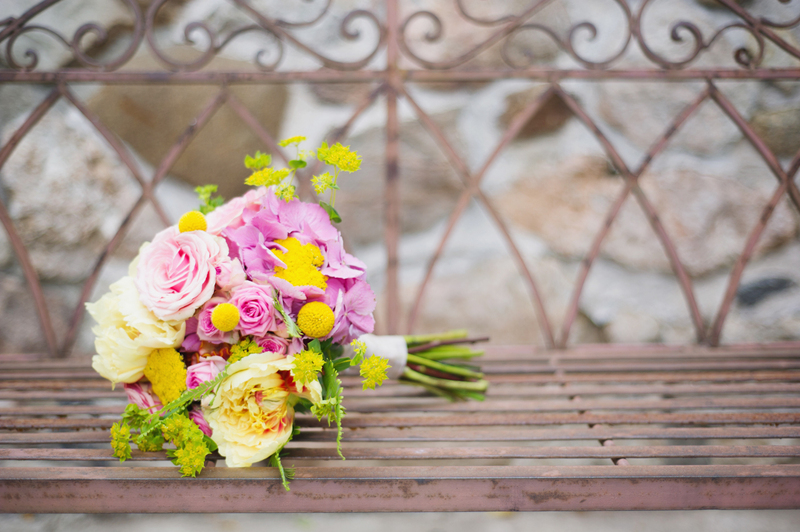 Flowers & greenery include Tree peonies, Geraldine roses, yarrow, bupleurum, umbrella fern, billy balls, hydrangea, spray roses, Queen Anne's lace, and dahlias. 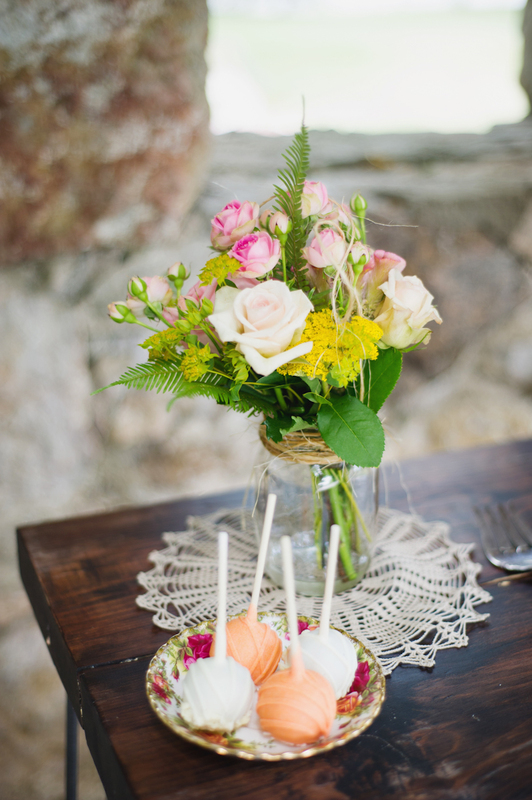 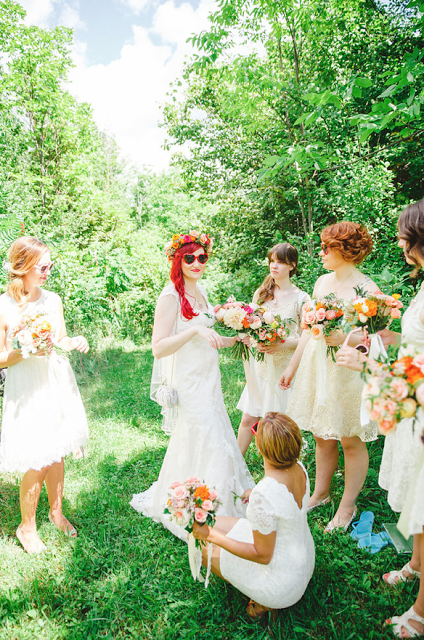 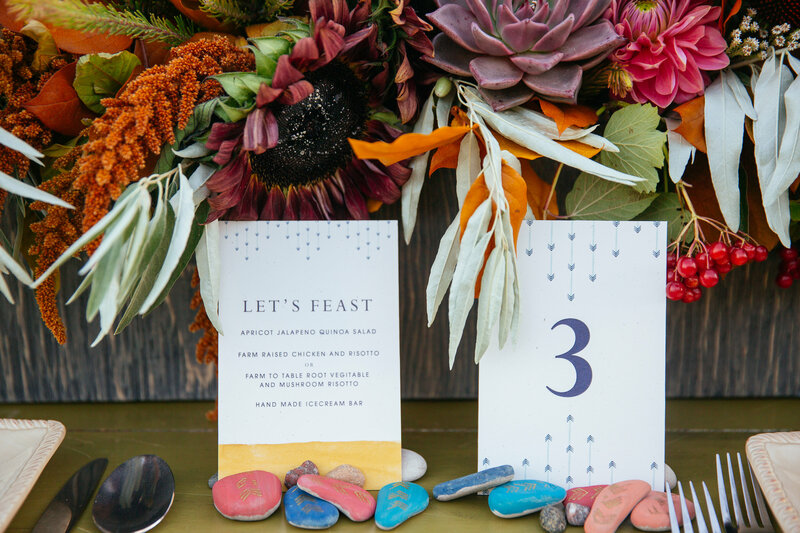 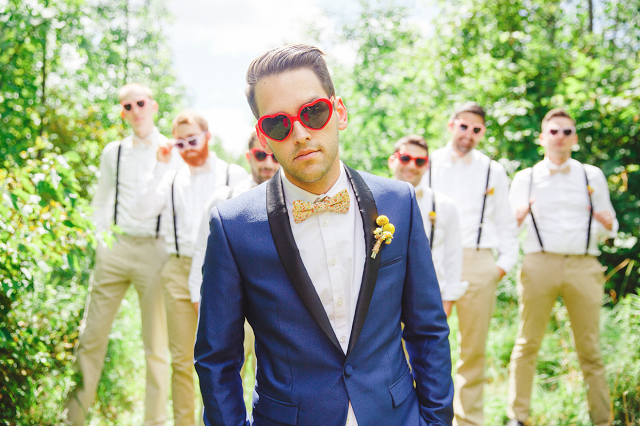 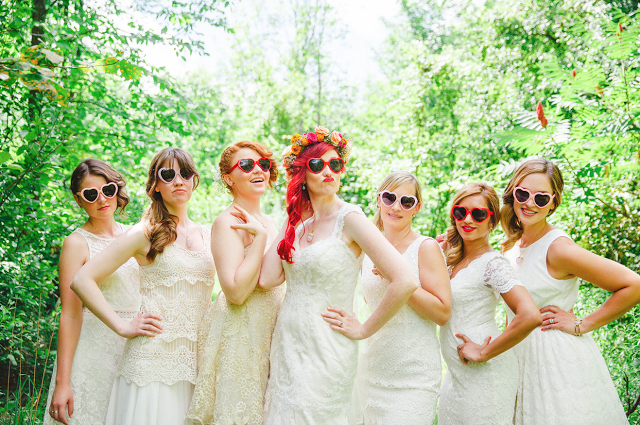 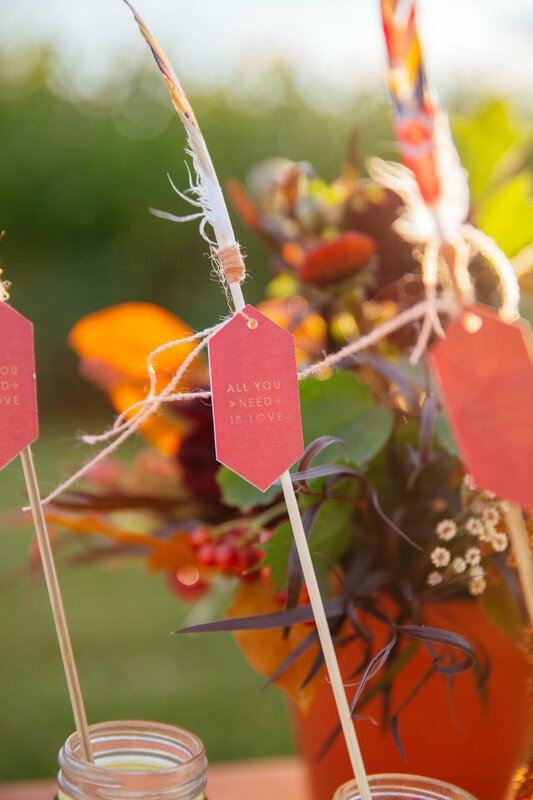 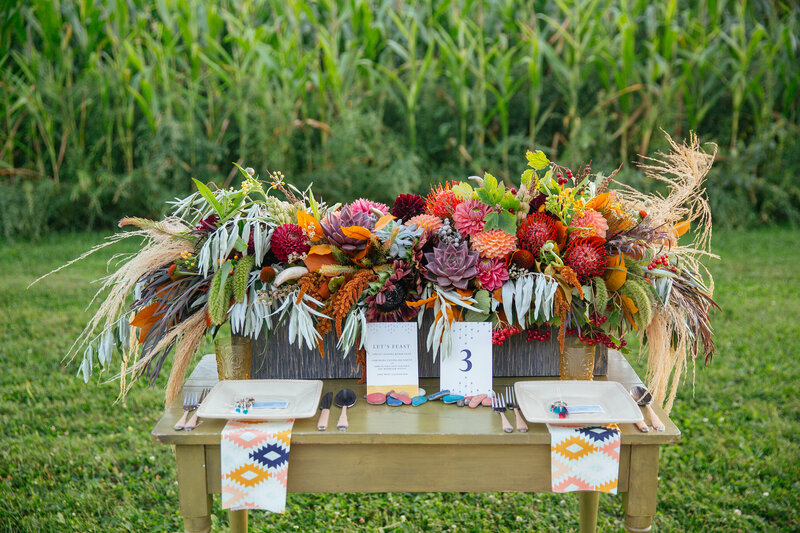 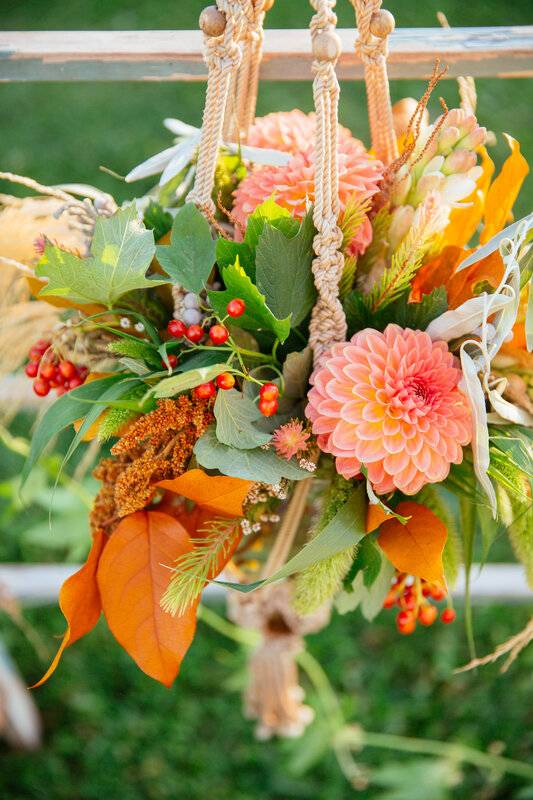 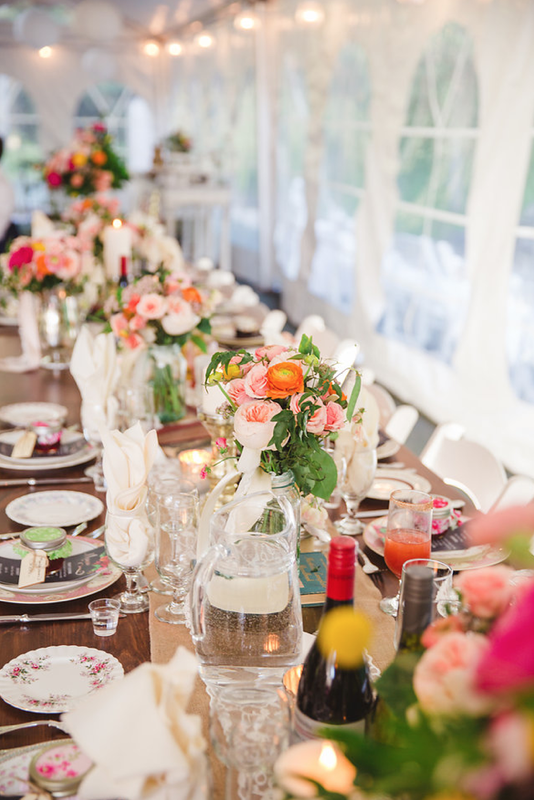 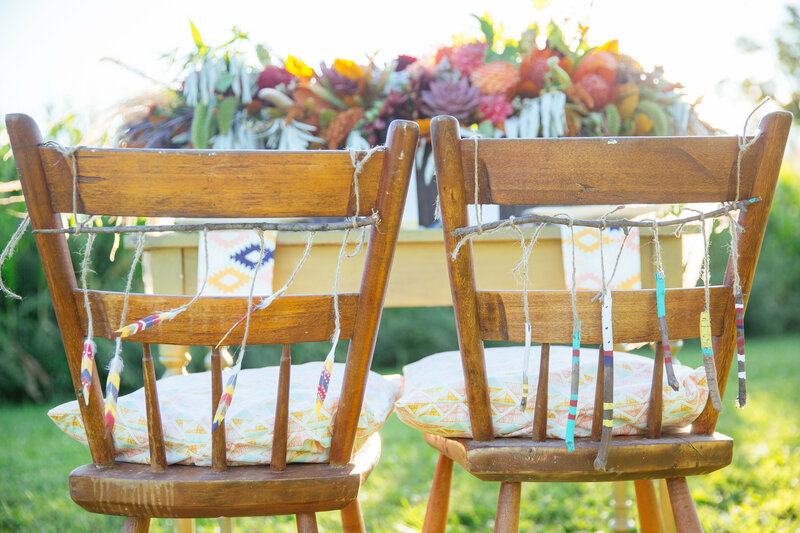 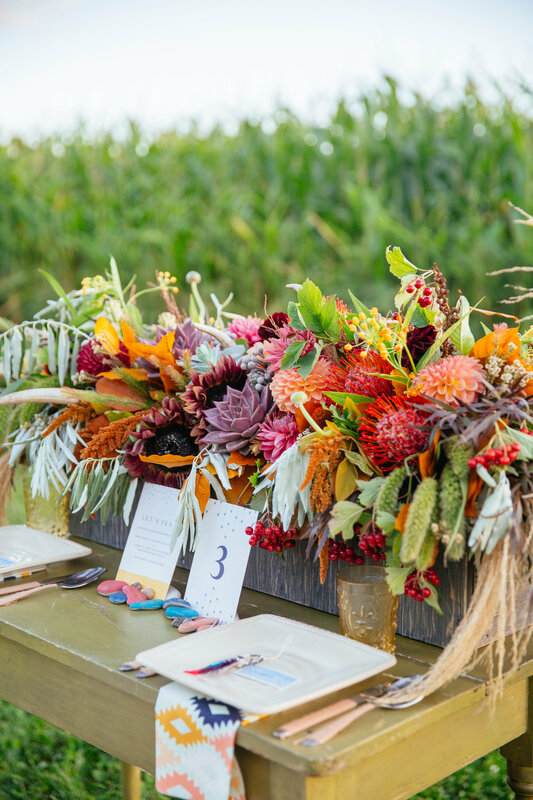 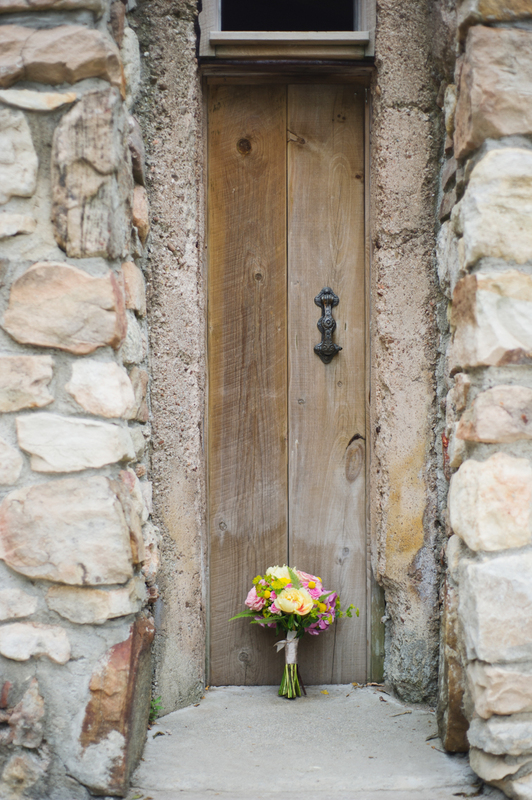 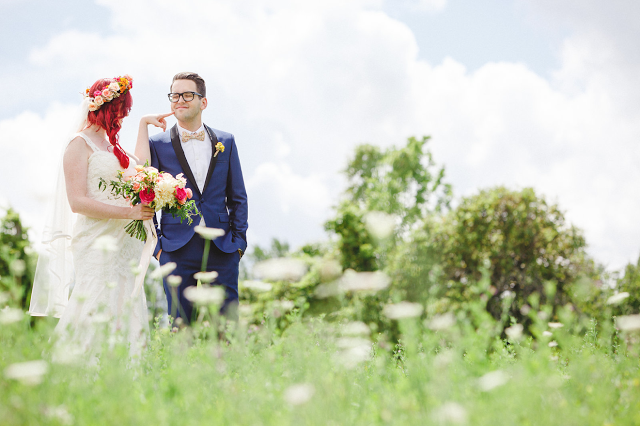 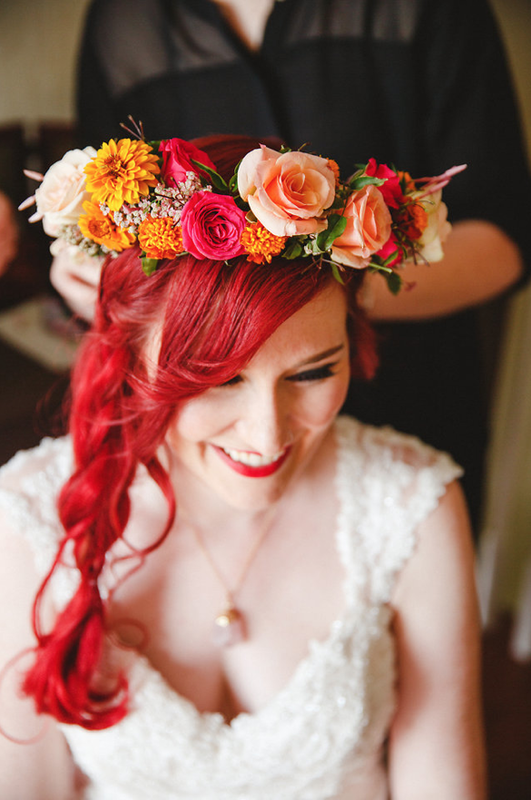 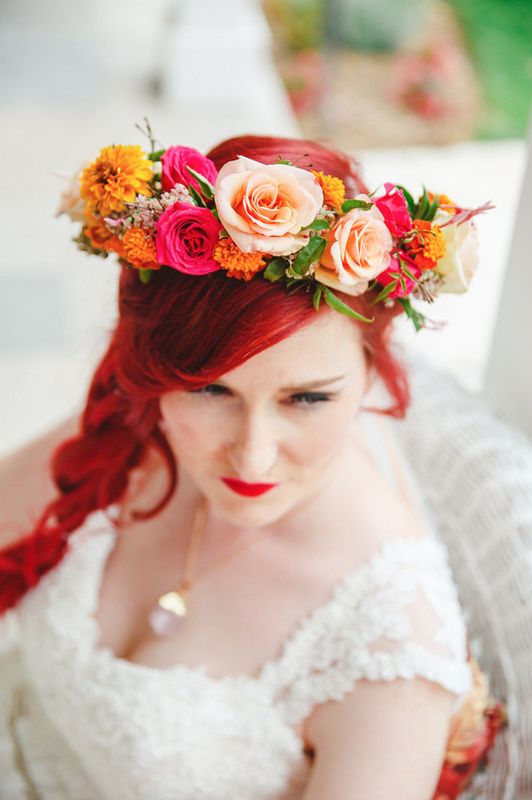 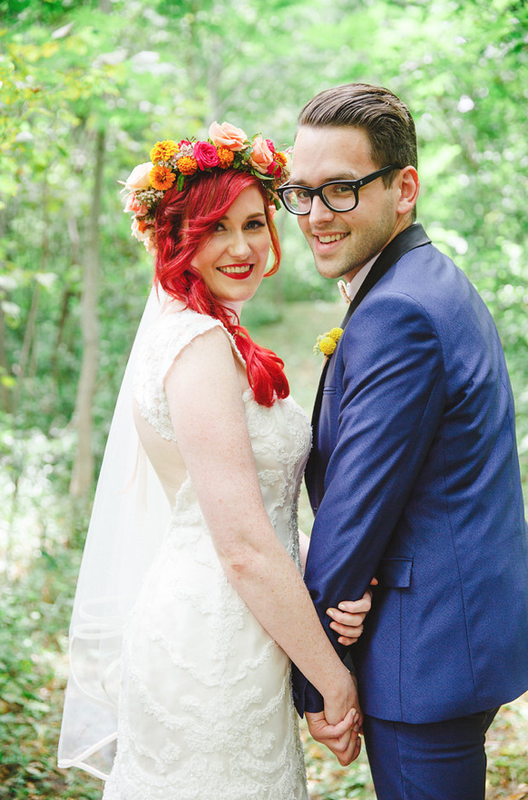 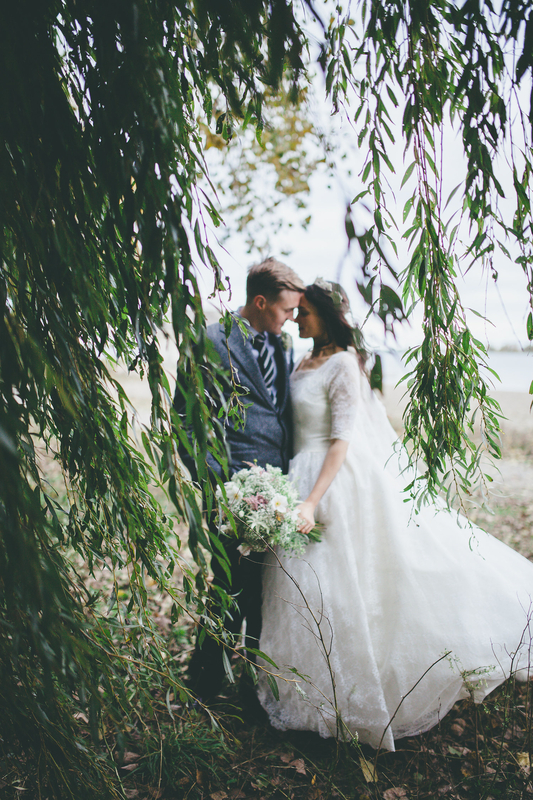 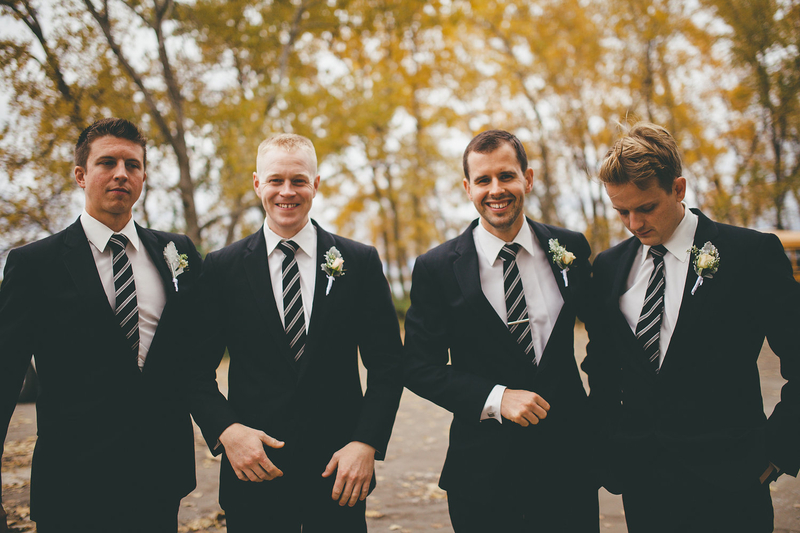 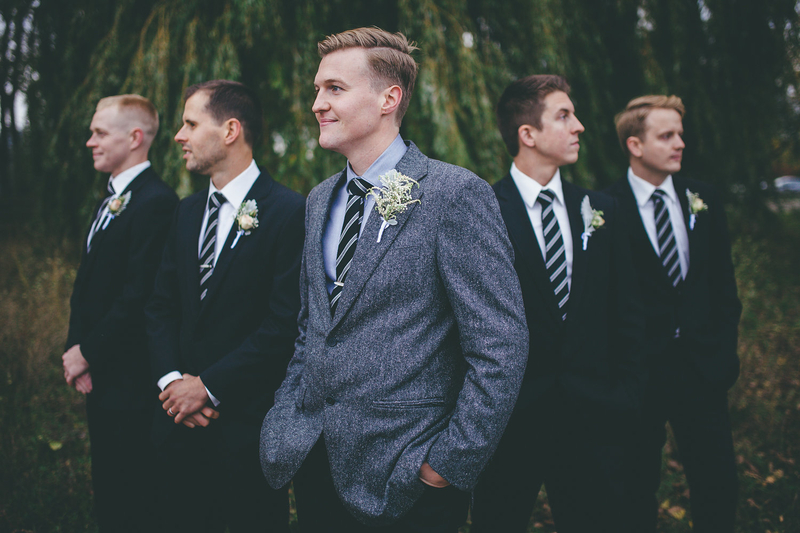 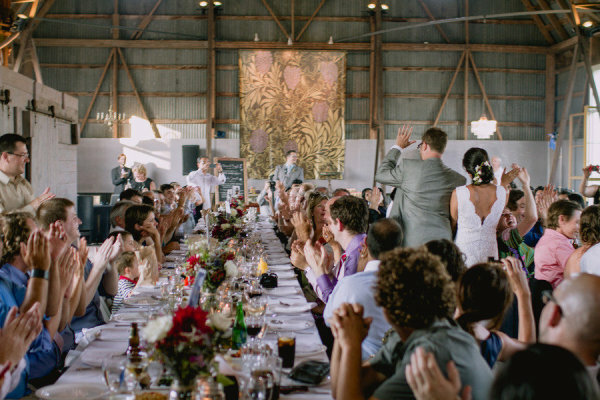 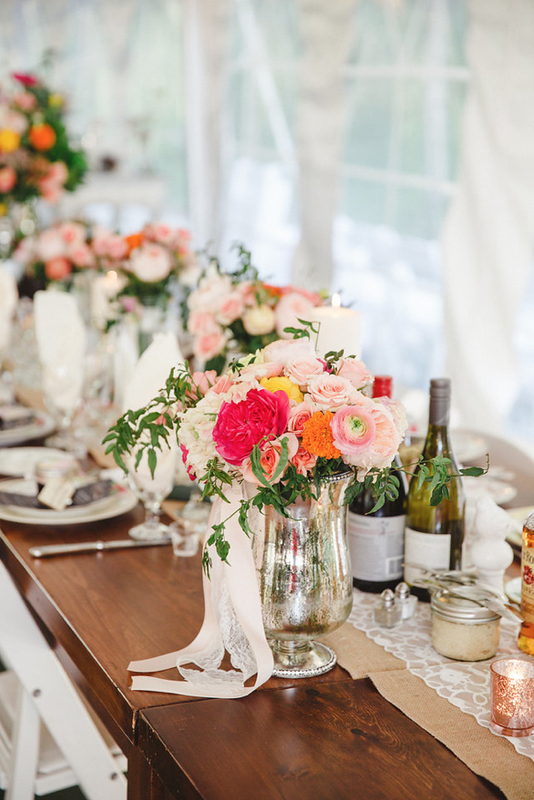 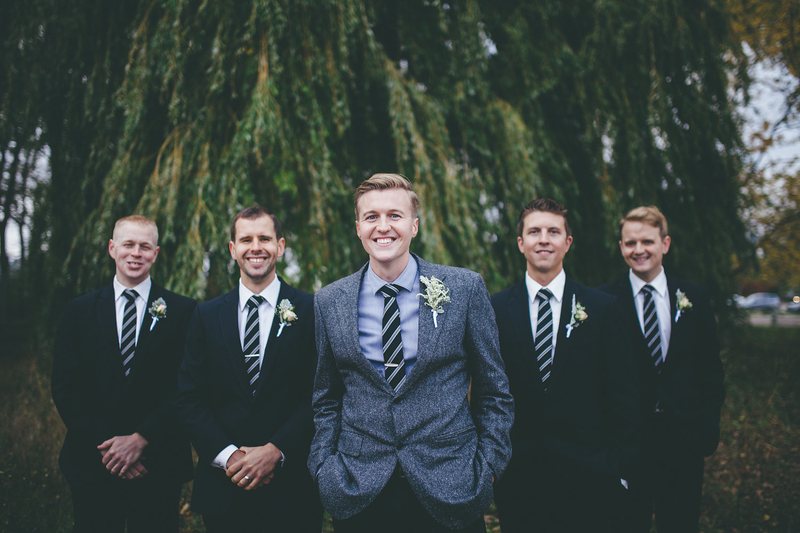 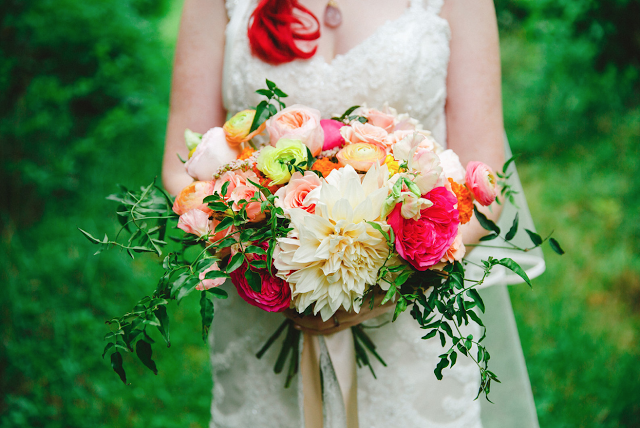 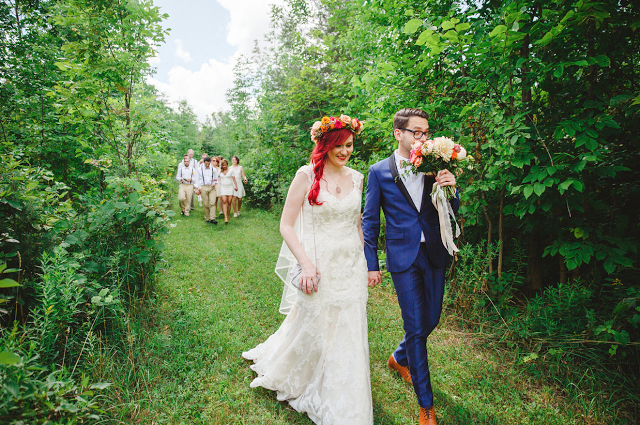 This was one colourful wedding located at a family's cottage in Collingwood. 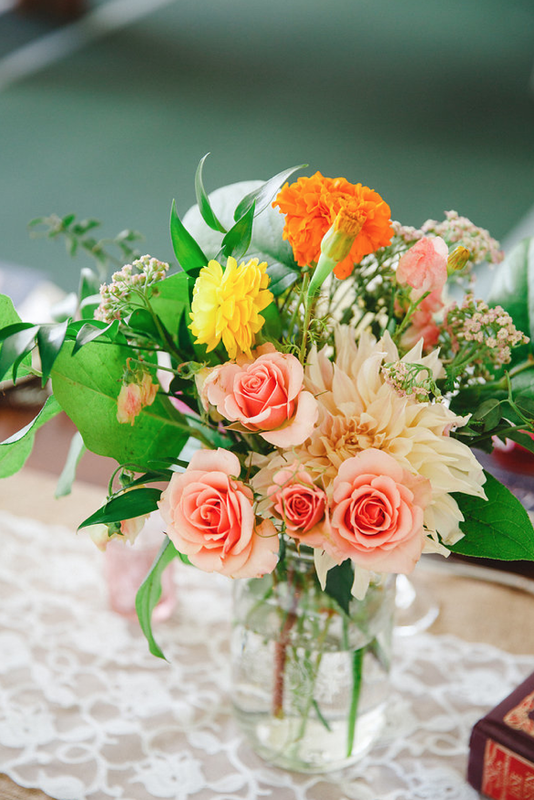 Vibrant florals match their fun personalities! 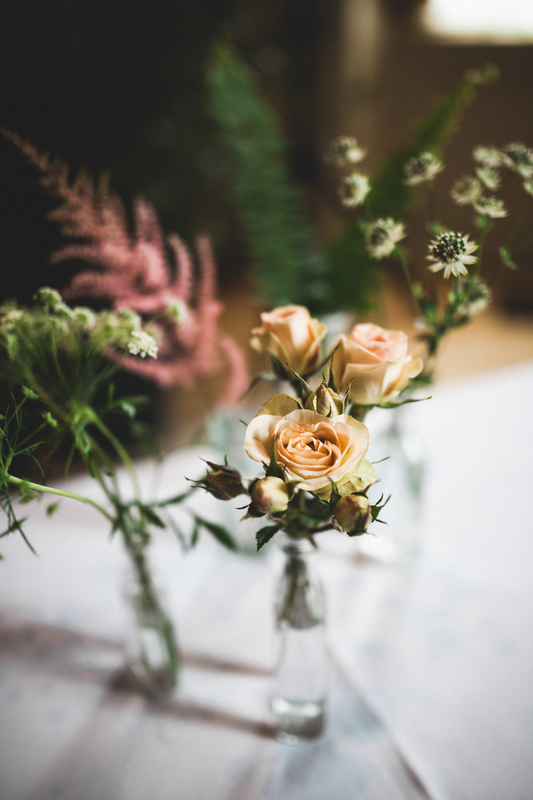 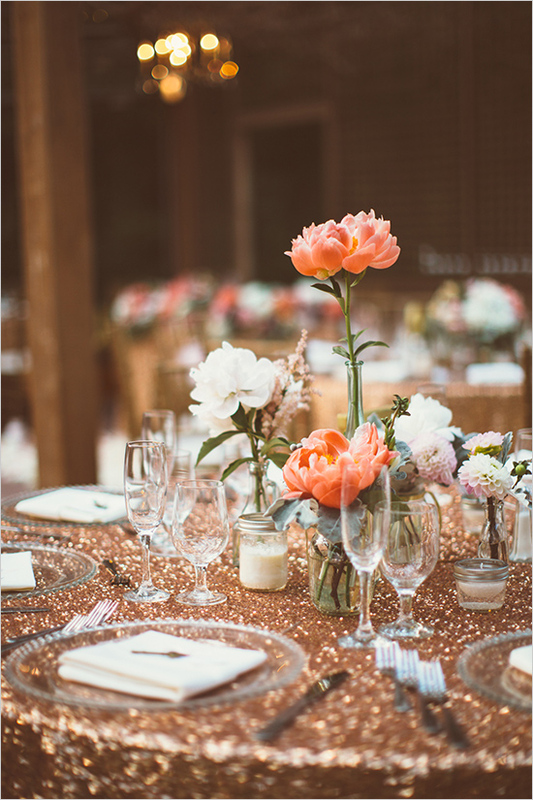 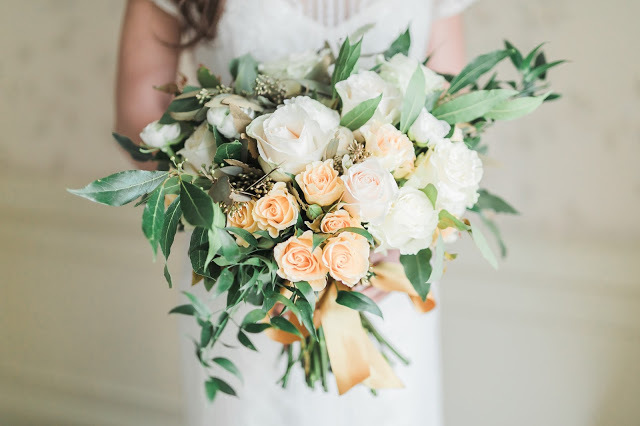 Flowers found throughout the wedding included roses, garden roses, marigolds, jasmine vine, billy balls, dahlias, sweet peas, ranunculus, and yarrow. 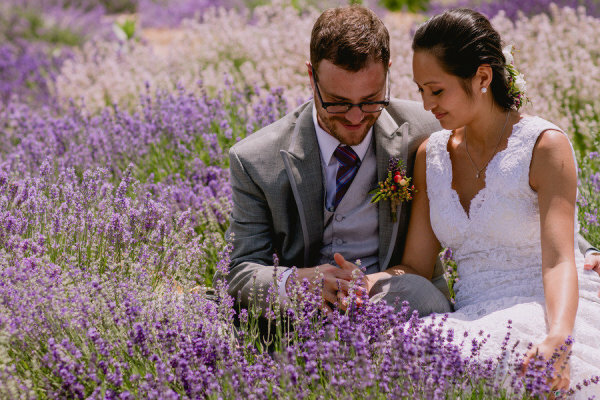 This lovely summer wedding at Scott's Bar - a lavender farm located outside of Toronto, offering a little bit of Provence in Ontario. 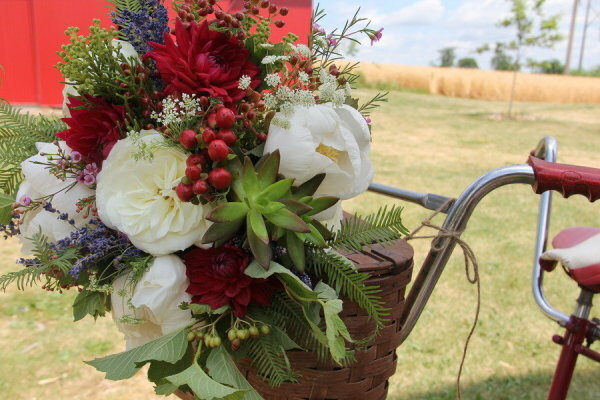 The wedding colours were red, white, and purple, pulling colours from the surrounding farm. 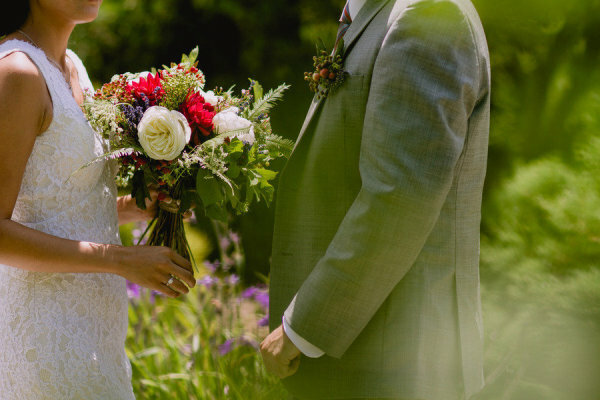 For the wedding florals, we combined fresh lavender from the farm, pops of bold red blooms, luscious large white blooms, with whimsical fillers and foliage to give the wedding an organic feel and to match their venue perfectly! 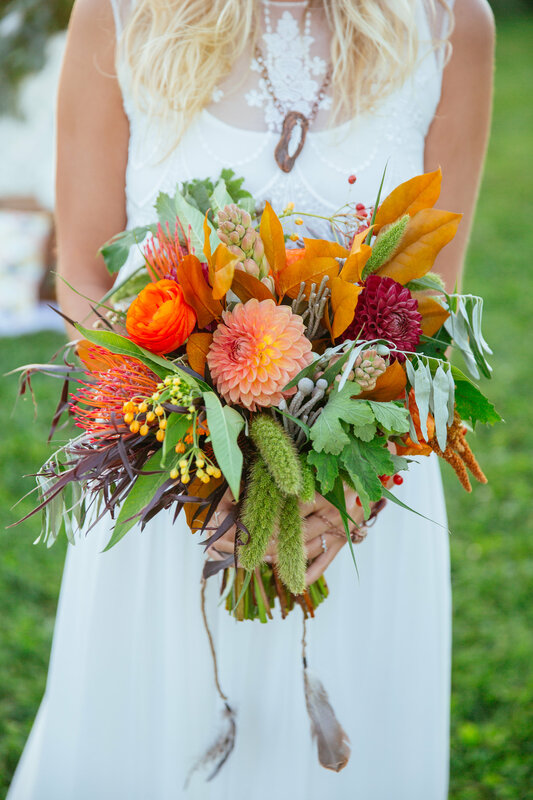 For her bouquet, the bride wanted a fuller organic gathered bouquet that included both larger blooms and field flowers. 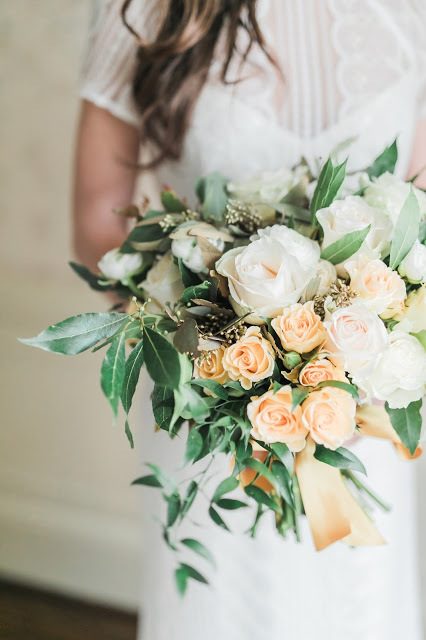 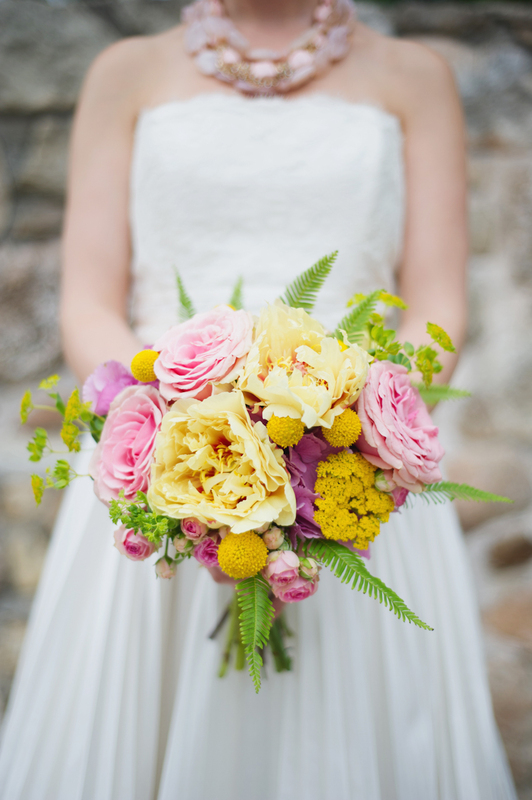 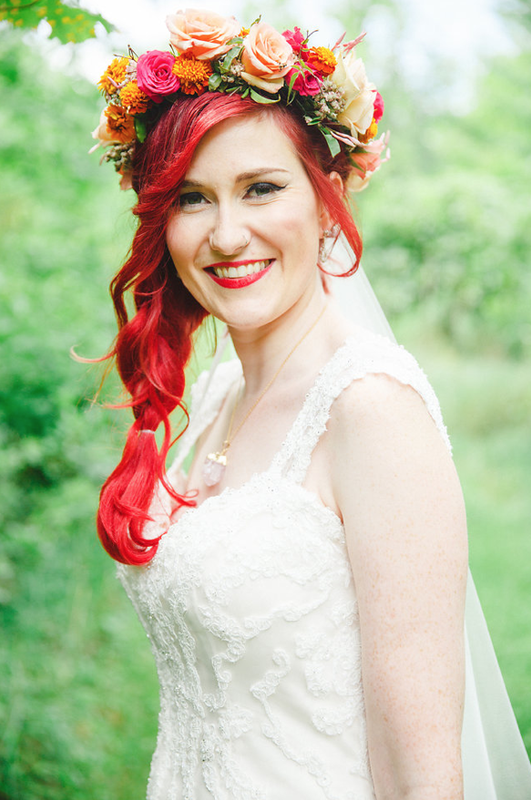 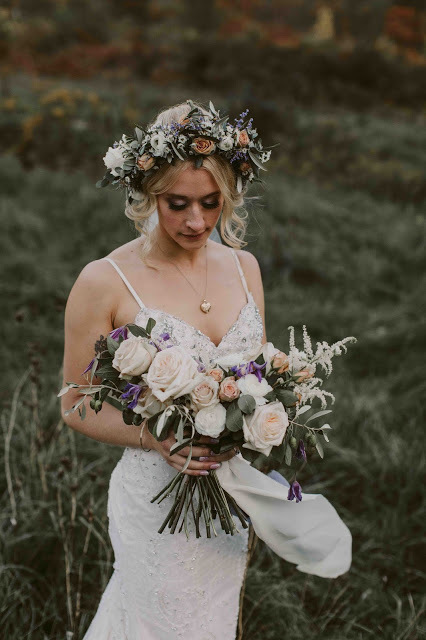 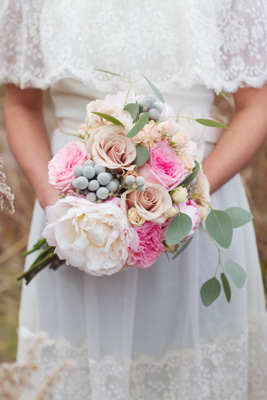 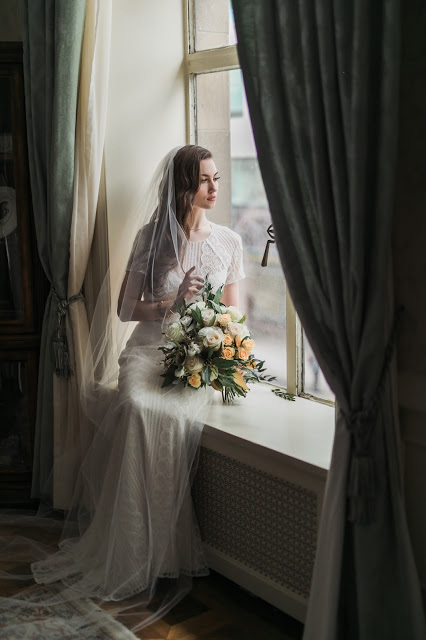 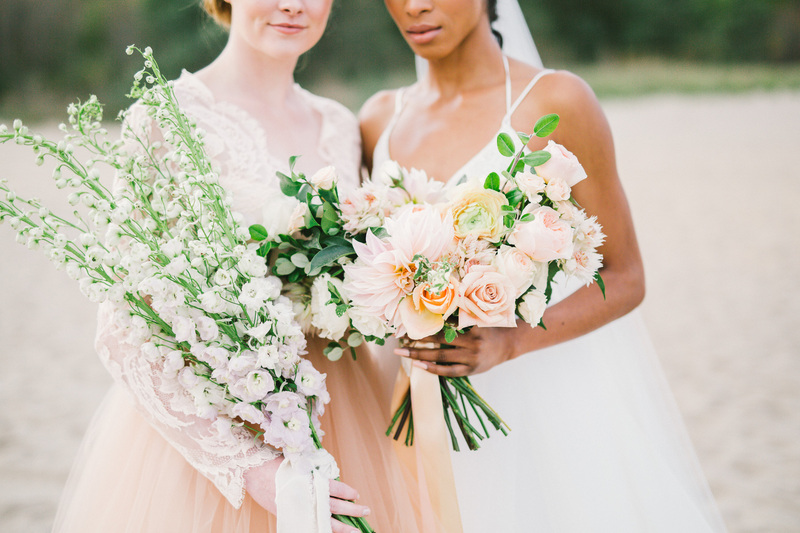 Her bouquet is made up of dahlias, garden roses, peonies, lavender, hypericum berries, berzilia, ferns, viburnum berries, succulents, Queen Anne's lace, lavender, and other seasonal filler flowers. 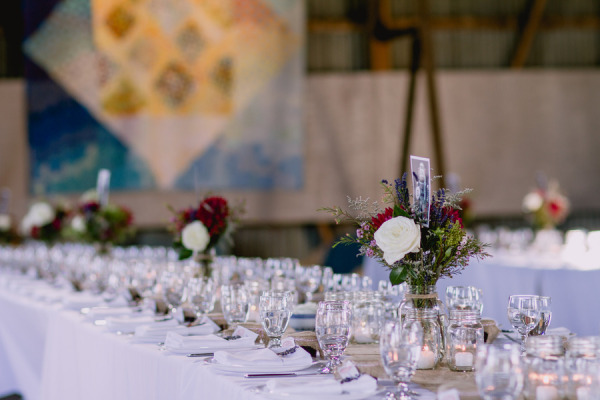 Centrepieces of dahlias, ferns, hypericum berries, lavender, and filler flowers arranged in mason jars lined the tables inside the barn. 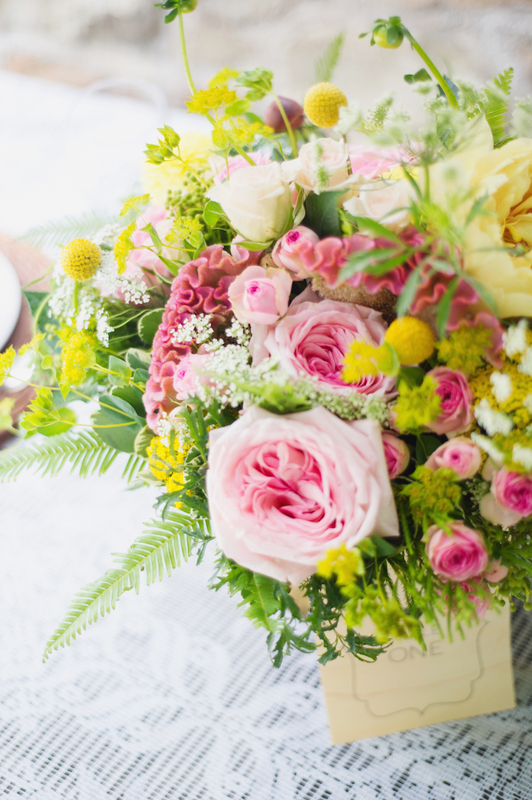 Random blooms, like dahlias, were found floating in traditional Chinese tea cups and on food platters. 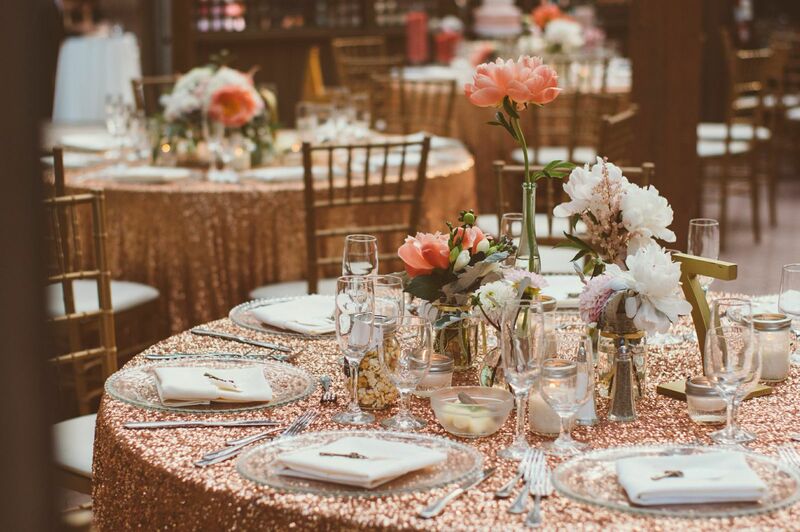 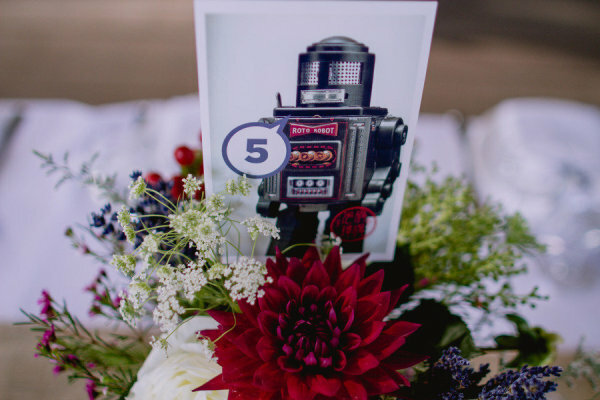 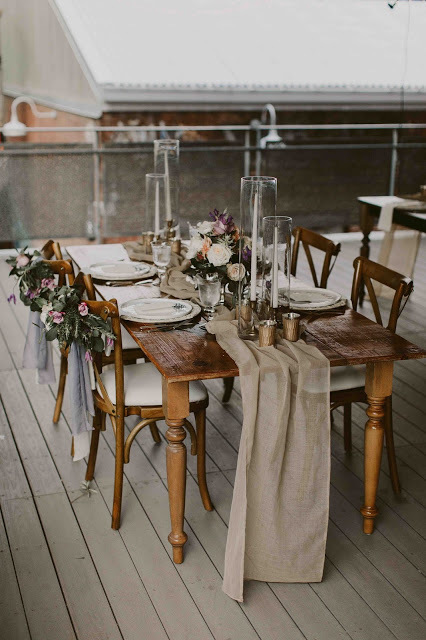 This mid-summer wedding at Steam Whistle Brewery features luxious table settings with rustic touches. 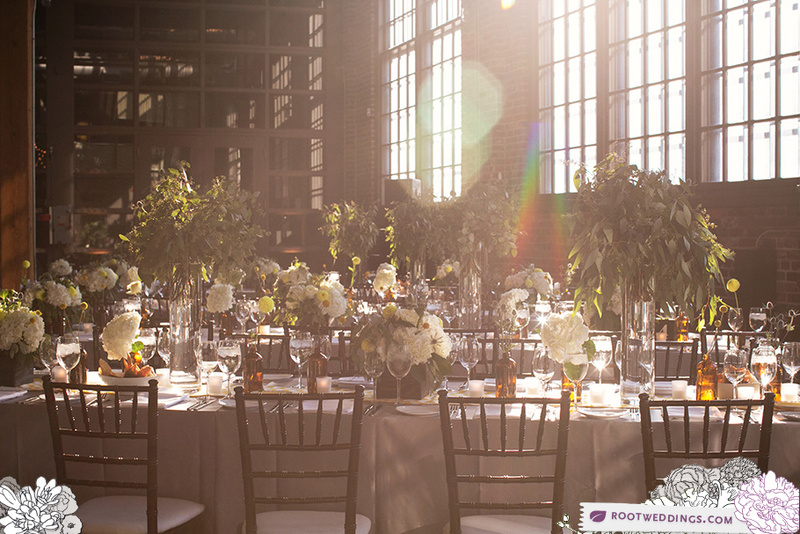 The wedding colours were yellow, white, silver, and navy, set againgst the beautiful exposed bricks and beam of the venue. 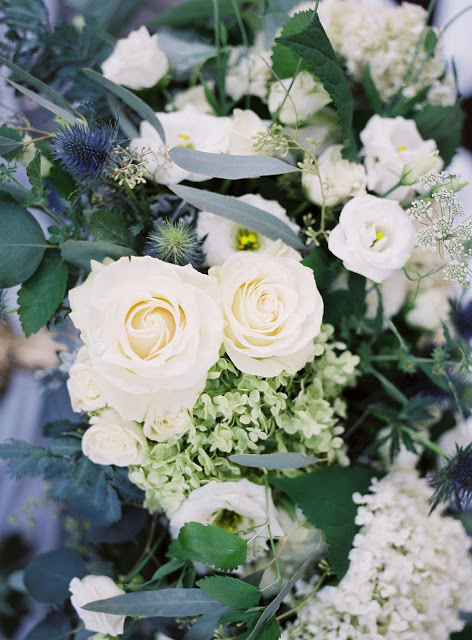 For the wedding florals, we combined luscious large white blooms, such as hydrangeas and garden roses, and pops of yellow dahlias and billy balls, with silver foliage and blue thistle. 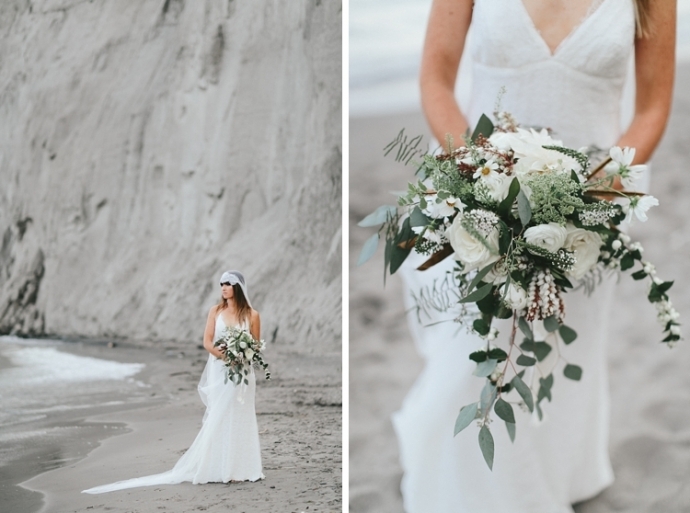 For her bouquet, the bride wanted a fuller gathered bouquet that included larger blooms like peonies, dahlias, and garden roses, with billy balls, eryngium thistle, seeded eucalyptus, and dusty miller draping slightly over her hands at the base of the bouquet. 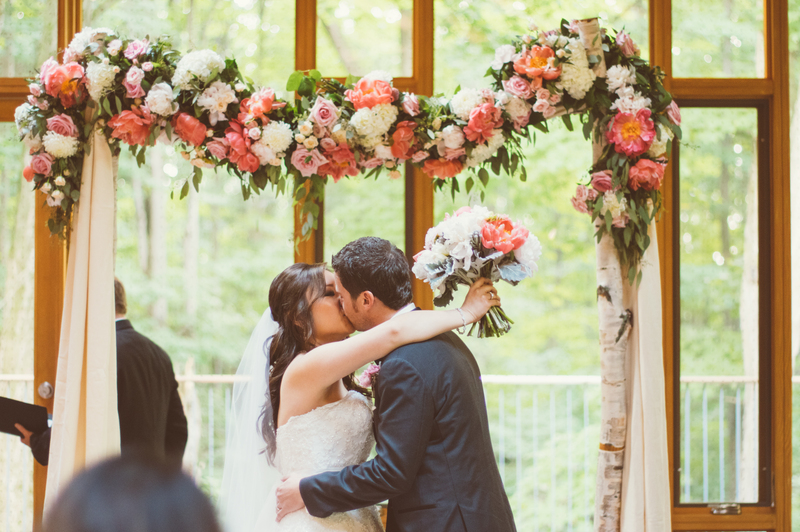 A full garland was draped across the couple's sweetheart table. 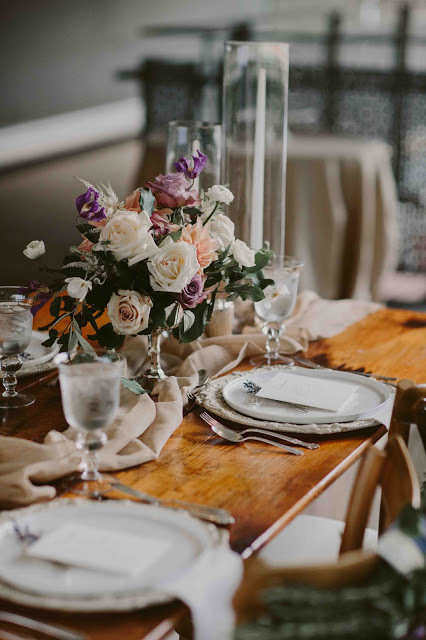 Much of the appeal of this wedding was its amazing tablescapes - Larger mixed floral centrepieces were arranged in custom wood boxes, towering arrangements of seeded eucalyptus and thistle, and squatty amber jars filled with blooms lined the centre of the tables. 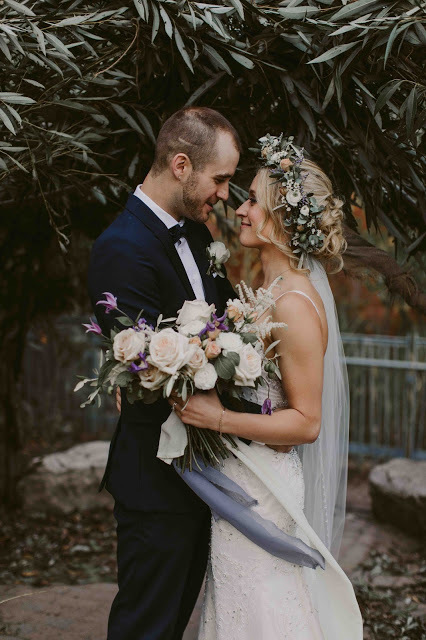 This sweet wedding at Auberge du Pommier featured larger romantic blooms, like roses and ranunculus with lots of textural touches. 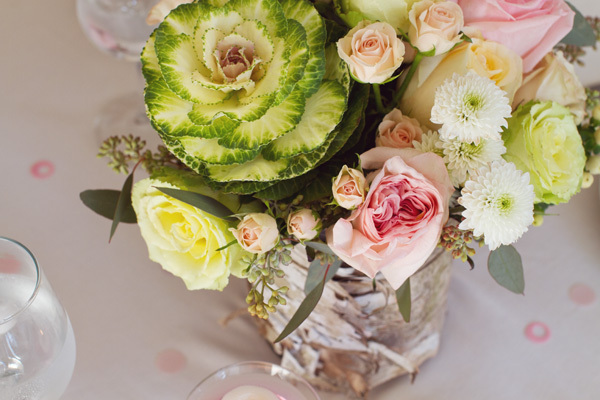 The wedding colours were buttery yellow, soft pink, silver, and green. 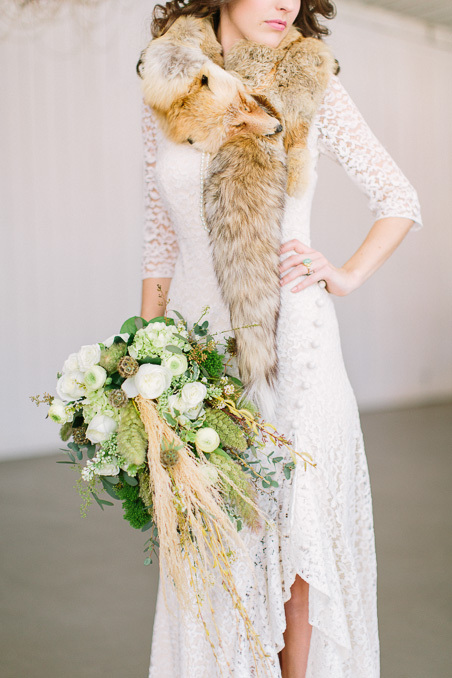 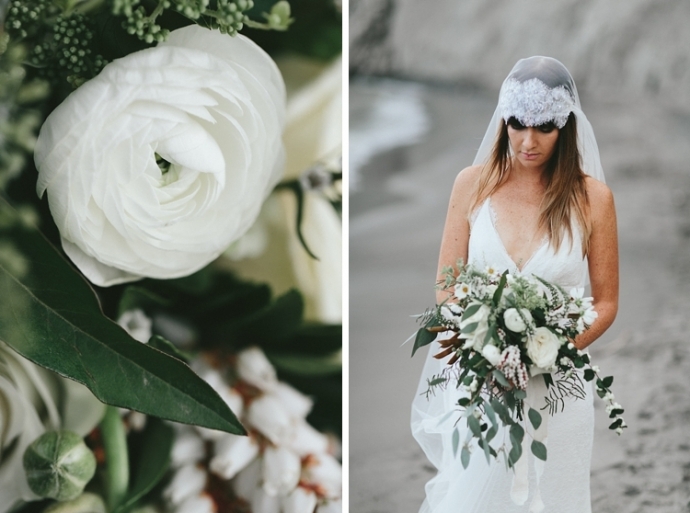 For her bouquet, the bride wanted a fuller gathered and wild bouquet that included larger blooms like roses, ranunculus and echiverea rosettes, with textural touches of blueberry branch, dusty miller, ferns, ivy, stiletto scabiosa pods, spirea, and seeded eucalyptus. 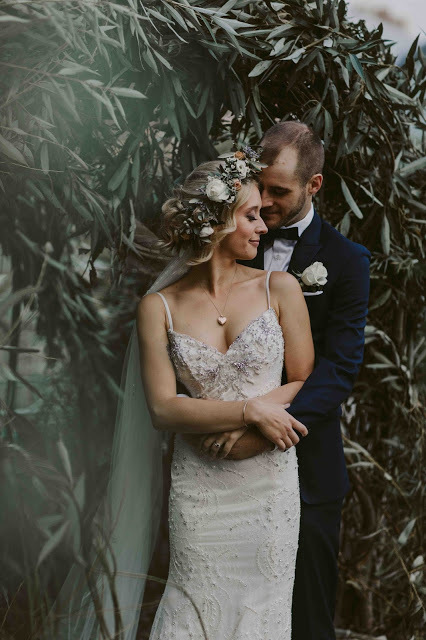 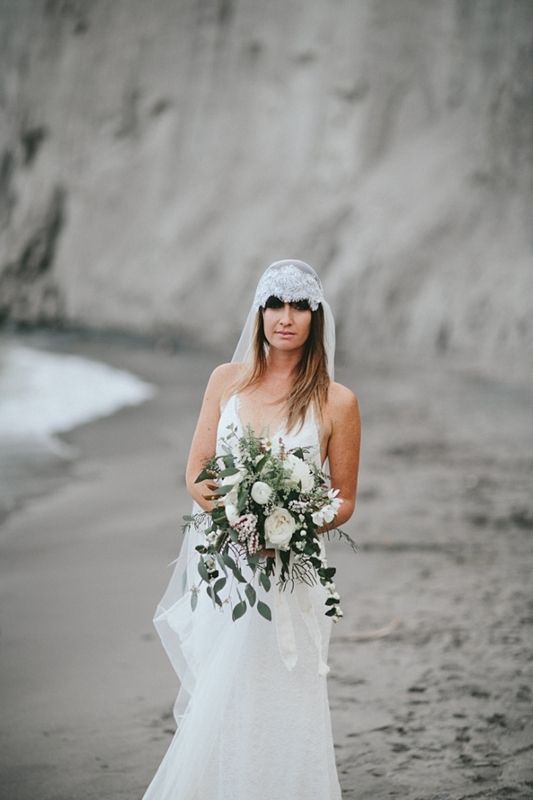 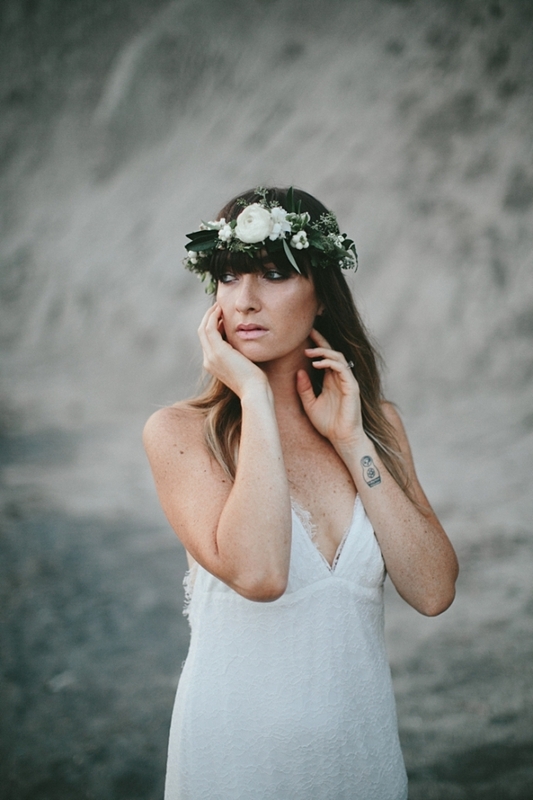 Brandon Scott Photography approached us to create a bridal bouquet and flower crown for this beach inspired photoshoot featuring All About Romance Veils from Australia. 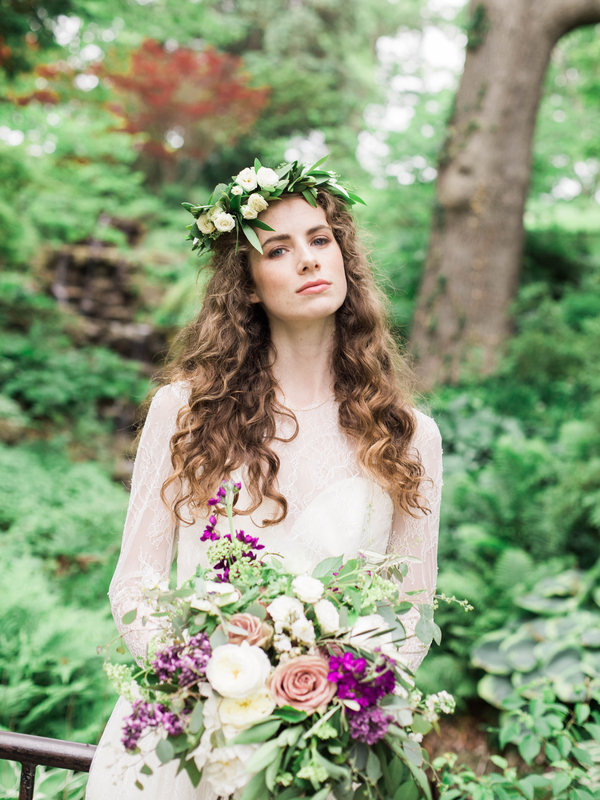 Flowers and foliages seen in this shoot include ranunculus, Early Grey roses, David Austin garden roses, pieris japonica, seeded eucalyptus, Queen Anne's lace, veronica, lace hydrangeas, cosmos, coral fern, snow berries, and seed pods. 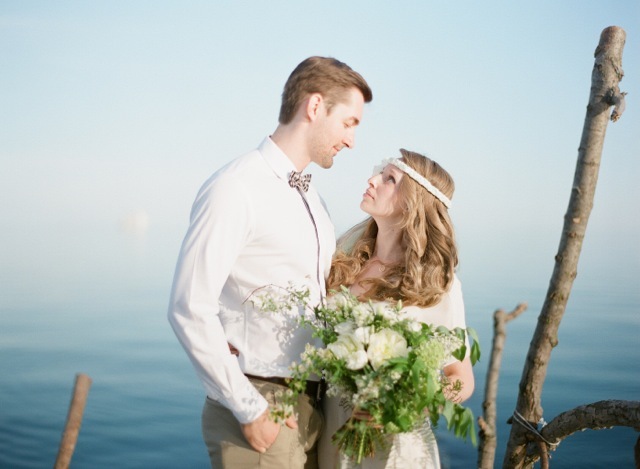 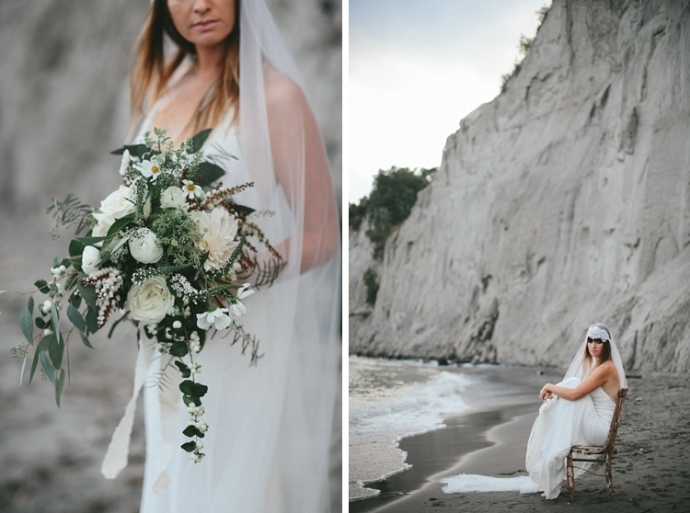 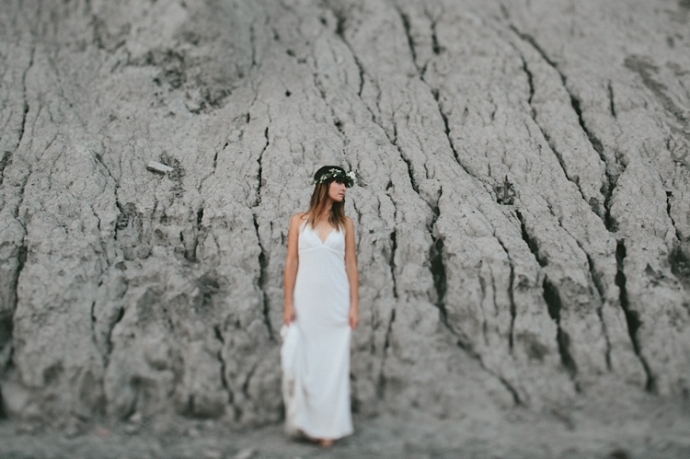 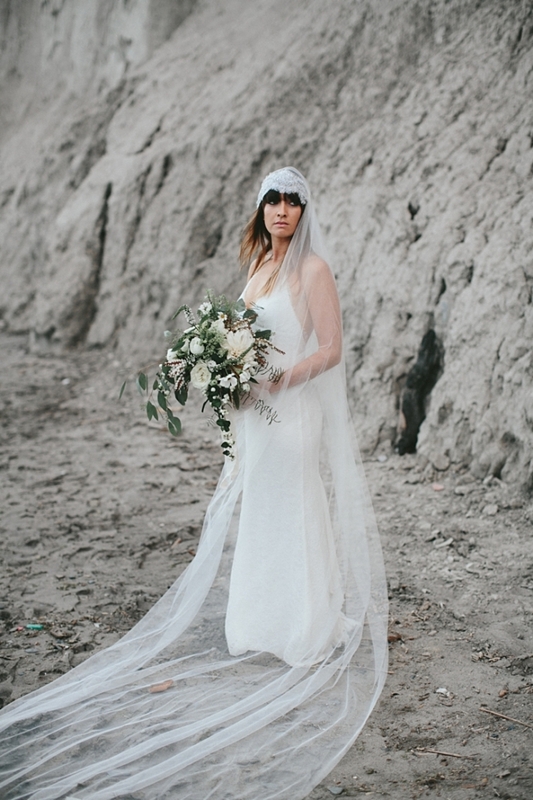 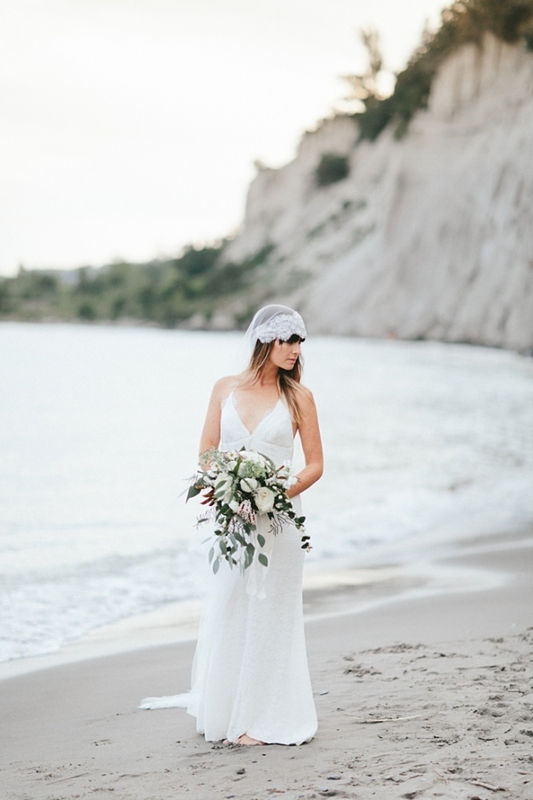 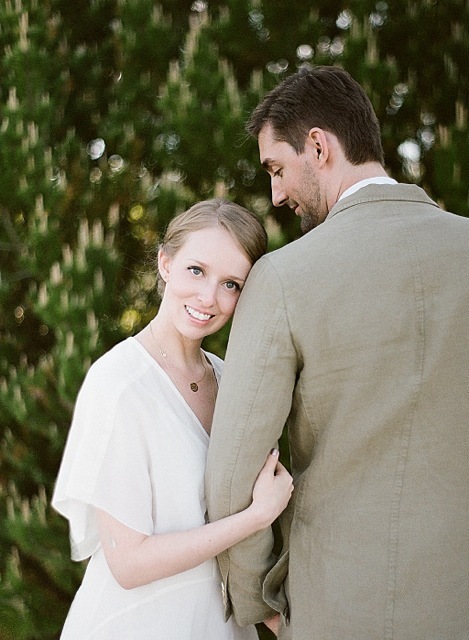 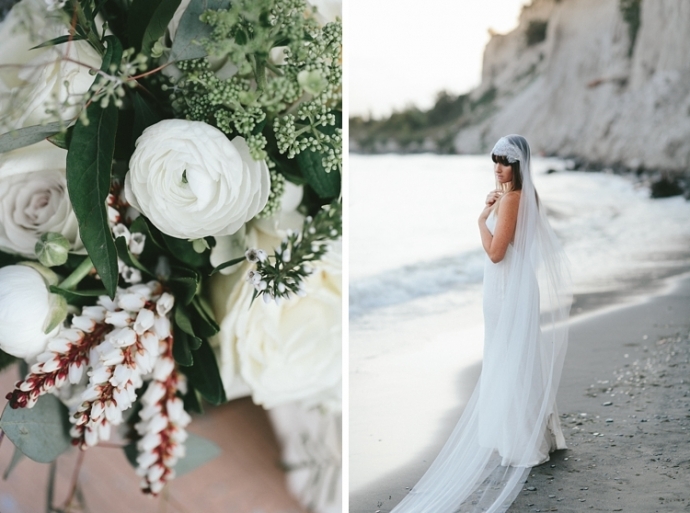 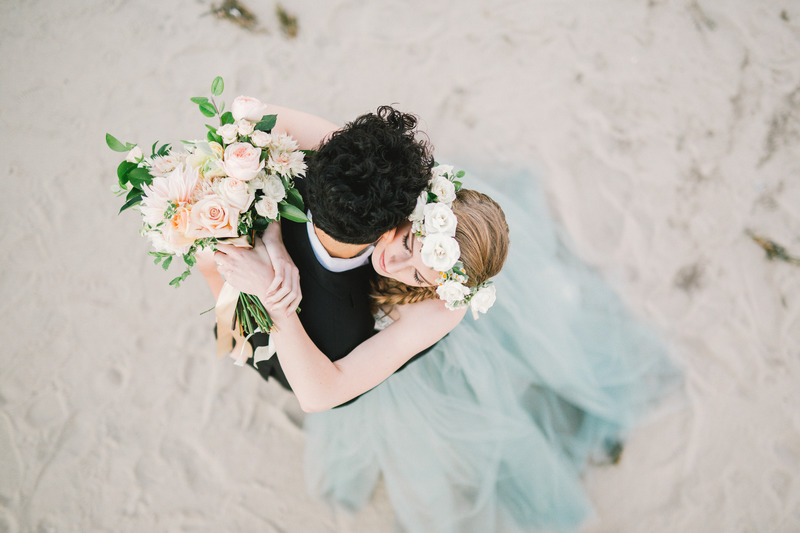 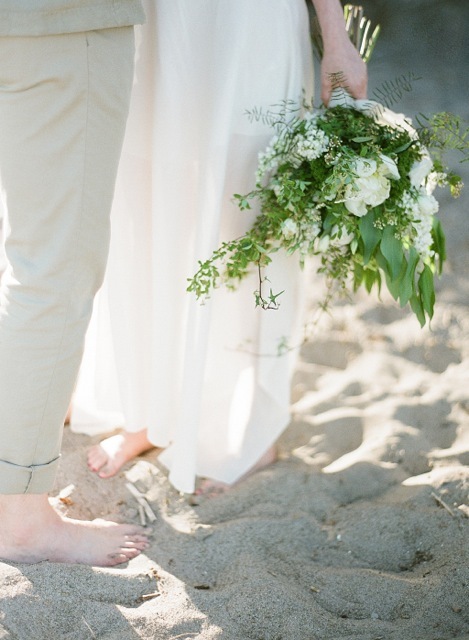 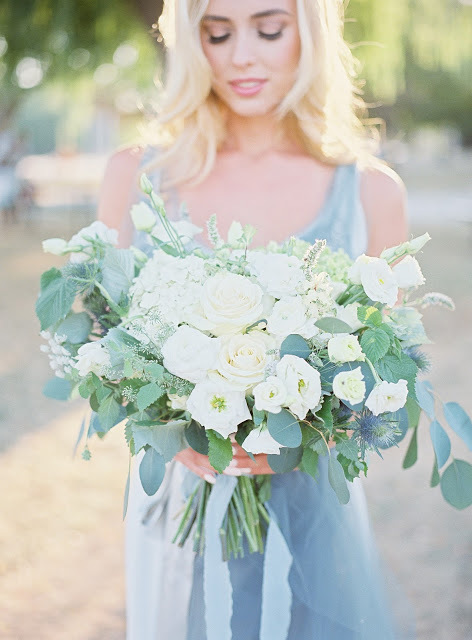 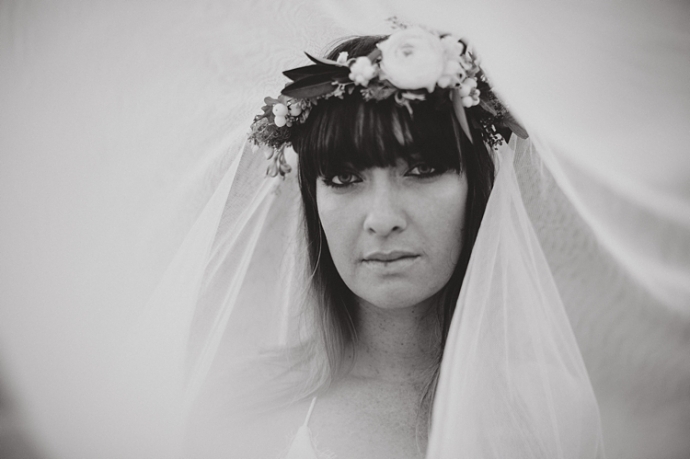 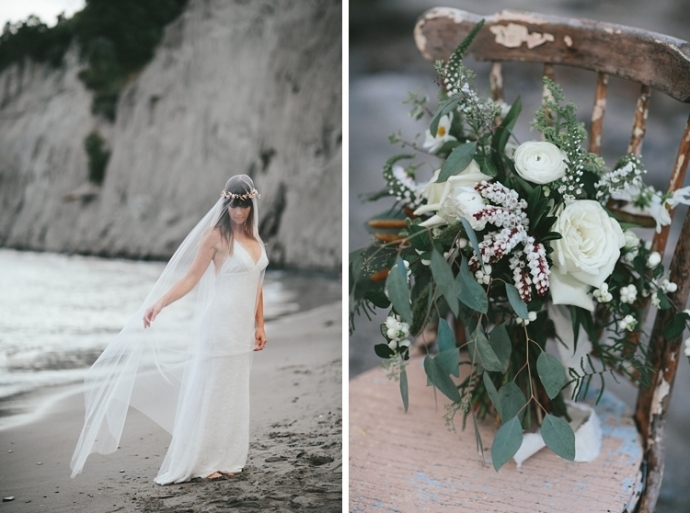 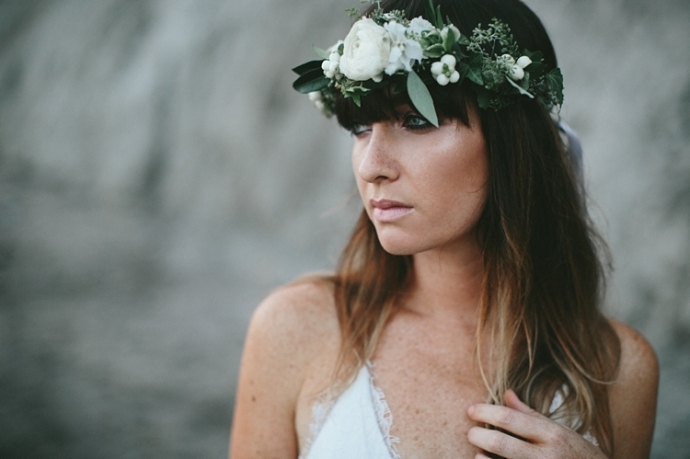 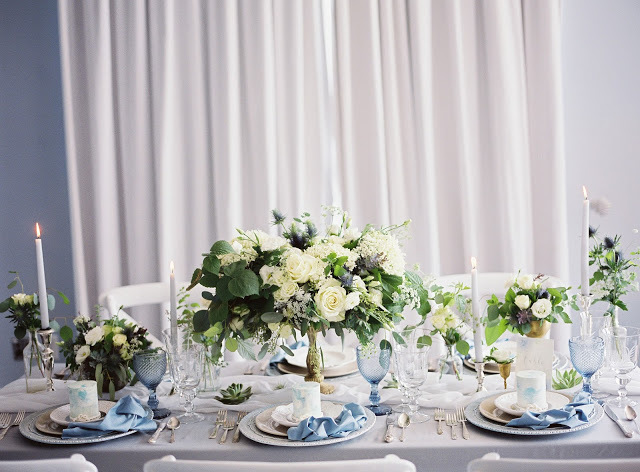 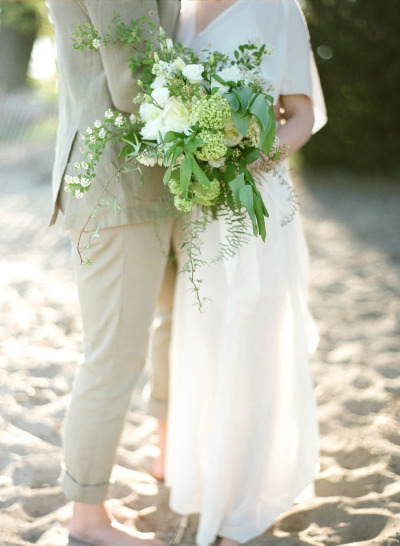 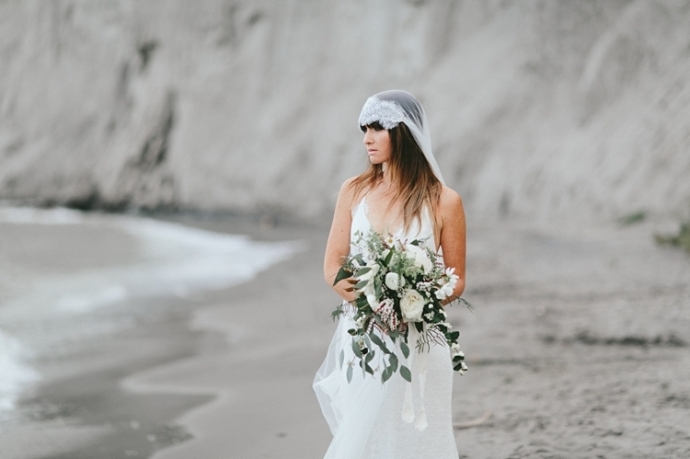 This styled wedding shoot was inspired by the beach and a neutral, cool colour palette. 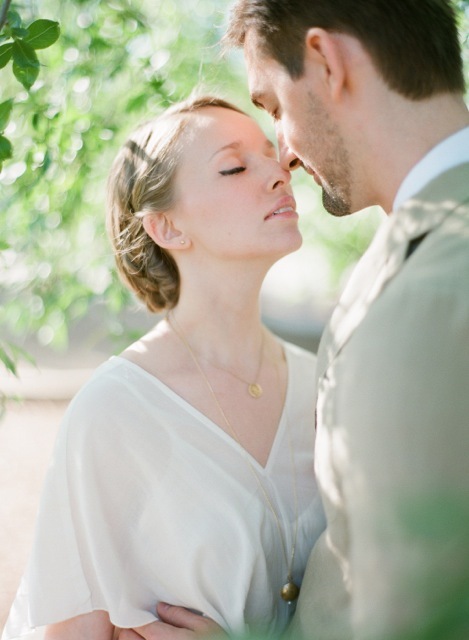 The dewy weather gives a picturesque aesthetic that fits the theme perfectly! 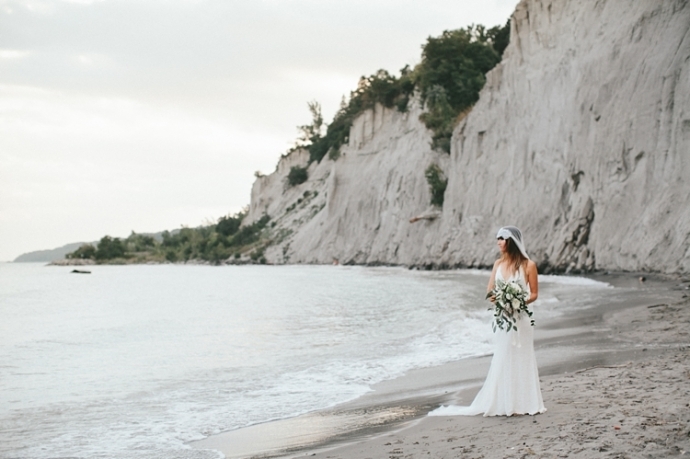 It was shot on location at the Bluffs. 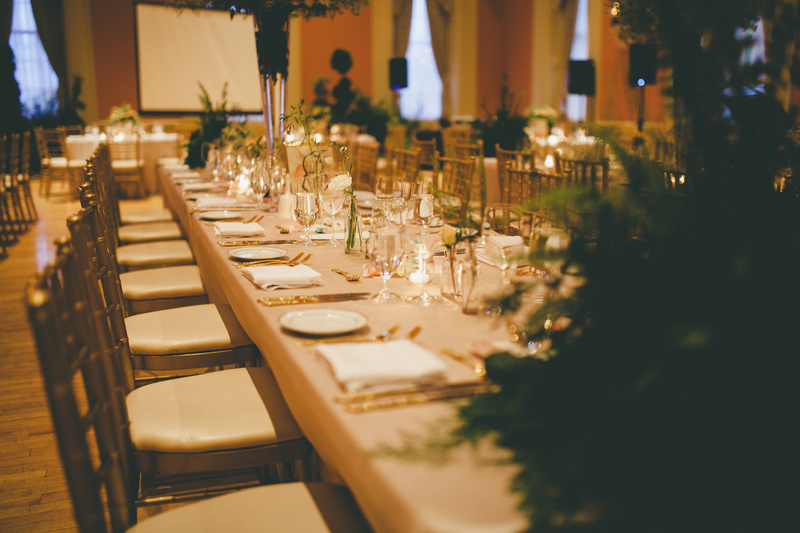 We lined the aisle with massed arrangements of various ferns and moss, bringing in an outdoors feel to this ornate room. 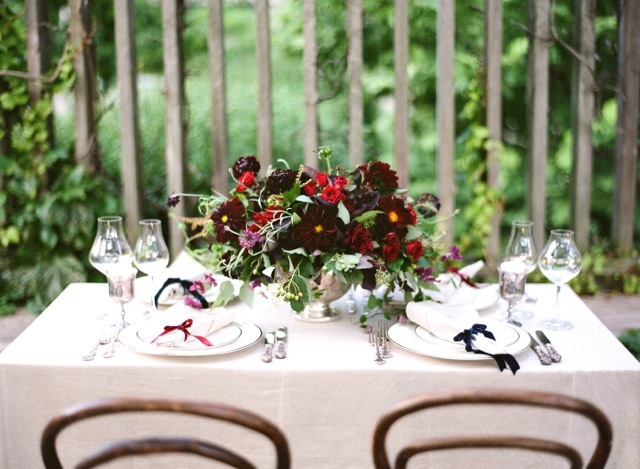 These arrangements were later moved to the ends of longer guest tables at the reception. 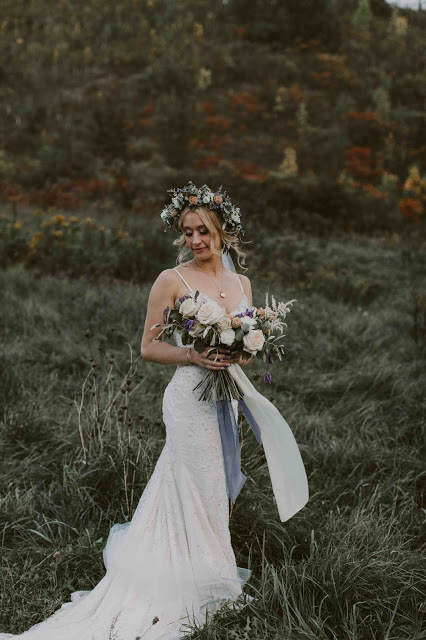 The Bride carried a loosely styled bouquet of filler flowers including astilbe, baby's breath, Queen Anne's lace, and Japanese anemones. 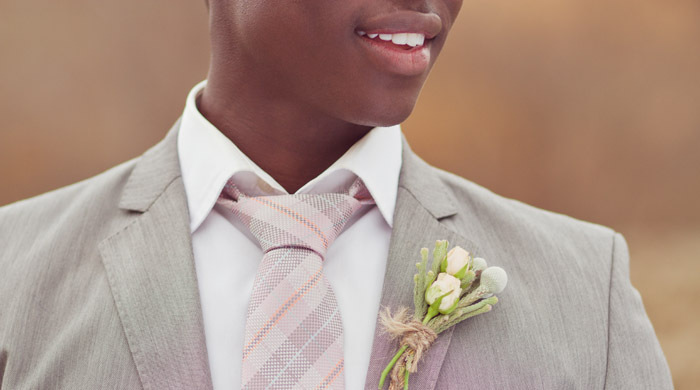 The Groom wore a boutonnière of astilbe and the groomsmen wore boutonnières with spray roses, filler flowers, and dusty miller. 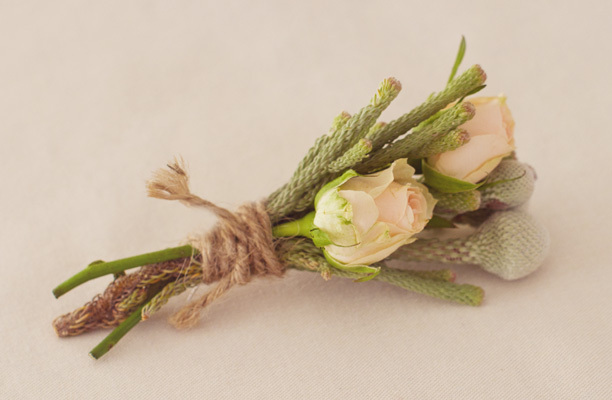 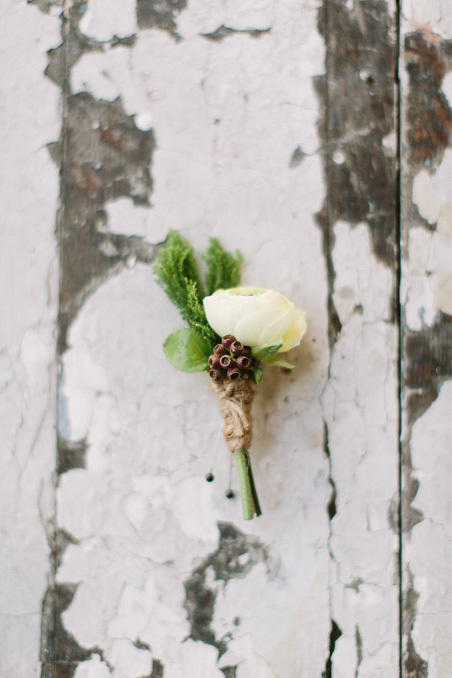 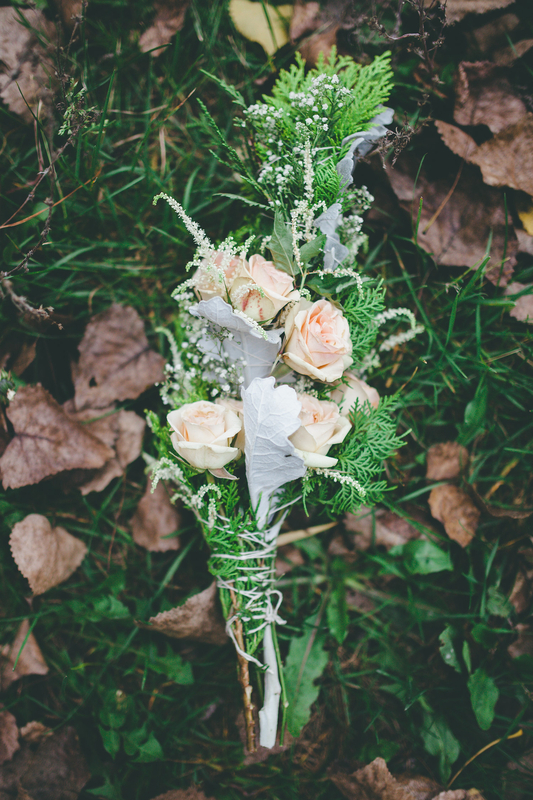 The Bridesmaids' bouquets were inspired by smudge sticks and were made with spray rose, astilbe, baby's breath, cedar, and dusty miller, which were bound with thin cotton string. 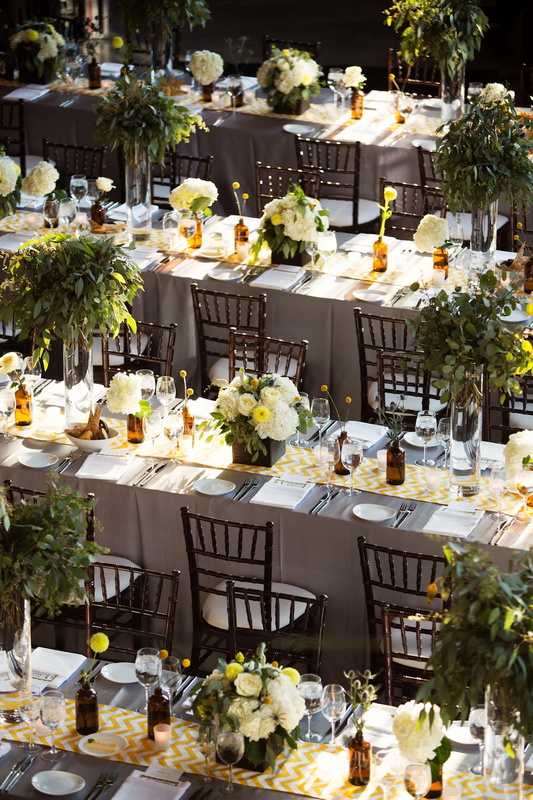 For the reception, taller vases filled with baby's breath and Queen Anne's lace were placed at the centre of each longer guest table, along with smaller vintage glass bottles filled with individual blooms like astrantia, ferns, spray roses, baby's breath, astilbe, and Queen Anne's lace dotted the length of the tables. 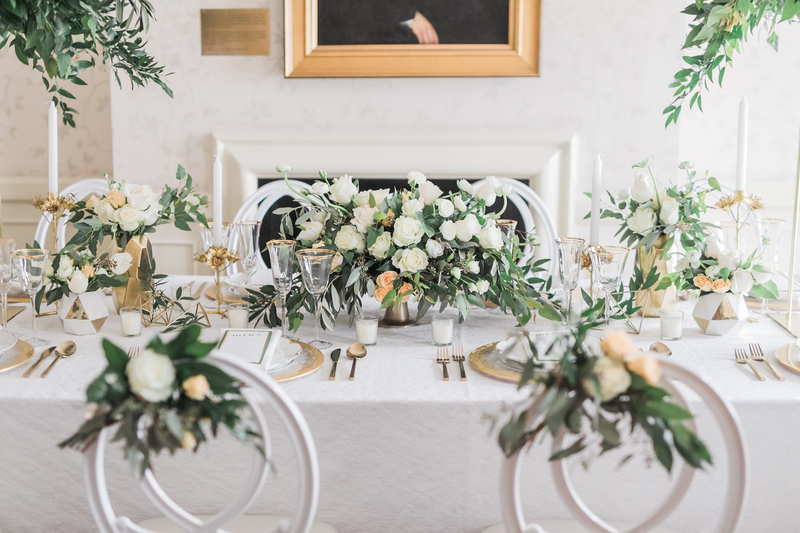 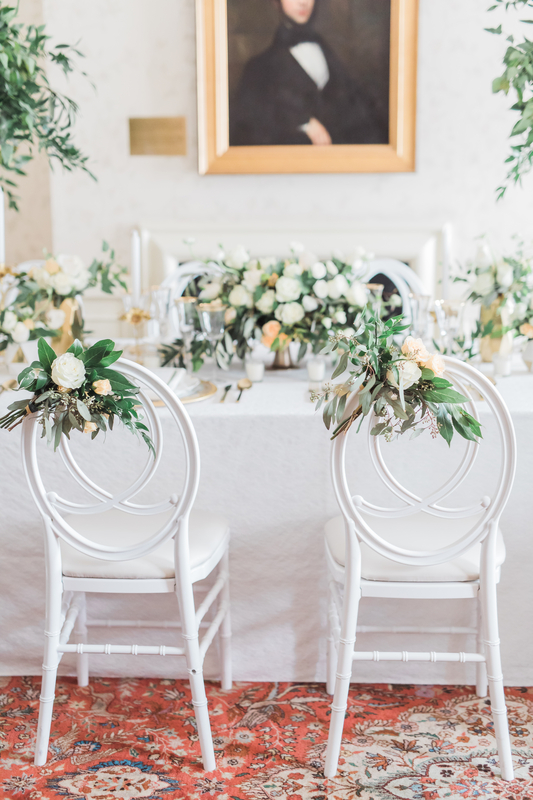 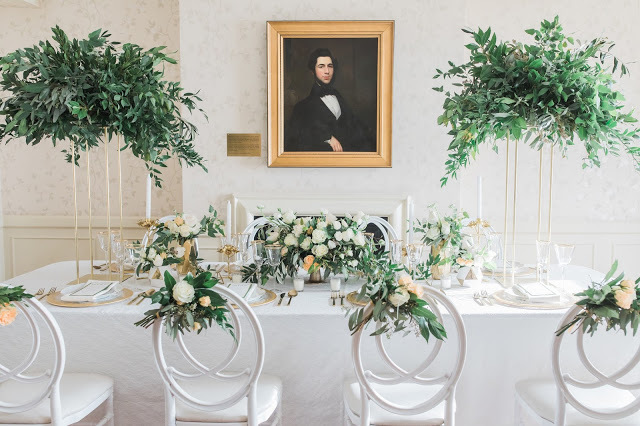 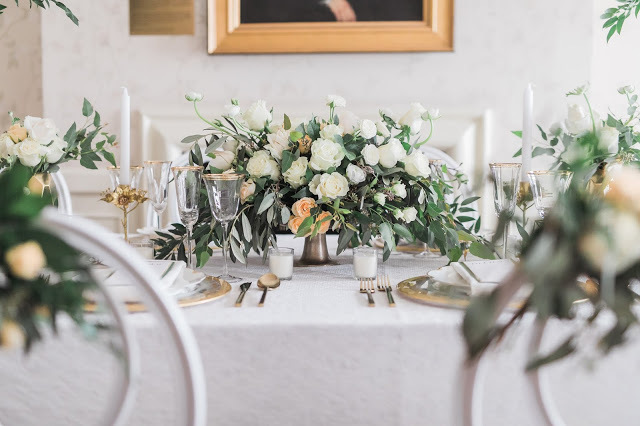 For their round guest tables that circled the room, we made loosely styled mixed arrangements of filler flowers including astilbe, baby's breath, Queen Anne's lace, spray roses, and Japonese anemones. 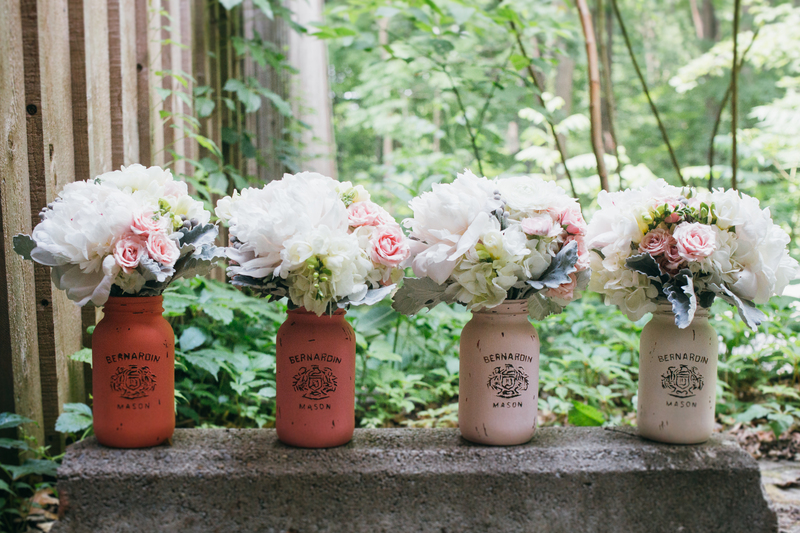 More smaller vintage bottles with blooms were placed around the venue, including the Entrance Table, Signing Table, and Cake Table. 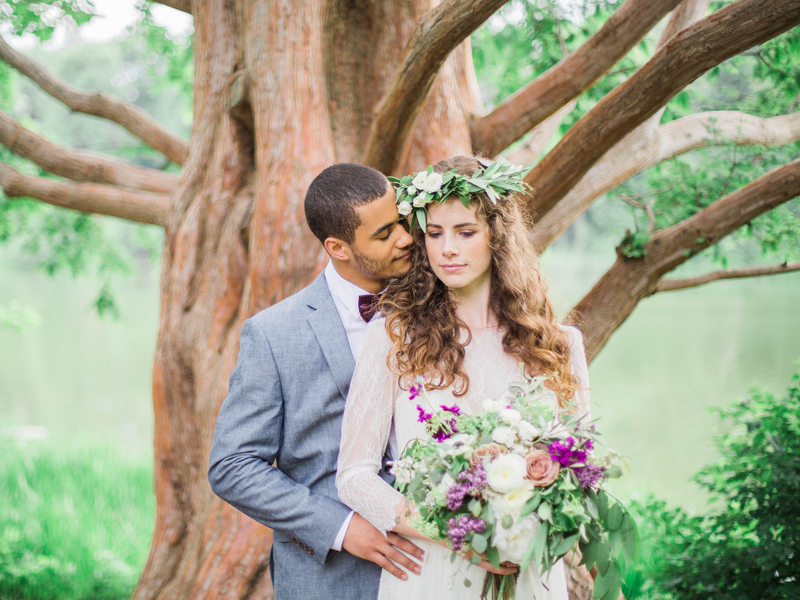 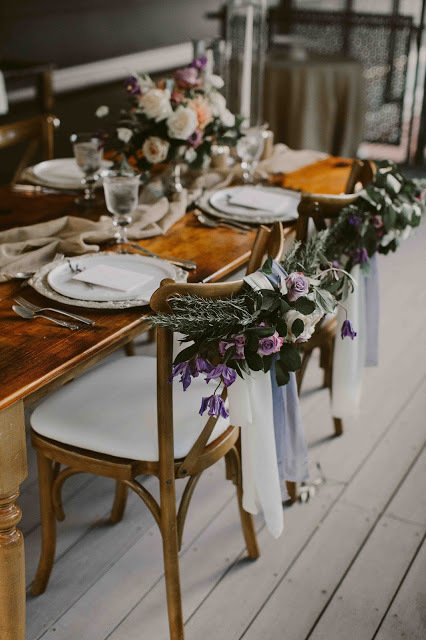 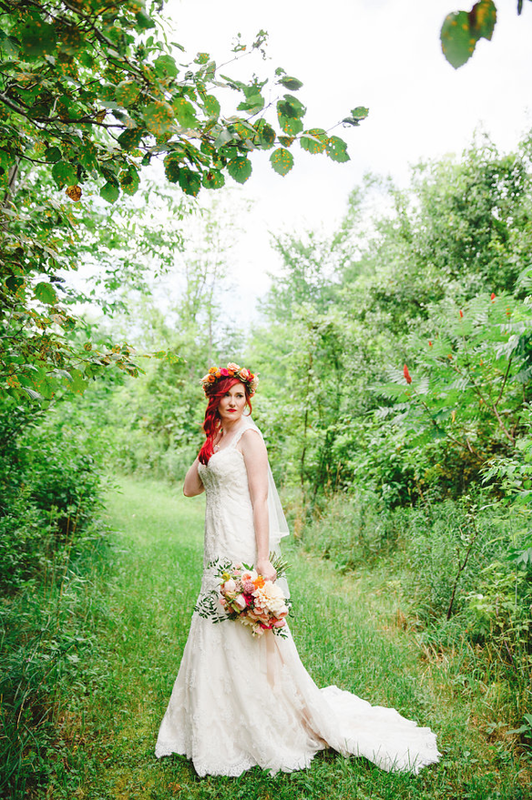 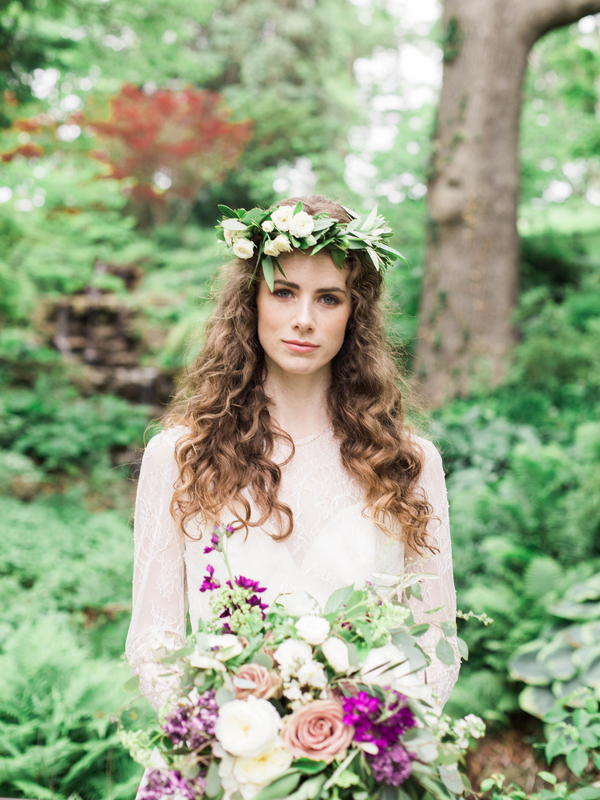 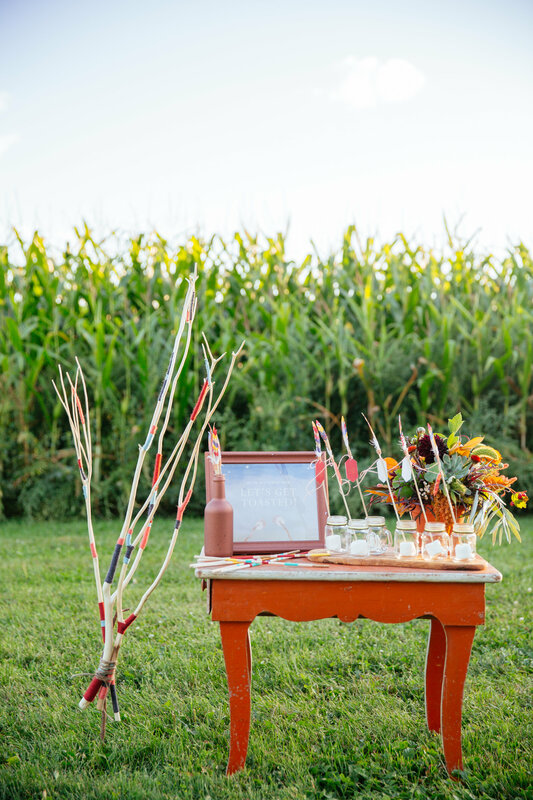 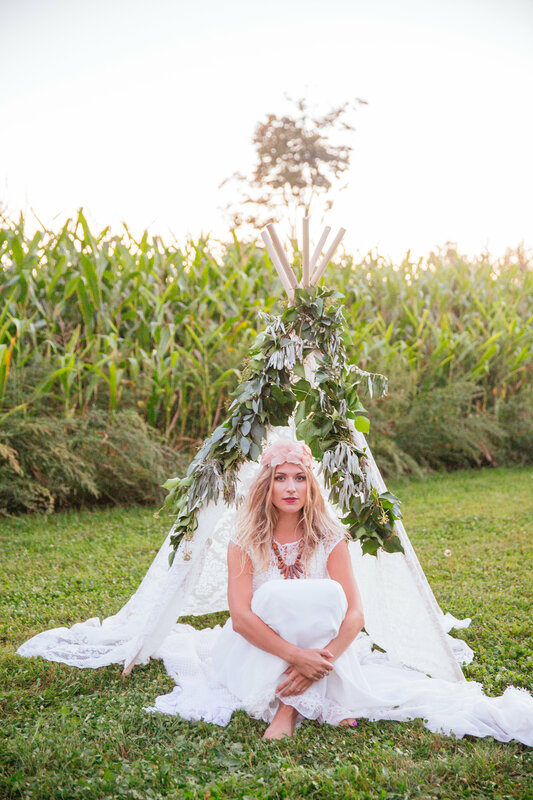 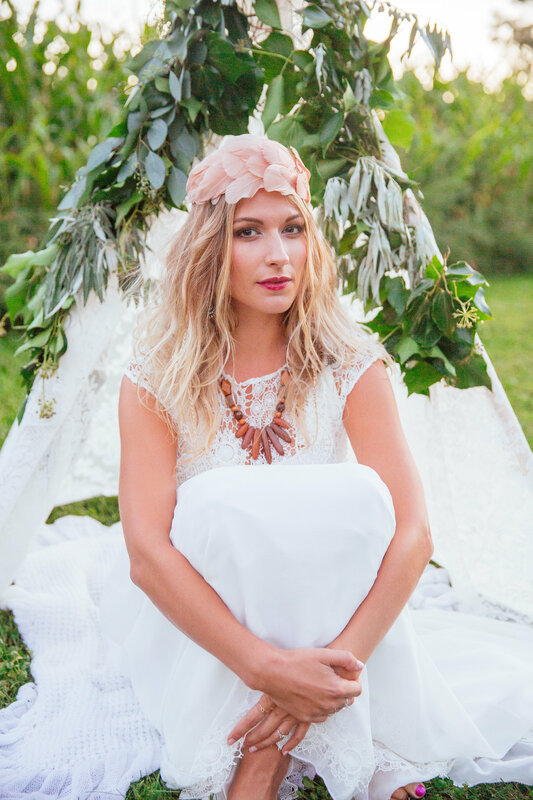 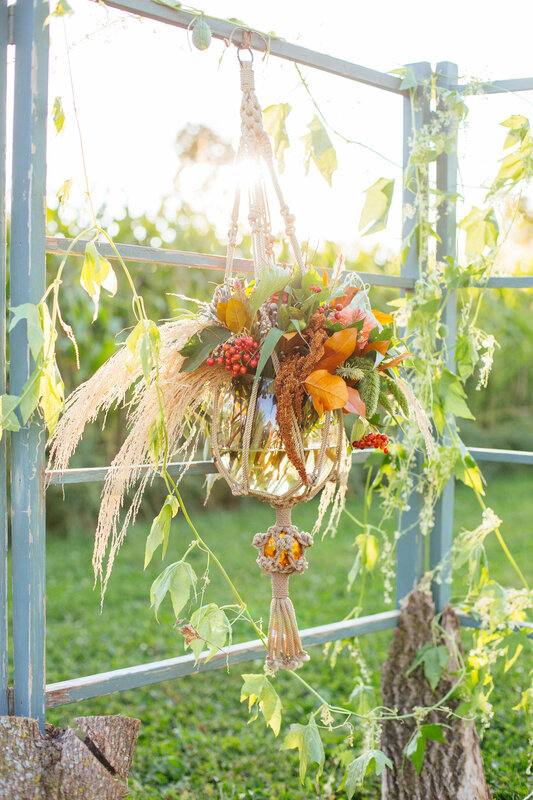 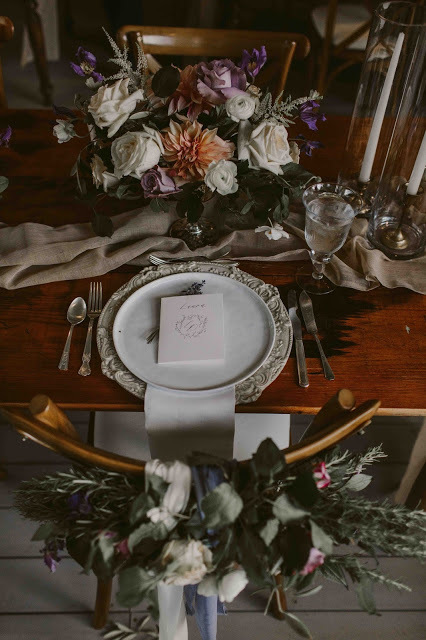 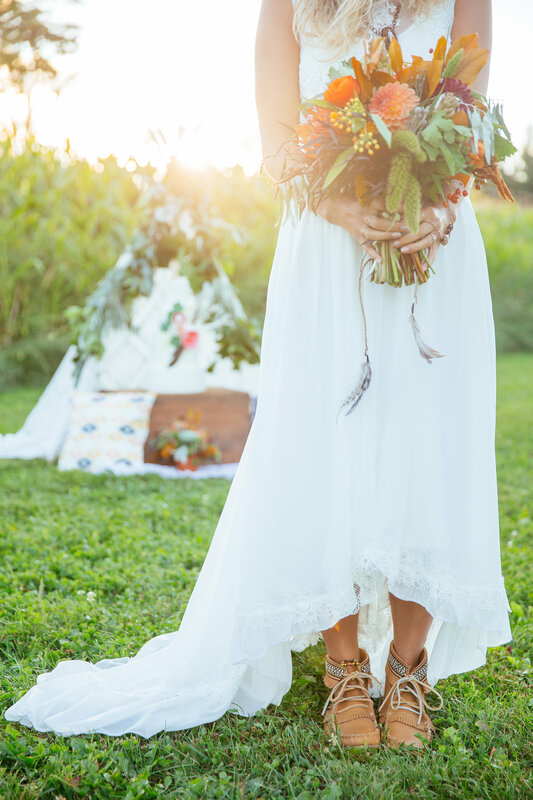 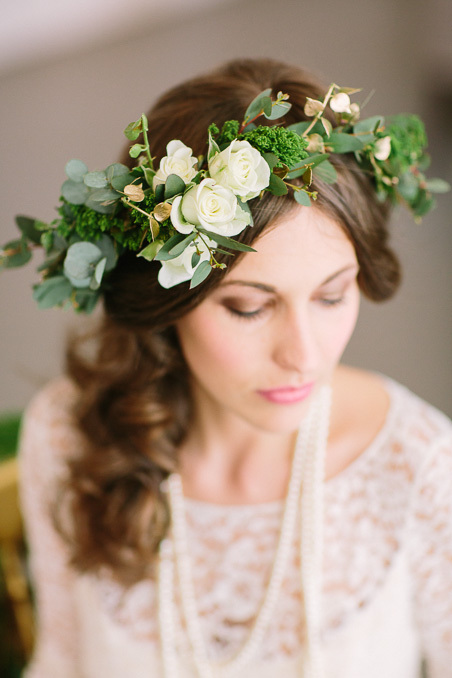 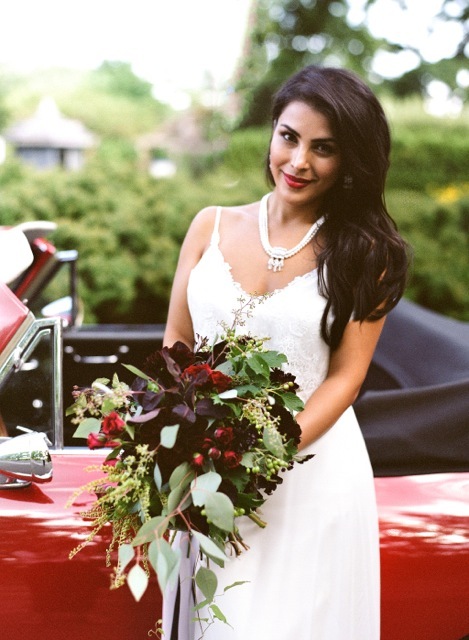 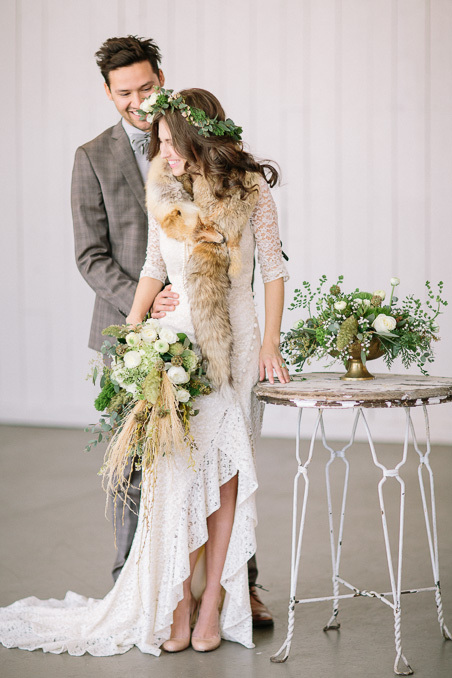 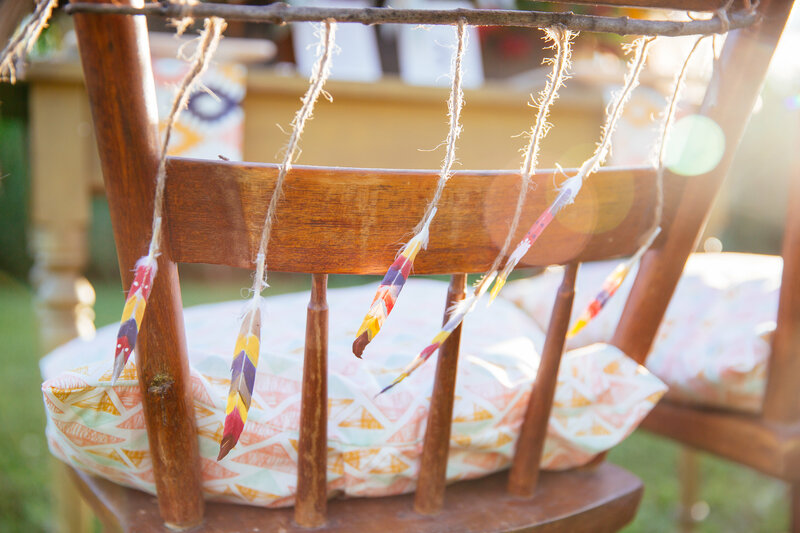 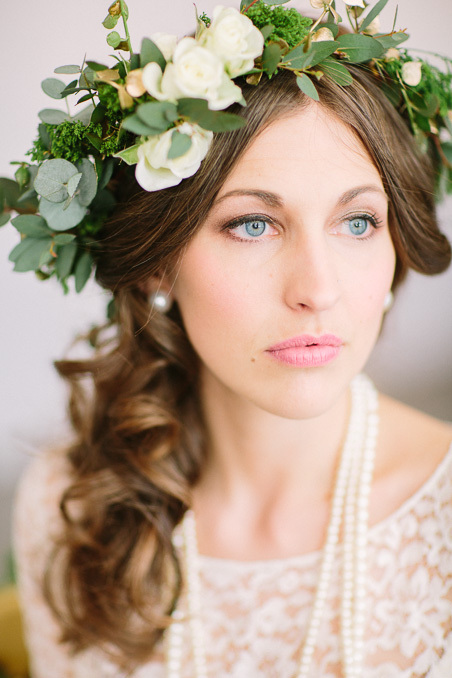 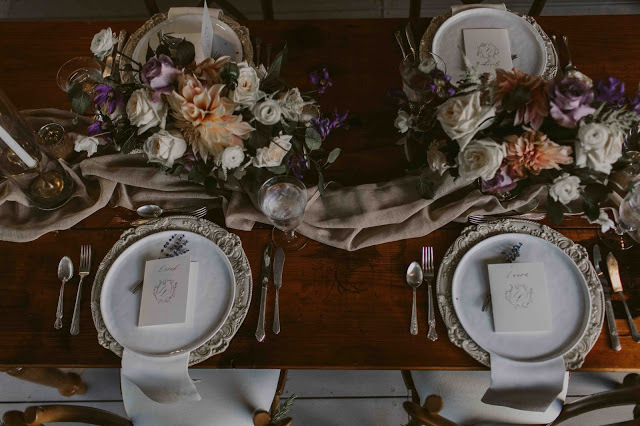 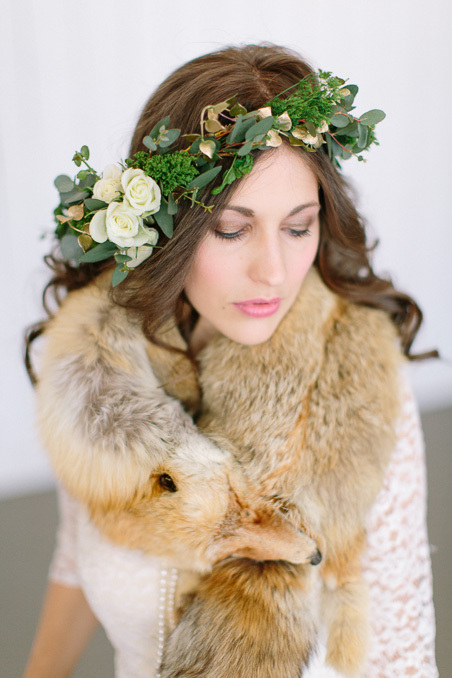 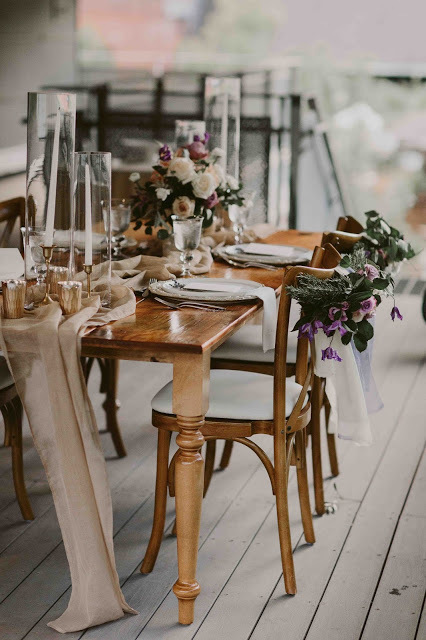 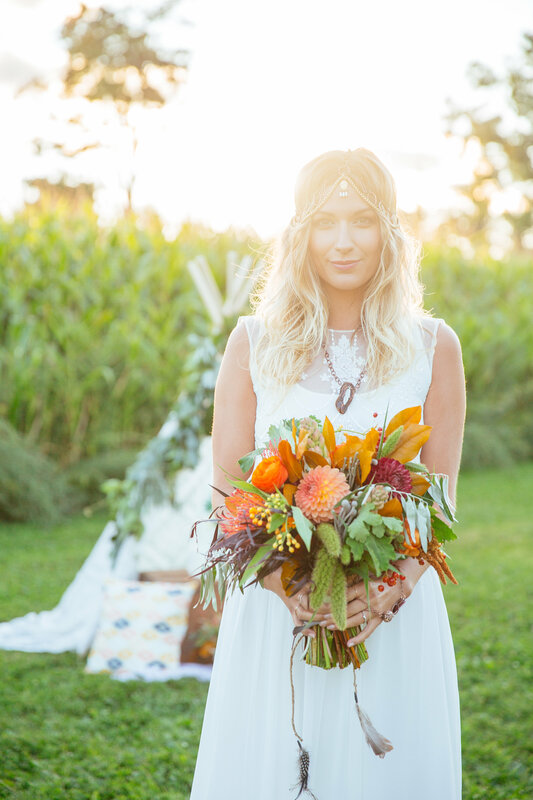 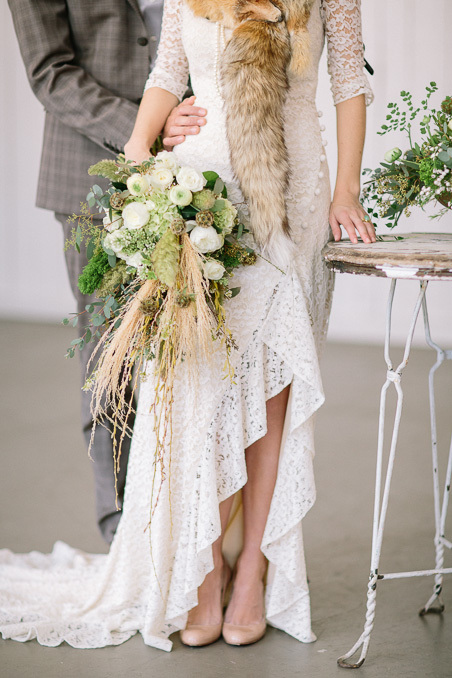 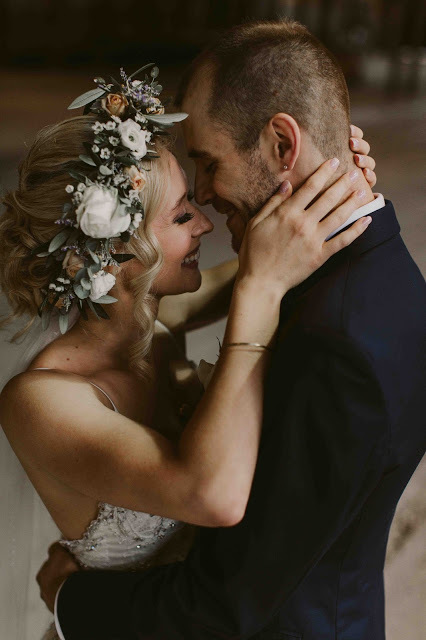 This Bohemian inspired styled shoot was set in Caledon, Ontario. 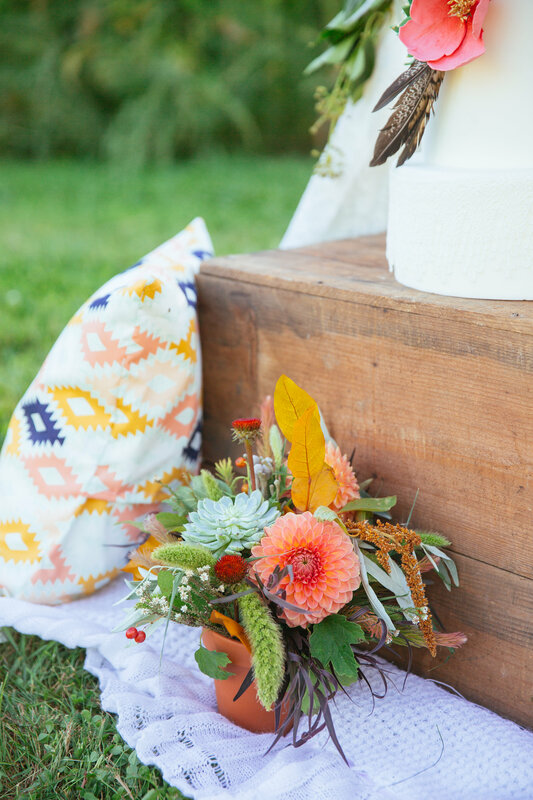 It brings together desert colours and Southwestern patterns inspiring this bridal bouquet, florals in macramé holders, foliage garlands, an oversized floral arrangement in barn board planter box, and our yarn wrapped branches.